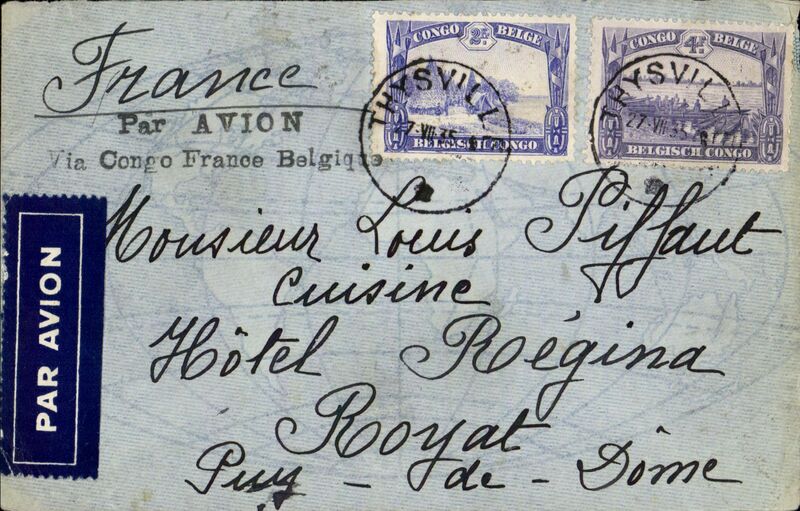 Elizabethville to Brussels, bs 19/11, plain cover franked 8.5F air, canc undated black framed 'Avion' hs, black circular Brussels "6" postman's mark on front. Exact date of postage is unknown. Carried to coast by river boat and rail as no internal Congo flights between June 1922 and April 1925. Interesting. 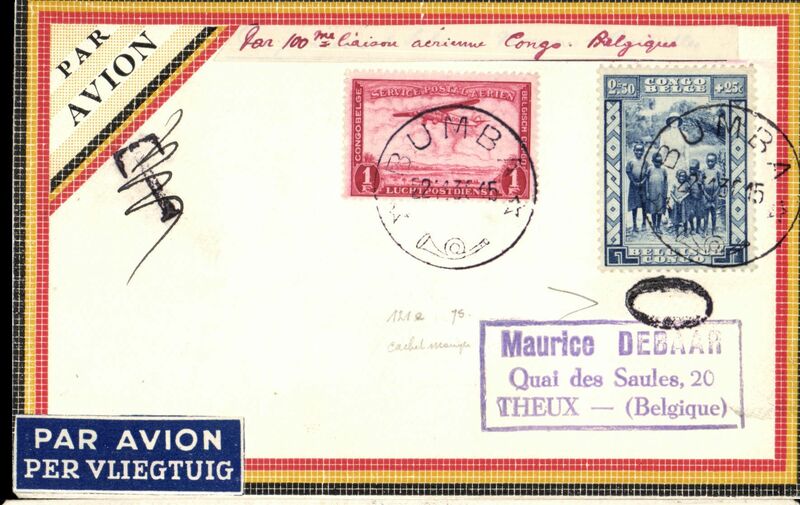 First acceptance of Congo mail for Belgium for carriege on the new Toulouse route, using Dakar instead of Casablanca, and first announced in "Avis au Publique" by C. Damien, Le Percepteur Principal at Leopoldville on 19/10/1925. 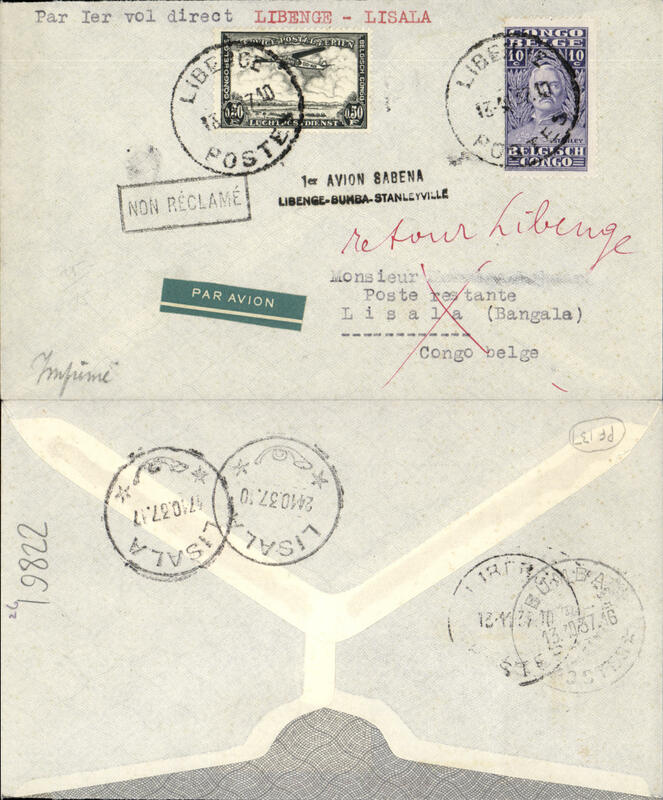 A cover addressed to Avers, Belgium, bs 23/11, Dakar 16/11 transit cds, franked 30c ordinary and 1920 air set of 4, canc Luebo cds, black boxed"Avion" hs, Flown SABENA Luebo-Kinshasha, boat Matadi-Dakar, then Latecoere to Europe via Dakar. Nice item. See Belgian Congo Air Rates 1920-1940 by F. Broeckaert. Ex Clowes. Francis Field authentication hs verso. Image. 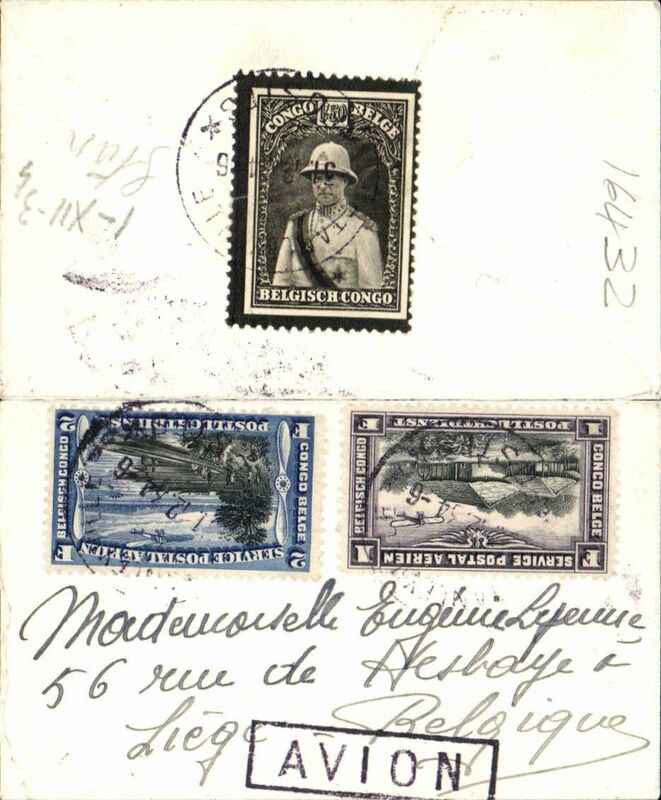 Official unfranked internal airmail, Lusambo to Elisabethville, bs 23/8, printed 'Congo Belge' corner cover, official seal of Sankuru District and black boxed 'Avion' hs. Luebo-Lusambo service opened 17/4/1928, so flown all the way. Uncommon. 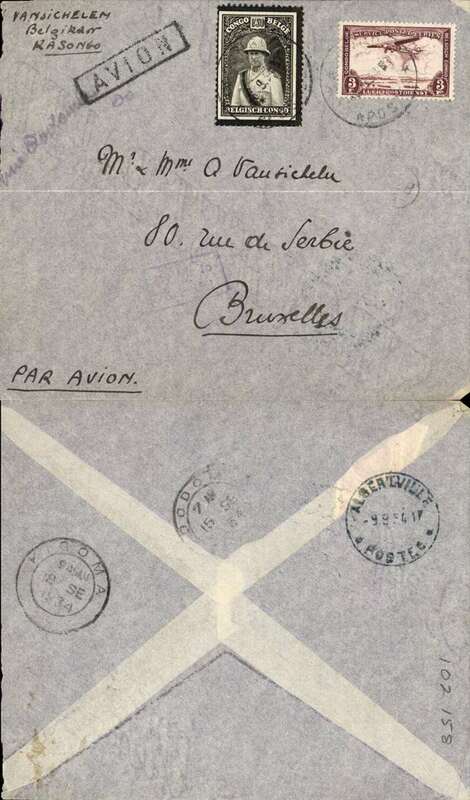 Port Franqui to Brussels, bs Jette 14/2, via Leopoldville and Boma, plain cover franked 1.50F internal airmail and 0.20F printed matter to B Belgium, black framed 'Avion' hs and blue straight line 'par Avion' hs. Carried internal flight Port Franqui-Leopoldville-Boma, then steamer to Belgium. 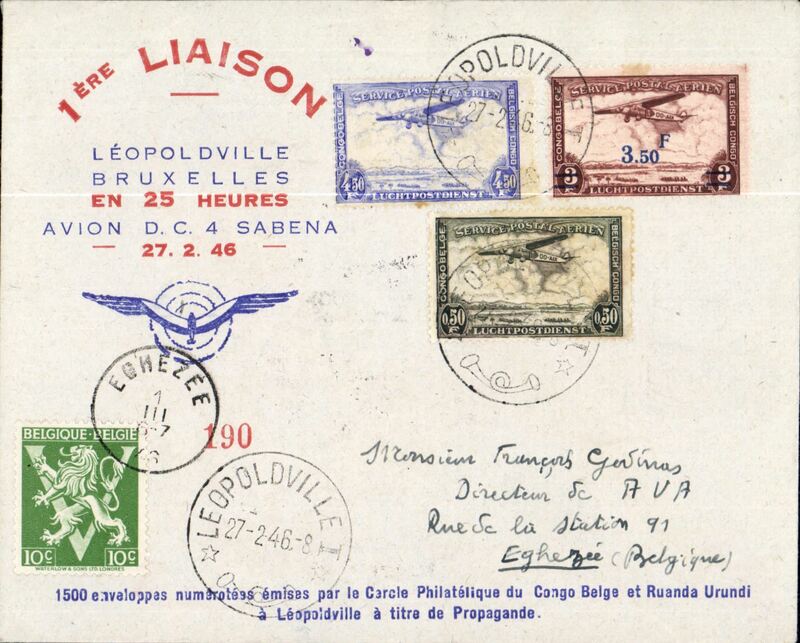 Fabry and Vanderlinden interrupted return flight, Leopoldville to Brussels (bs 1/3/31). 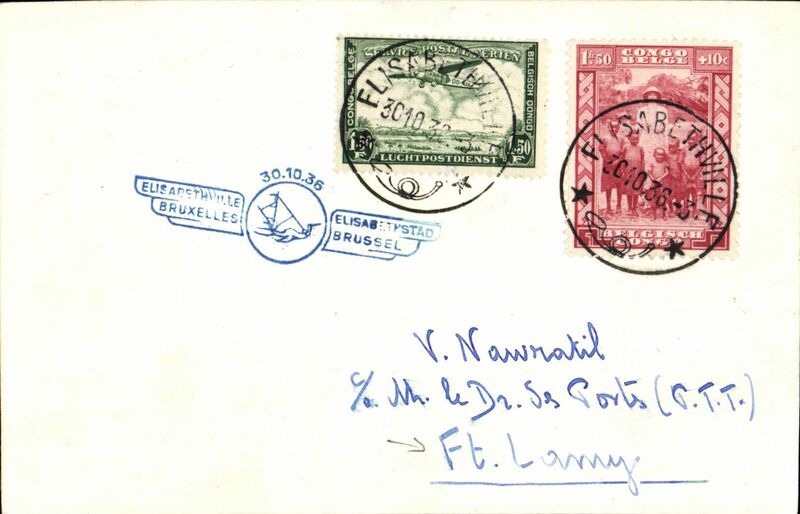 The flight return flight had to terminate at Fort Lamy where mail was forwarded by surface to Belgium, Ni 301217. 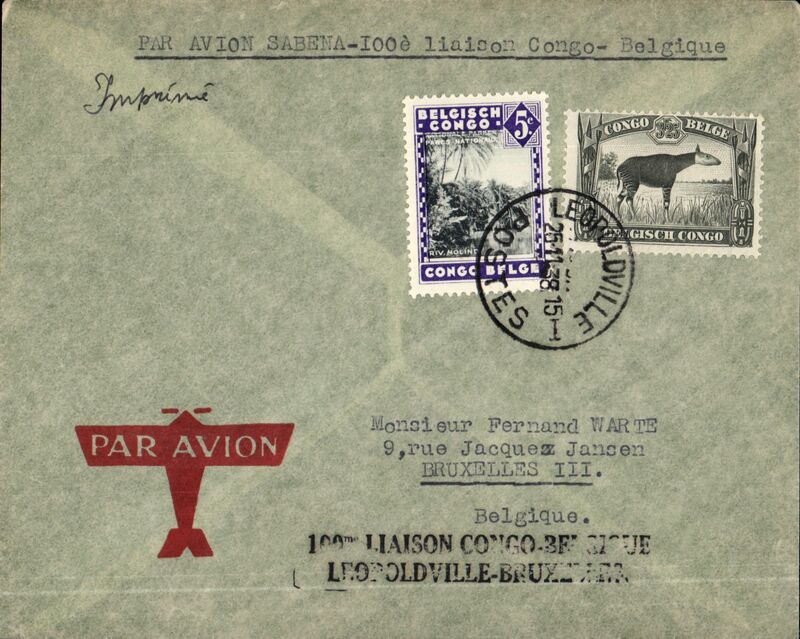 Official cover from Director General of Congo Posts and Telegraphs, embossed logo on flap, addressed to Director General of Posts, Brussels, correctly rated Congo 5f Air+ 1F, typed "Par Avion/Laison Belgique-Congo", blue/white etiquette BCO-A-1, rated rare by Mair. Nice item with a particularly good provenance. Image. 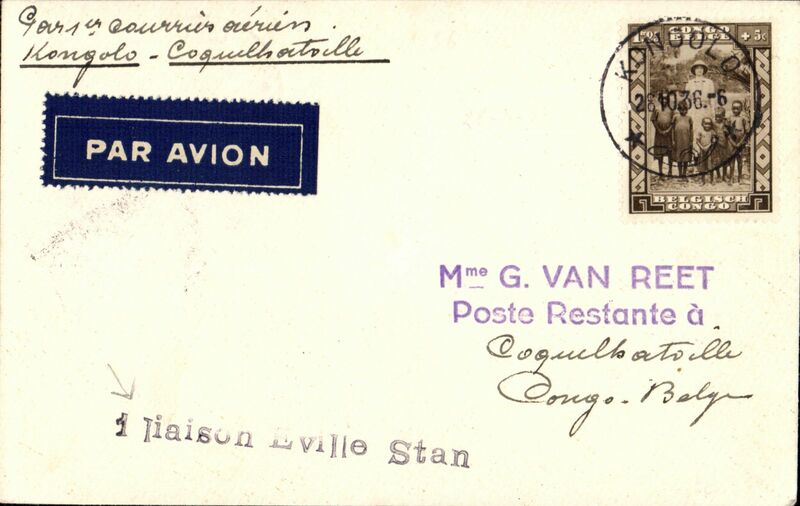 Elisabethville to Prague, Czechoslovakia, registered (label) PPC franked 4.50F, black boxed 'Avion' hs. Surface to Boma (1070 miles), then river/sea to Dakar, then Aeropostale flight to Marseille, then surface to Czechoslovakia. 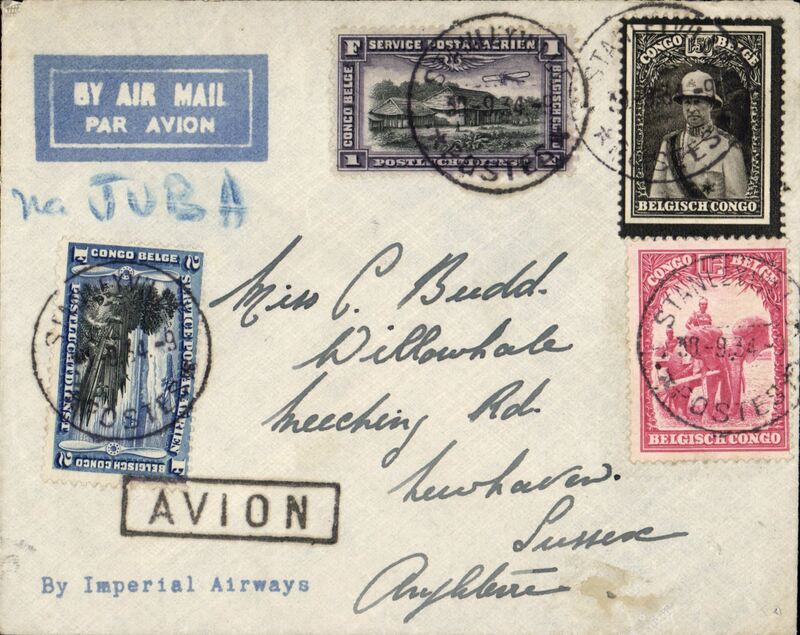 The Imperial Airways connection, Aketi to Brussels, via Aba 9/9/transit cds, commercial corner cover, franked 9.5F, violet framed "Par Avion, Via Juba" hs', carried by road to Juba, then Imperial AW northbound Africa service to London. Damage verso, see scan, but an interesting cover nonetheless. 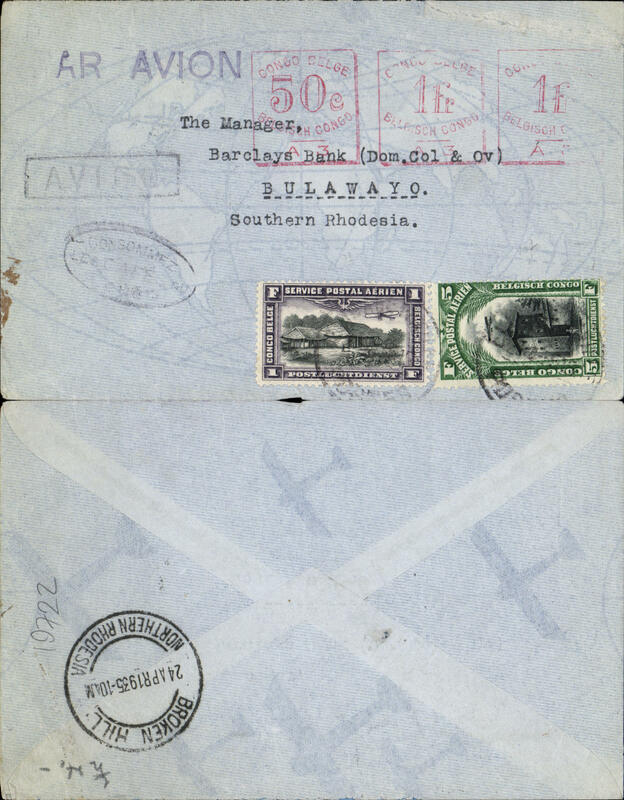 Congo-South Africa, Jadotville to Kimberley, via Elizabethville 23/2 and Broken Hill 24/2, plain cover franked 4F air and 2F ordinary, black framed 'Avion' hs. To Elizabethville by rail, to Broken Hill by Aero Club de Katanga, and by Imperial Airways AS103 to Kimberley. Nice routing. Non invasive ironed horizontal crease. 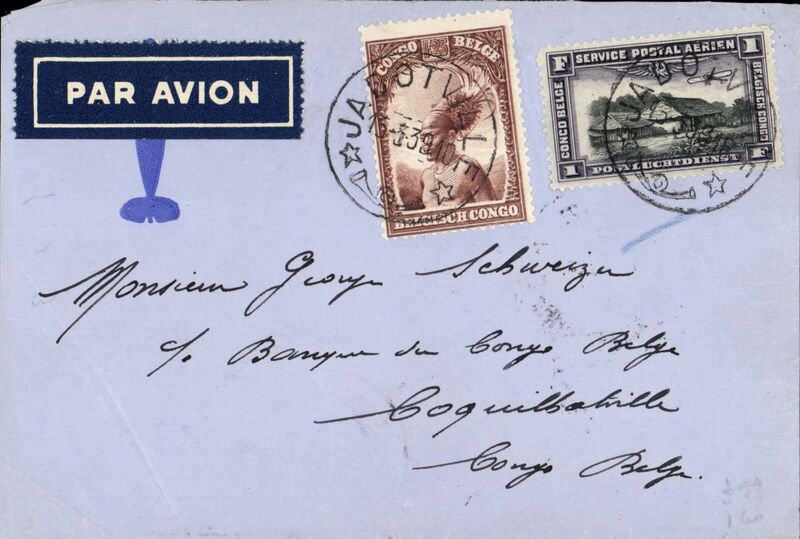 The Imperial Airways connection, Costermansville (NE Congo) to Bouges, France, bs 4/2, via Rutshuru 27/1 and Kampala 27/1, cover franked 8F canc Costermansville cds, black boxed 'Avion' and 'Avion', black/grey airmail etiquette, carried by road to Kampala, then Imperial AW northbound Africa service to Paris or London. Great routing. 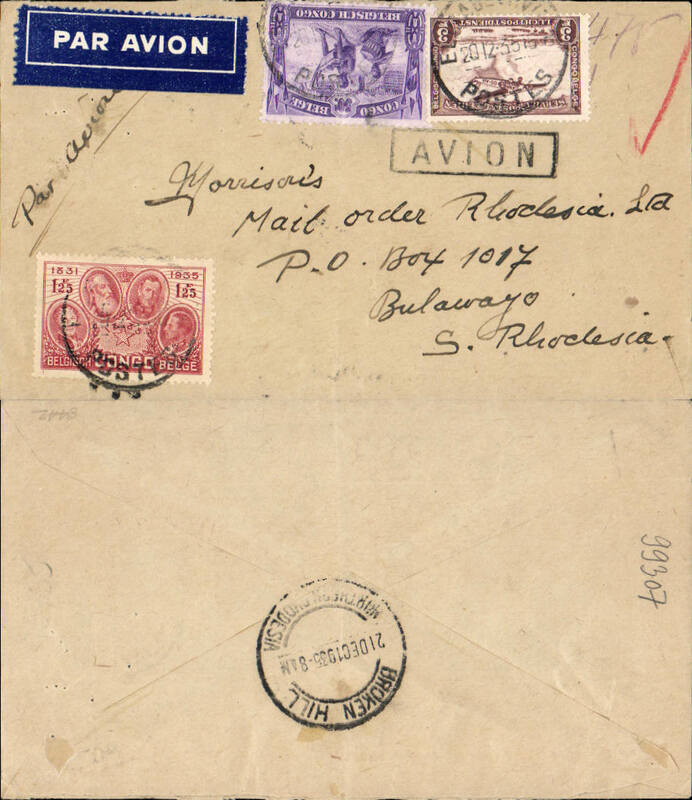 First acceptance of mail from the Congo for Nyasaland, bs Limbe 9/3, via Broken Hill 8/3, and Blantyre 9/3, plain pale grey cover franked 3F airmail plus 2.5F overseas postage, canc Elisabethville cds, black boxed 'Avion' hs, violet st line "First Official Air Mail" cachet, black "S.Rhodesia-Nyasaland" hs, black boxed 'Avion' hs. Carried from Elisabethville to Broken Hill by Aero Club de Katanga, then to Salisbury by Imperial Airways, then Salisbury-Blantyre on the return F/F of the new RANA service. A rare item in fine condition. Only 4 flown, see Godinas F, 1951, p133. 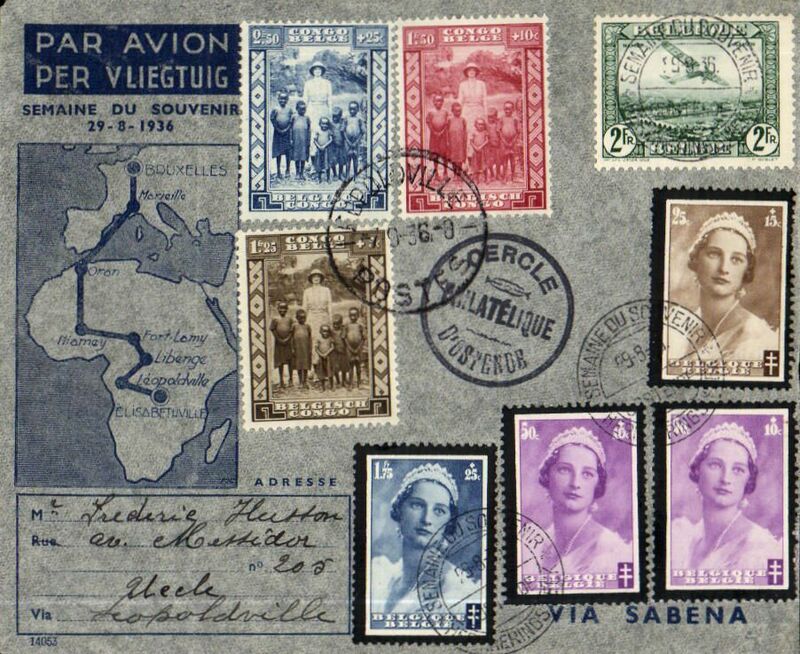 Kasongo to Brussels, via Albertvill 9/9, Kigoma 12/9 and Dodoma 15/9, plain cover franked 4.50F, violet boxed "By Air to/Brindisi" jusqu'a applied in Dodoma, back boxed 'Avion' hs. Overland to Albertville on Lake Tangnyika, boat to Kigoma, rail to Dodoma, the OAT by IAW Cape own-London service.Great routing. 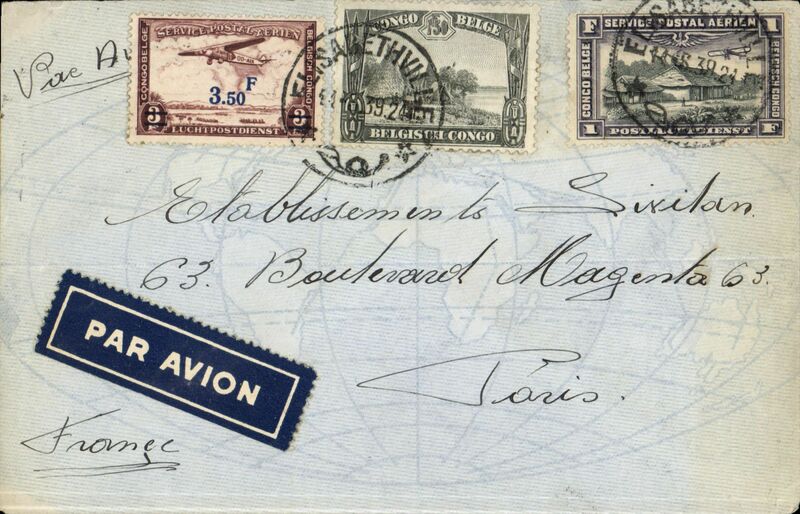 Eastern Congo airmail, Stanleyville to London, printed 'Imperial Airways' imprint etiquette corner cover, franked 5F50, black framed 'Avion' hs, ms 'Via Juba'. By road to Abba and Juba to connect with IAW flight AN187 leaving Juba 6 Oct arriving Croydon 11 Oct.
Return Raid Rubin record flight in DH Comet by Waller & Franchome, from Belgium-Congo in 22hrs, Brussels to Leopoldville, bs 22/12, boxed red special flight cachet, verso uncommon red/yellow/blue/white Imperial Airways vignette 'Utilizes les Lignes/Belgique Congo'. Carried on from Belgium Congo-Belgium in 21hrs. 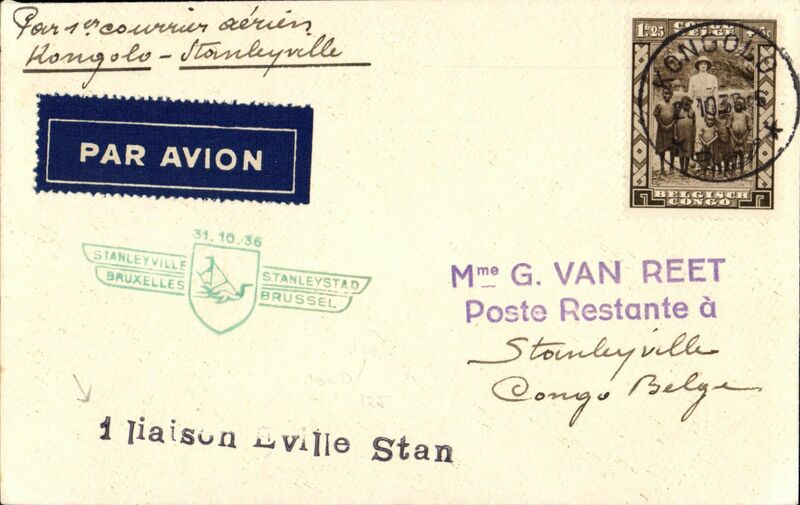 Imperial Airways involvement, Stanleyville to Liege, Belgium, ms note inside arrived 10/1/35, small cover 10x6cm, franked 3F air on front and 1F50 King Albert mourning stamp verso, black boxed 'Avion' hs. Carried 550km by road to Aba and further 260km by road to Juba, then Imperial AW AN200 service to Brindisi, finally rail to Liege. Aero Club de Katanga/ Imperial Airways, PPC franked 3F air and 1.50F ordinary, flown from Elizabethville to London, no arrival ds, via Broken Hill, 20/2 transit cds on front, also black boxed 'Avion' hs. Carried by the Aero Club de Katanga regular feeder service from Elizabethville to Broken Hill, then by Imperial Airways northbound service London. Verso fascinating B&W picture of Leopoldville taken from the air. F/F SABENA, Coquilhatville to Brussels, bs 8/3, registered (label) commercial printed bank cover carried on the return of the first regular F/F SABENA flight by the aircraft "Edmond Thieffrey" from Leopoldville via Coquilhatville, Bangui--Fort Lamy-Zinder-Niamey-Gao-Reggan-Colomb Bechar-Oran -Marseilles, franked Belgium Congo 14F stamps, violet framed bilingual French/Flemish F/F cachet, ms 'F/F SABENA-Alger', but should be F/F SABENA-Oran (Air Afrique went via Alger). 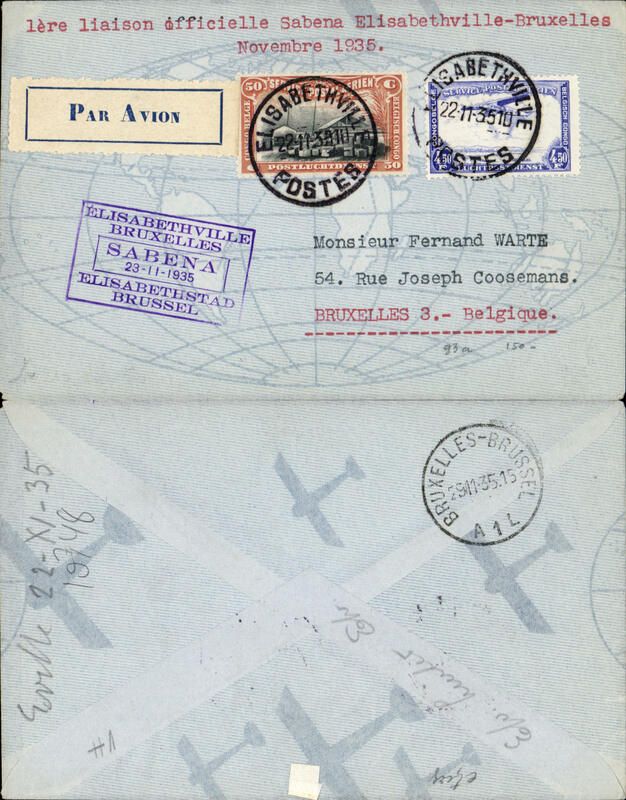 F/F SABENA, Lisala to London, no arrival ds, via Coquilhatville 3/3 and Brussels, bs 8/3, registered (label) commercial cover carried on the return of the first regular F/F SABENA flight by the aircraft "Edmond Thieffrey" from Leopoldville via Coquilhatville, Bangui--Fort Lamy-Zinder-Niamey-Gao-Reggan-Colomb Bechar-Oran -Marseilles, franked 10F Belgium Congo stamps, inc block 9x Paysage 60c verso, violet framed bilingual French/Flemish F/F cachet, black oval "Consommez/Ls Cafes du/Congo" hs on front. 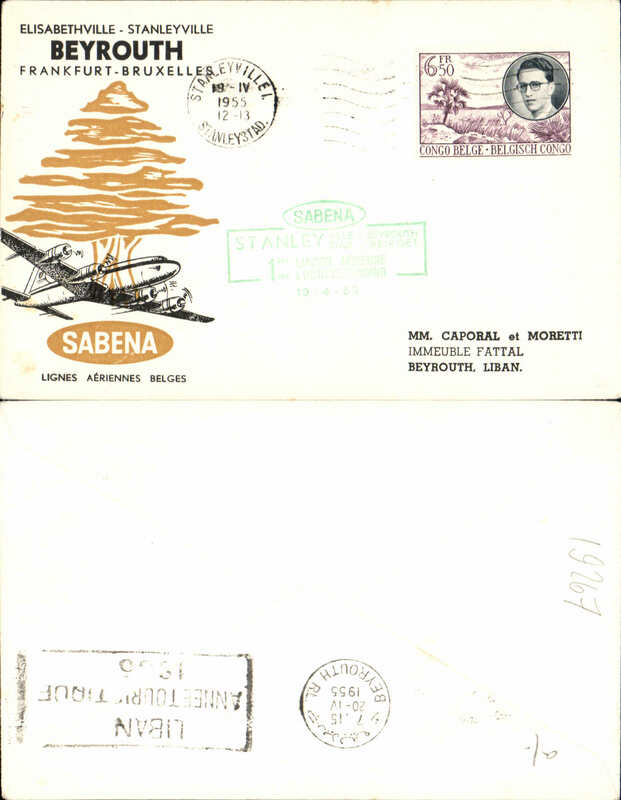 Flown from Lisala-Coquilhatville by F/F SABENA internal service. Some rough opening along top edge verso, does not detract. 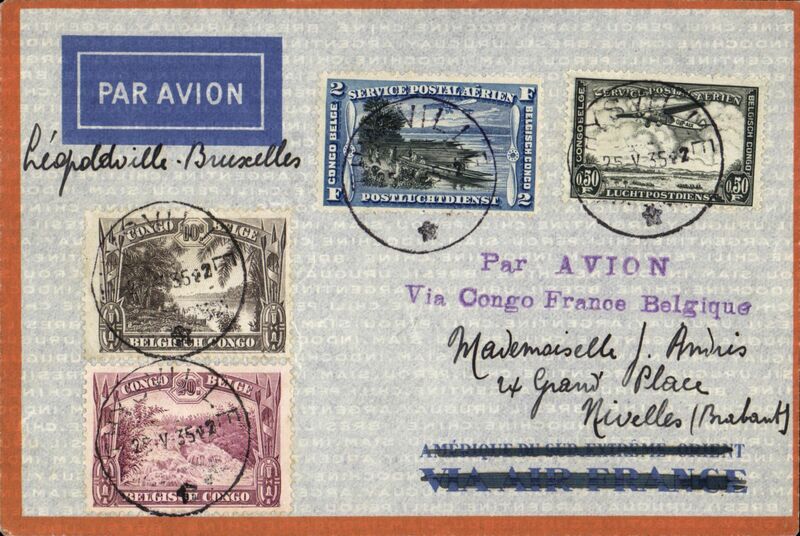 F/F Air Afrique, Leopoldville to London, via Marseilles, bs 16/3, 60c Congo PSC with additional 3F25 Congo stamps, intended for carriage on the return of the first regular SABENA flight by the aircraft "Edmond Thieffrey" from Leopoldville to Brussels, via Coquilhatville, Bangui--Fort Lamy-Zinder-Niamey-Gao-Reggan-Colomb Bechar-Oran -Marseilles, black oval "Consommez/Ls Cafes du/Congo" hs on front, airmail etiquette cancelled by black two line Jusqu'a applied at Marseilles, typed verso "Premier depart de la laison aerienne.....Depart Leopoldville le 4 mars 1935". However, posted two days late for this flight, so was flown on the on the first return of the regular Air Afrique fortnightly service from Algeria to Brazzaville (across the river from Leopoldville) via Coquilhatville-Bangui-Fort Lamy-Goa-El Golea-Alger-Marseilles, where the Jusqu'a was applied. Interesting item, ex Clowes. 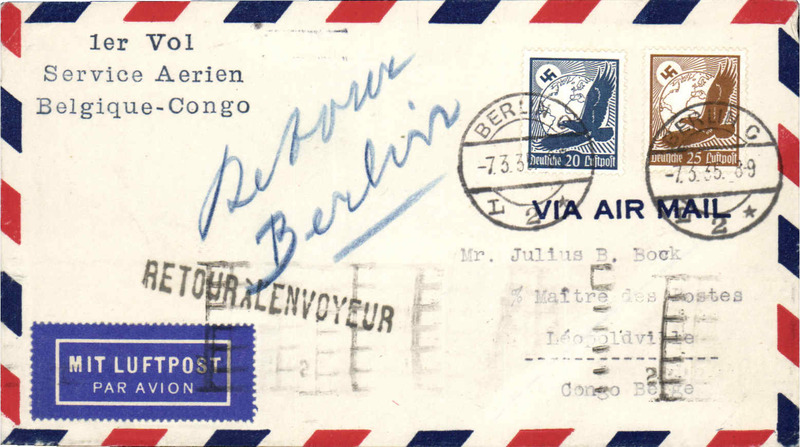 First OFFICIAL Germany acceptance for the Belgian Congo via the regular Sabena route, Berlin to Leopoldville, bs 13/3 via Paris 7/3, air cover franked 45pfg, canc Berlin C/L2 cds, blue three line "1er Vol/Service Aerien/Belgique Congo" cachet. See German PO Communique No20, p179 which states that the first German 'official' mail for the Reggie Francaise route left Germany on 28/2, while the first 'official' mail for the Sabena route left on 7/3, which was actually the date of the second Sabena flight. 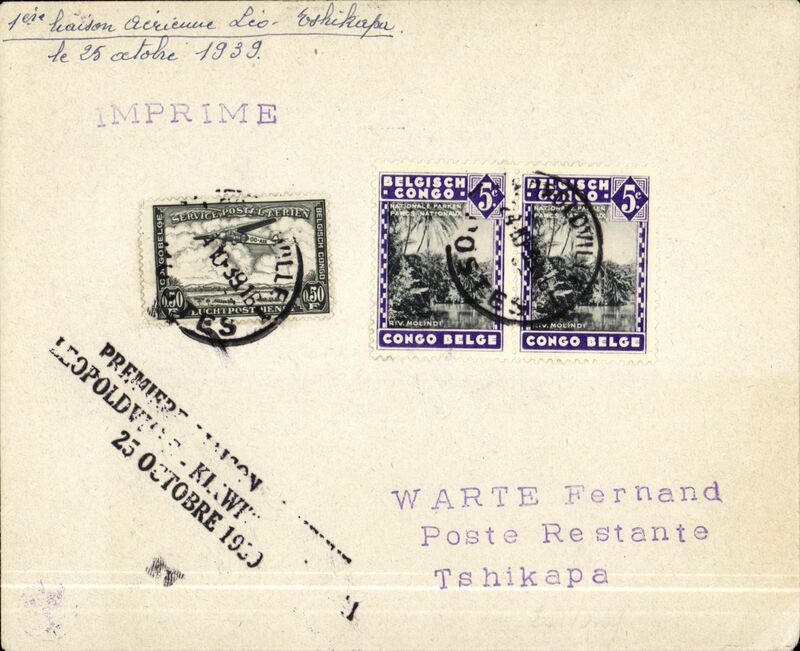 Leopoldville to Kilosa, Tanganyika Territory, bs 20/4, via Coquilhatville 31/3, Kigoma 18/4, Kigoma-Tabora TPO 19/4, and Tabora-Dar es Salaam TPO 19/4, registered (label) cover franked 7F canc Leopoldville 26.3.35 cds, airmail etiquette, typed 'Par Avion (ms) via Dodoma', and verso attractive blue/white vignette showing head and shoulder engraving of Pasteur and his quotation that "wine is the healthiest and most hygienic of all drinks". A great cover with superb routing which travelled 2200 miles to reach its destination. Please NOTE this cover has been opened up and mounted neatly on a black card. 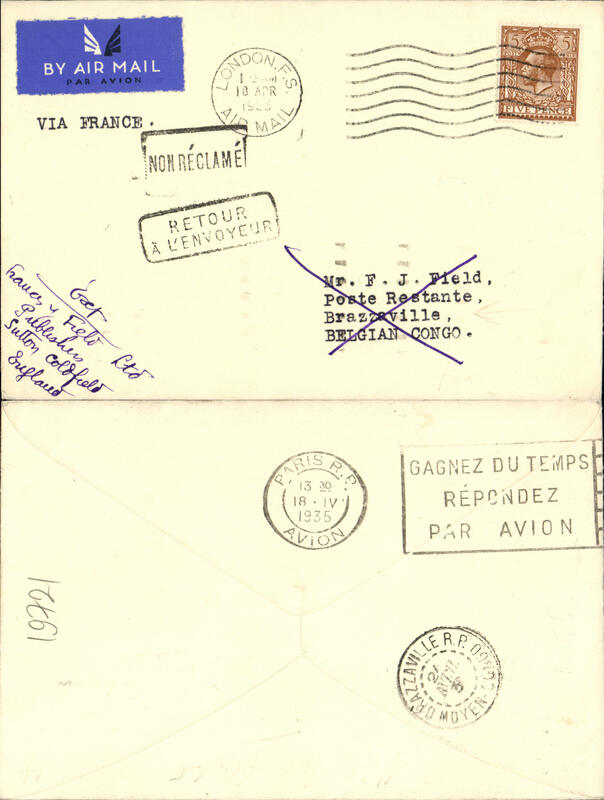 Sabena/Air Afrique, London to Brazzaville, bs 24/4, via Paris 18/4, Francis Field airmail etiquette cover franked 5d, typed 'Via France'. Air Afrique, flown cover Leoploldville to Brussels, no arrival ds, 'Troupes Coloniales (French Colonial Forces)/Group No 2/Commandement' printed cover with coat of arms on flap, correctly rated 4F, large black framed "Avion" hs front and verso, typed "Via Brazzaville-Alger-Marseille", black oval "Consommez/Ls Cafes du/Congo" hs on front. Interesting sender. Elisabethville to Bulawayo, via Broken Hill 24/4 transit cds, mixed meter (2F50c) and airmail stamp (6F) franking, boxed 'Avion' and st line 'Par Avion' hs's. This is the earliest known machine cancel used in the Congo, the Timbograph type described in BC Bulletin 33/9. and first used in 1929. It shows code A3 confirming origin as Elisabethville. 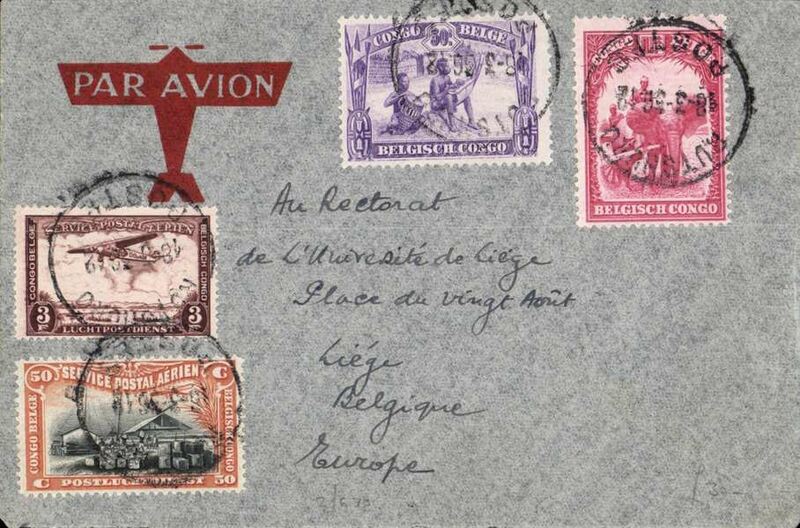 Thysville to Belgium, no arrival ds, pale grey/orange border Air France cover franked 2F80, canc Thysville cds, fine strike violet two line "Par Avion/Via Congo France Belgique" which was in use in Thysville only between February and May 1935. 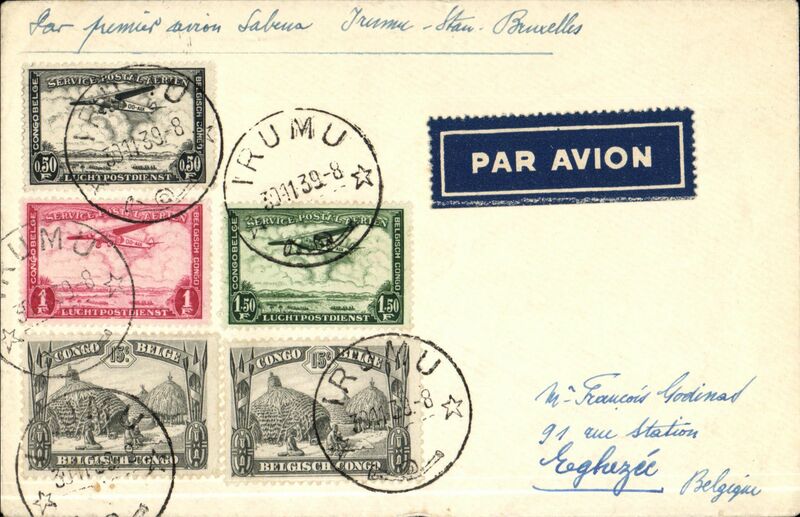 Irumu to Luxembourg, bs 20/6, airmail cover franked 6F50, canc Irumu cds, violet 'Par Avion' hs. Small piece of flap missing verso. 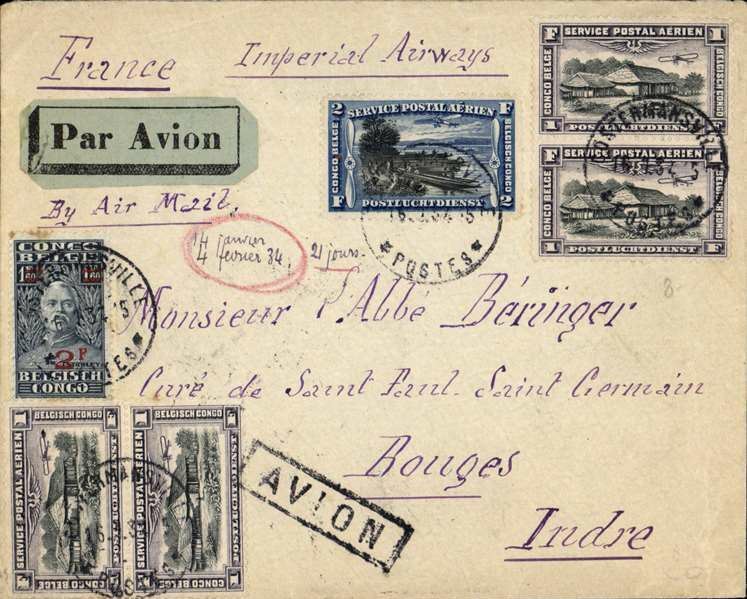 Sabena/Air France, Thysville to Royat, France, bs 3/8, airmail cover franked 6F, fine strike black two line "Par Avion/Via Congo France Belgique". 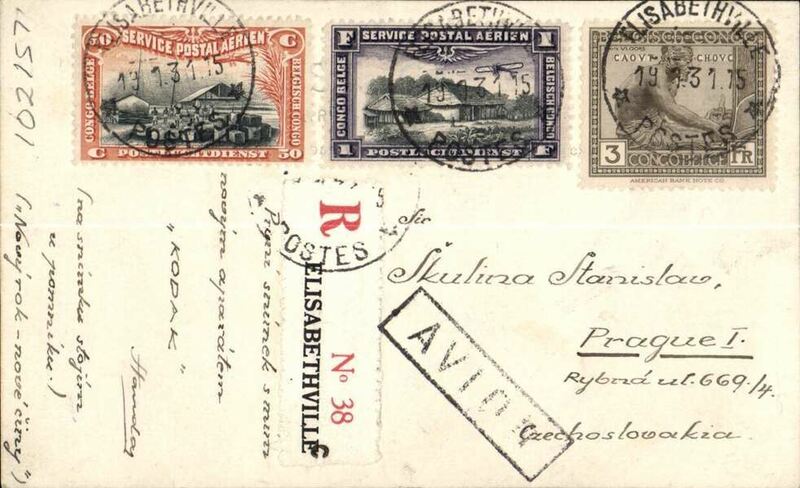 Rare Congo acceptance for Mozambique, F/F Elisabethville to Beira, bs 1/8, via Broken Hill 31/7, airmail cover franked 6F50, black boxed 'Avion' hs. Carried to Broken Hill by Aero Club du Katanga, then by Imperial Arways to Salisbury, then by F/F Rhodesia and Nyassaland Airways to Biera. There are no references, thus far, to a Congo acceptance for Mozambique. A super item in fine condition. 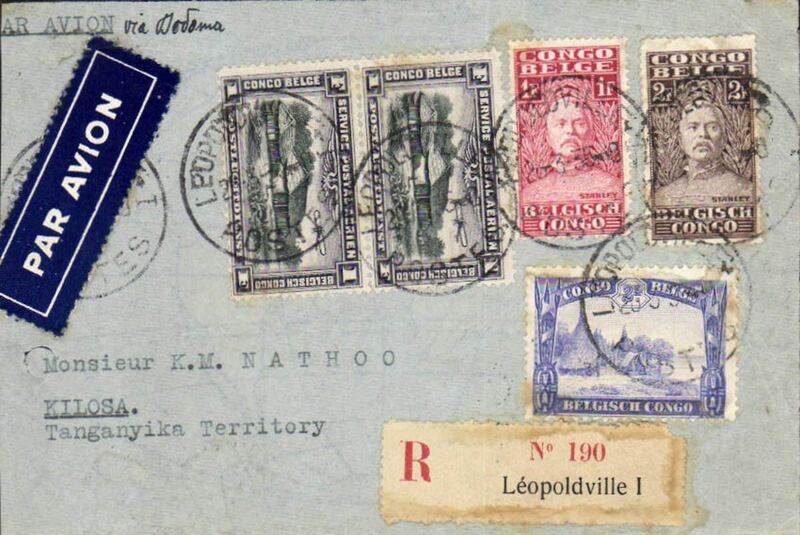 Return journey Leopoldville to Brussels, Count De Looz-Corswarem, Mahieu and D'Hoore official flight to the Congo, plain cover franked Congo 1F50 canc Leopoldville 21/10 cds, ms "Raid de Loos de Corswarem", black "Raid Mahieu" cachet. Ms instruction from sender on back for this cover to be kept. Only 50 carried. Ex Clowes. 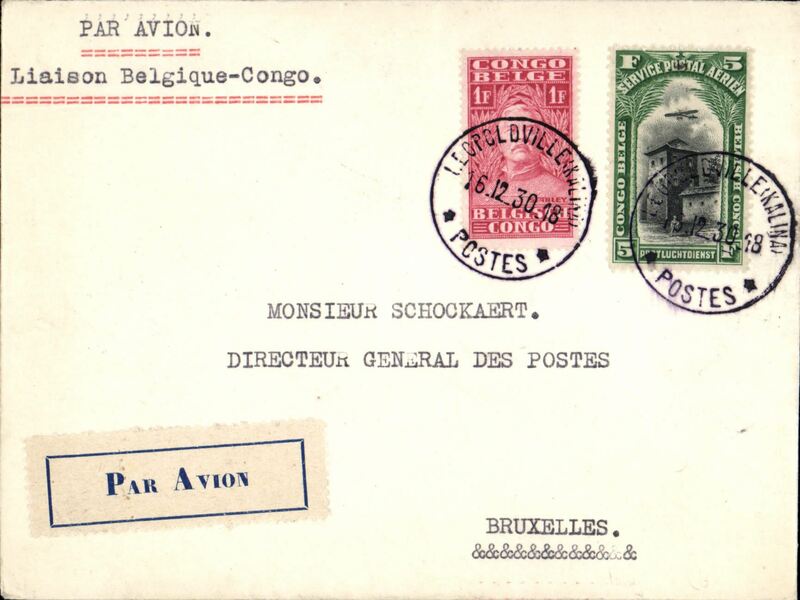 Return journey Coquilhatville to Antwerp via Brussels bs 2/11, Count De Looz-Corswarem, Mahieu and D'Hoore official flight to the Congo, Missionaires de Sacre Coeur/ Mission de Coquilhatville corner cover franked Congo 1F50 canc Coquilhatville 22/10 cds, ms "Raid de Loos de Corswarem", black two line"Coq 22 10 35 Raid/de Looz de Corswarem" cachet. Mail from Coquilhatville was very small, likely only 2-6 (at most) flown. Folds, but of good appearance and rare. 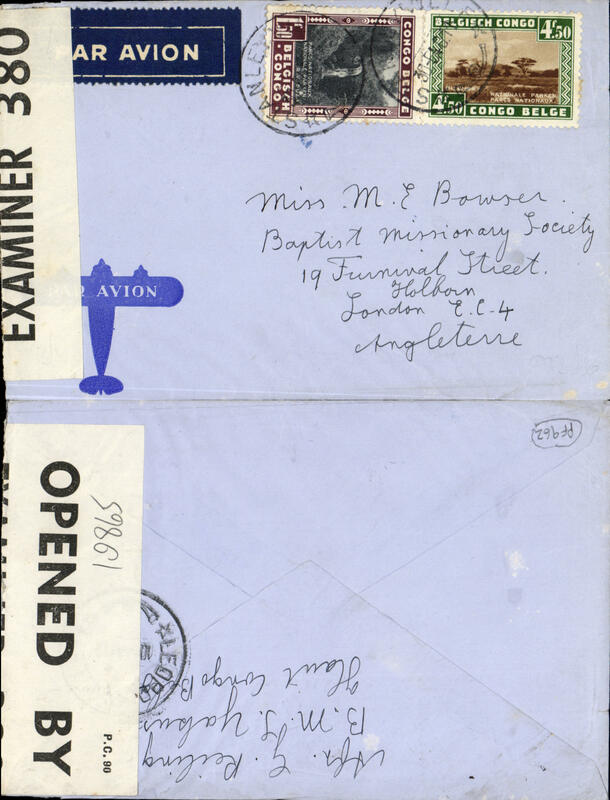 Aba to London, this is the vey envelope descibed as a 'mystery' in Stern's 'Airmails of the Congo', p298. 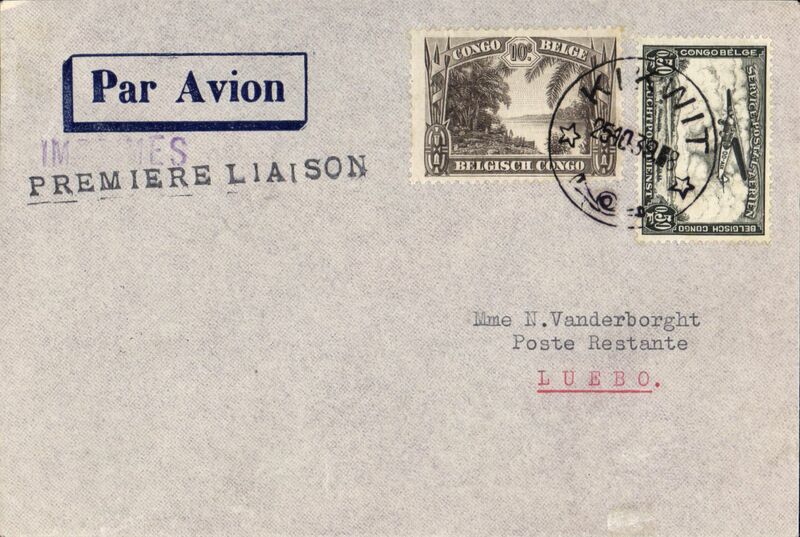 A large blue envelope bearing a red label "De Aba/Londres", postmarked Aba 24.10.35 15h, and bearing etiquette 'Par Avion'. There is also wrinting on the label "Despeche 80" and "180gr". The letter bears seals on reverse "Office-Postes-Aba". Believed, particularly as there was no franking' to be the post office envelope containing the post which was to be flown by the Imperial Airways sevice to London. Formerly in Stern's colection, and then passed on to Baron de Moffat. A truly unique item. Ex Clowes. 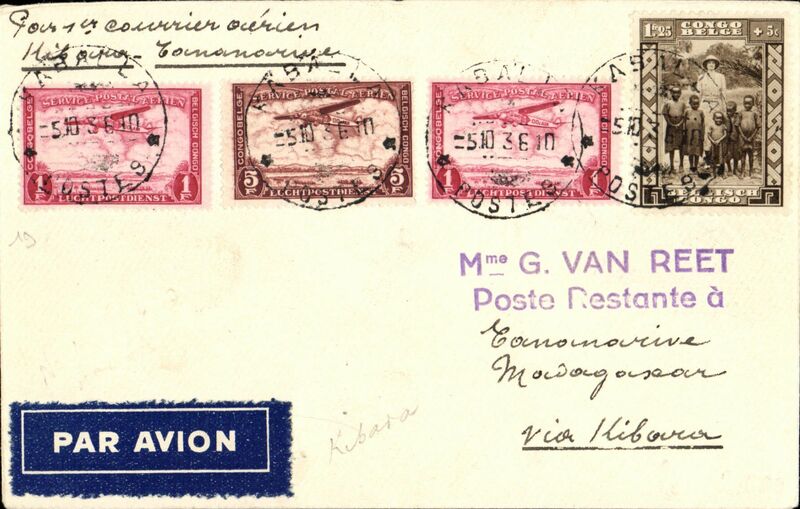 Sabena Direct Flight, Basankushu to London, no arrival ds, plain cover franked 2.50F overseas postage and 3.50F airmail, canc Basankushu cds, ms 'Par Avion', black two line "Par Avion Direct/Congo France Belgique". Basankusu was the first trade post along the river from Leopoldville. Its isolated situation made communication with the wider world difficult. There was an airport, but passengers tended to be people working for NGOs or businesses in Kinshasa. Today there is no postal service in Basankusu. To send letters, the custom is to give to give them to someone who is travelling, or the pilot of the plane, to send from Kinshasa or Europe. The cachet on this cover is unlisted in any of our files. A scarce item, ex Clowes. 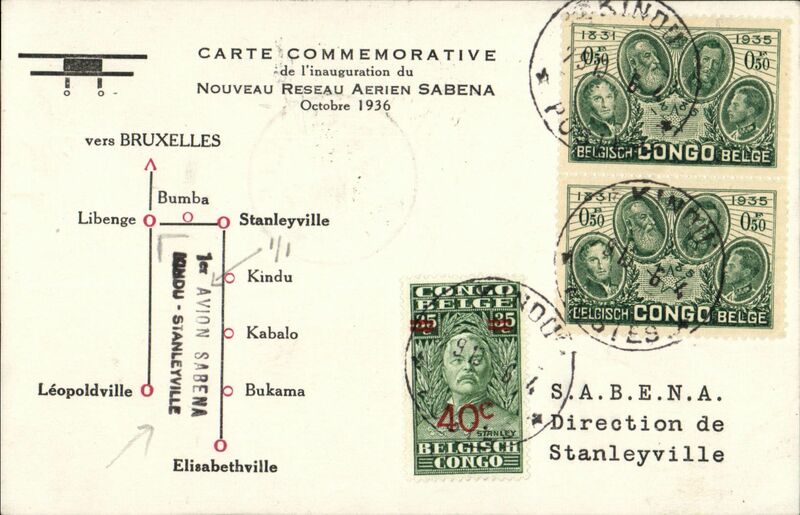 F/F Stanleyville to Libenge, bs 5/11, carried on the accelerated Sabena service from Elisabethville-Brussels, souvenir card, franked 1F40, green Sabena F/F cachet. 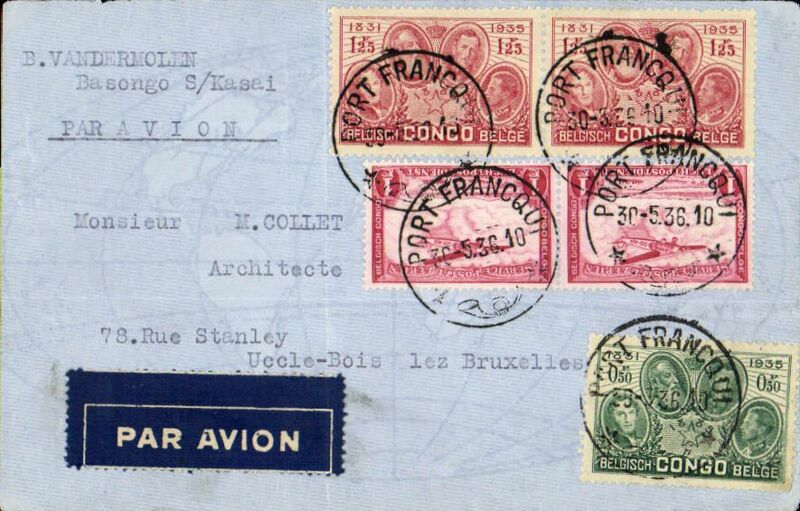 Scarce acceptance for Belgian Congo via F/F Air France/Air Afrique Paris-Leopoldville extension to Elisabethville, airmail etiquette cover franked 4F, canc Bruxelles 7/11 cds, red boxed "!ier Service Aerien/Francais Regulier/Europe-Congo-Madagascar" flight cachet. 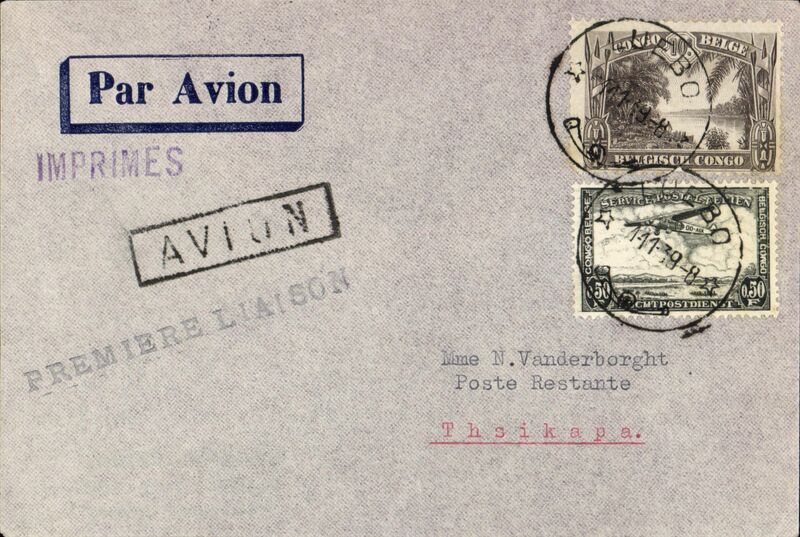 This is one of only c50 covers to catch the first flight. Due to an error in the official announcement most Belgian acceptances went by the second (ie the first Sabena) flight which left Brussels on 15/11/35. Ex Clowes. Exhibition quality cover written up on display page. 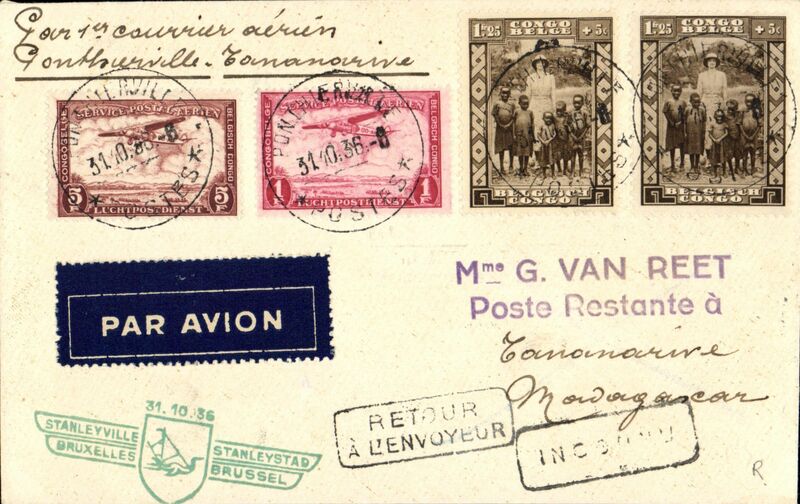 Air Afrique, Thysville to Elisabethville, bs 14/11, scarce acceptance for F/F Air Afrique Brazzaville to Elisabethville, plain cover franked 1F50, canc Thysville 11/11 cds, black three line "Par Avion/Air Afrique/Congo-Madagascar" flight cachet. Reggie Malgache opened its new Elisabethville-Madagascar service on the same day as the Air Afrique Alger-Brazzaville-Elisabethville service. Only 20 flown, refs Godinas, and Stern. Ex Clowes. 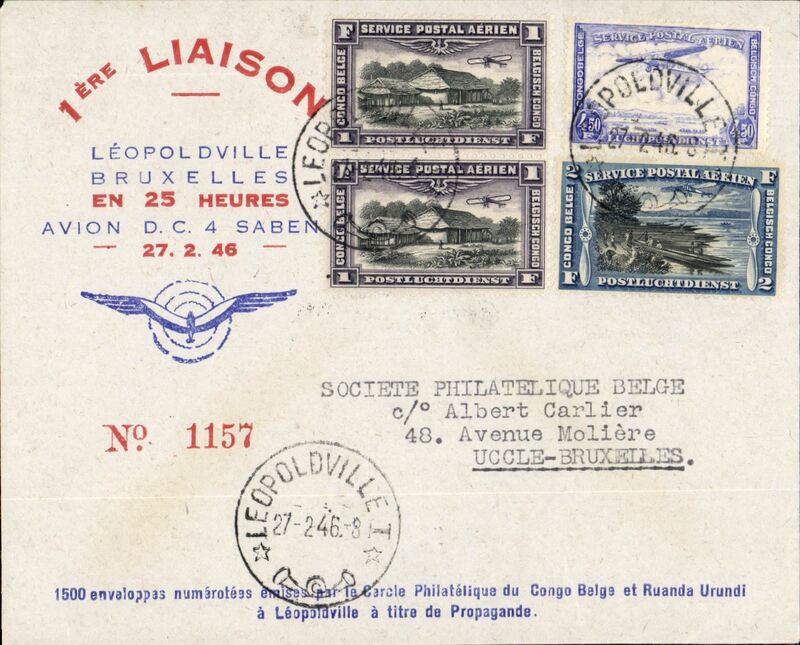 Leopoldville to Elisabethville, bs 21/11, intended acceptance for Air Afrique F/F Brazaville to Elisabethville, but too late to connect with this service at Leopoldville, so carried on F/F sabena extension to Elisabethville, plain cover franked Congo 3F canc Leopoldville 13/11 cds, typed "Par Avion/Prongation ligne Alger-Brazaville/juqu'a Eloisabethville- 1er voyage", and nice strike red "Depot Tardif" (late Posting) cachet. 1cm along top edge verso hs been neatly excised. Nice item. 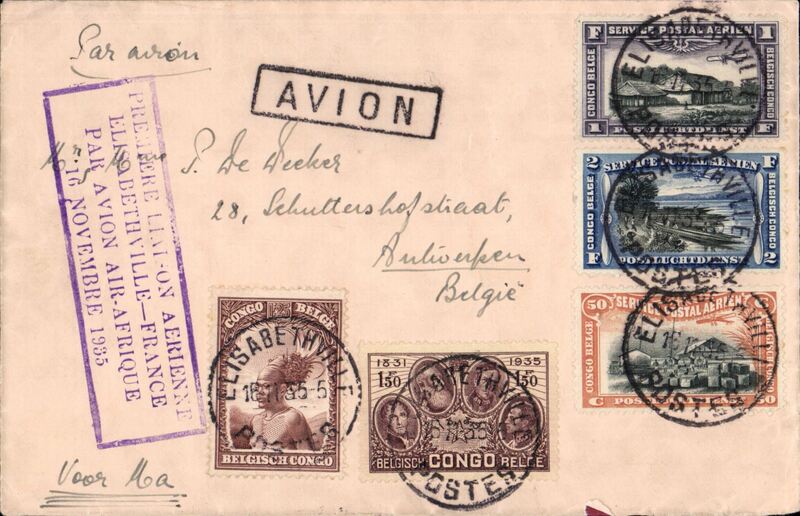 Air Afrique F/F extension of the regular Congo service to Elisabethville, round trip all the way by air, Banningville to Elisabethville, bs 14/11, and return 15/11, 16/11, imprint airmail etiquette franked Congo 1.25F canc Banningville cds and Congo 2.25F canc Elisabethville cds, violet framed "Premiere Laison Aerienne/Elisabethville-France/Par Avion Afrique/16 Novembre 1935" cachet. Opening of the Regie Malgache service Elisabethville to Madagascar, Elisabethville to Costermansville, bs 23/11, via Broken Hill 16/11 on the F/F of the new Regie Malgache service, then to Dodoma 17/11 by Imperial Airways, then rail to Kigoma on Lake Tanganyika 21/11, then by steamer and road via Usumbura/Uvira to Costermansville, bs 23/11, ms "Via Broken Hill-Dodoma", violet framed "Premiere Laison Aerienne/Elisabethville-France/Par Avion Afrique/16 Novembre 1935" cachet - which may have been applied in error. Great item with superb routing. 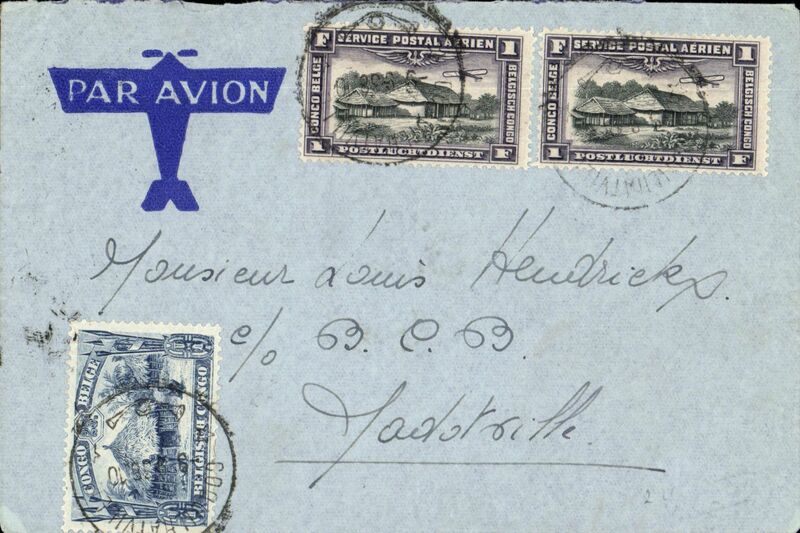 F/F Elisabethville to Brussels leg of the first connection between Elisabethville and France by Air Afrique, cover franked Congo 6F25, fine strike violet framed "Premiere Laison Aerienne/Elisabethville-France/Par Avion Afrique/16 Novembre 1935" cachet. 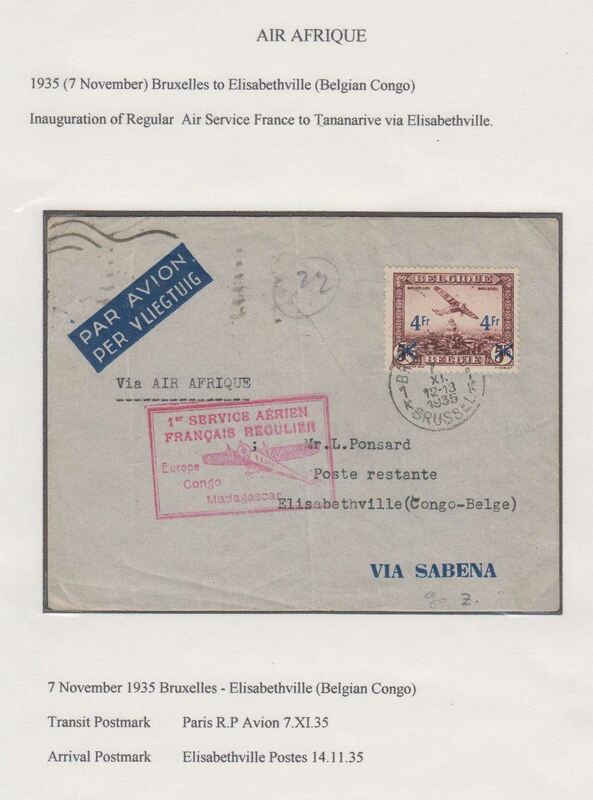 Thysville to Elisabethville, bs 21/11, carried on the F/F new Sabena service to Eisabethville, which connected with the French service to Madagascar, plain cover franked Congo 1.50F, canc Thysville cds, black three line "Par Avion/Sabena/Congo Madagascar" flight cachet, black framed "Avion" hs. Francis Field authentication hs verso. Only 20 flown. 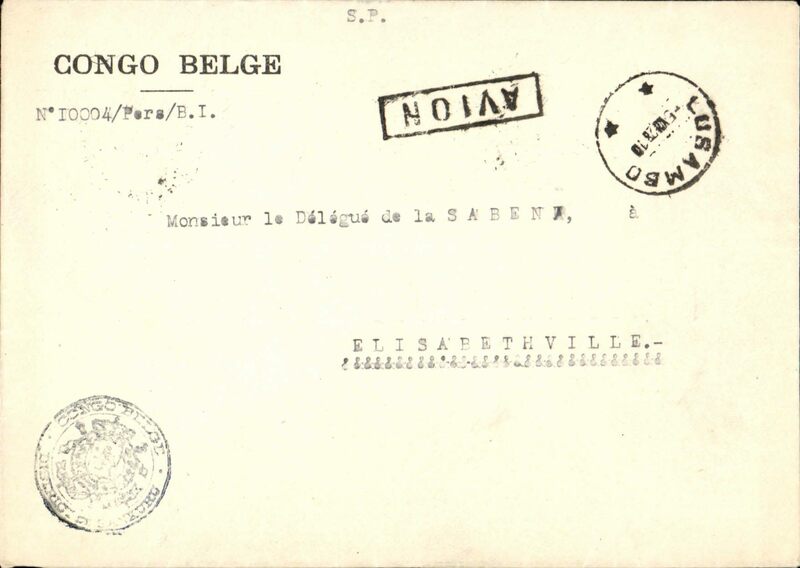 Sabena F/F extension of the regular service to Elisabethville, round trip Banningville-Elisabethville, 22/11 - Banningville 24/11, blue/grey Sabena cover franked Congo 2F25 (postmarked Banningville 20/11) and 2F25 (postmarked Elisabethville 22/1), purple framed Elisabethville Bruxelles/Sabena 23-11-1935 flight cachet. 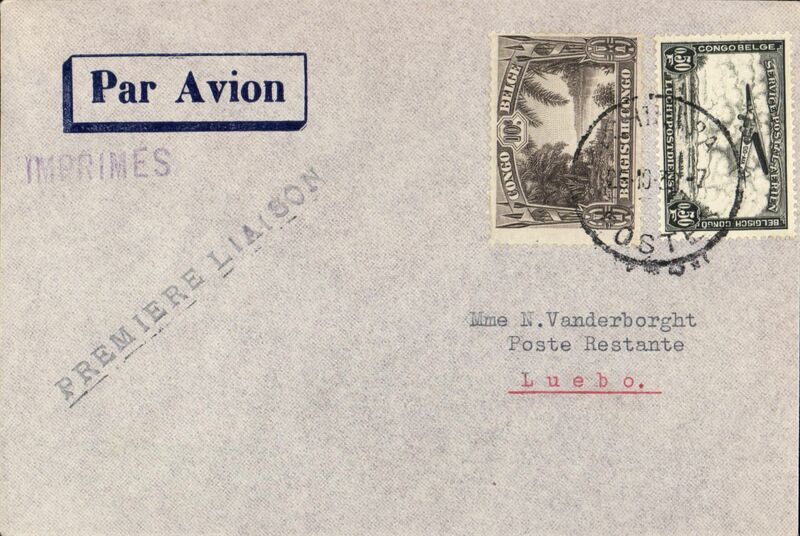 Sabena, First regular return flight, Luluaborg to Brussels, 29/11, F/F souvenir cover franked 3.80F, red two line "1ier Vol Luluaborg to Brussels/23 Novembre 1935", flight cachet, signed by the pilot Captain Prosper Cocquyt. 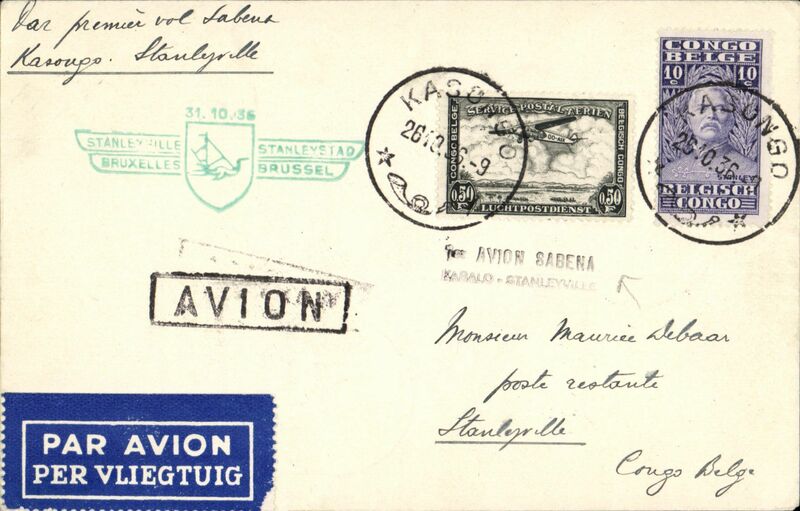 Sabena, First regular return flight, Elisabethville to Brussels, 29/11, F/F souvenir cover franked 3.80F, red two line "Elisabethville-Brussels/Via Sabena/23-11-35", flight cachet. 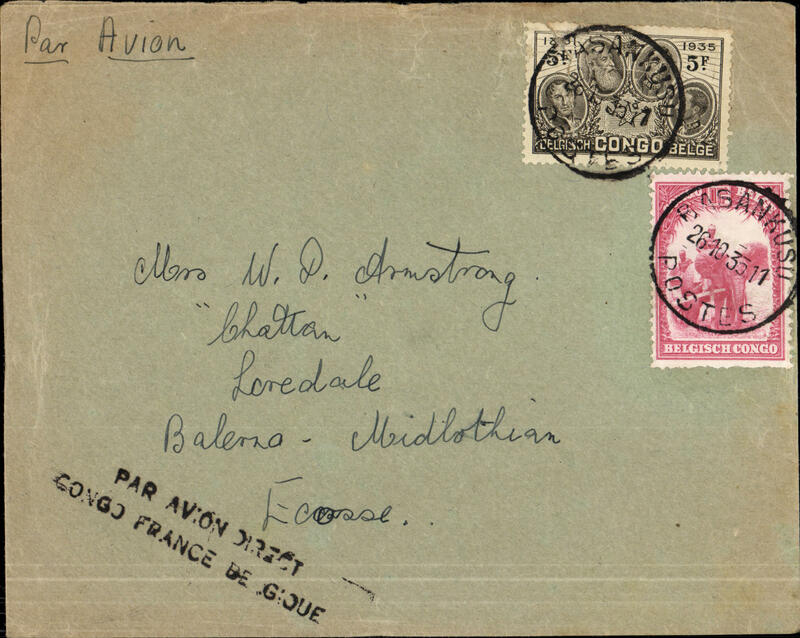 Congo to Madagascar, Elisabethville to Tananarive, bs 24/11, plain cover franked Congo 6F, red two line "Par Avion Regie Malgache assurant/1ie Laison Bruxelles-Tananarive". Carried on Sabena extension regular Congo service to Elisabethville, then by Regie Malgache to Madagascar. 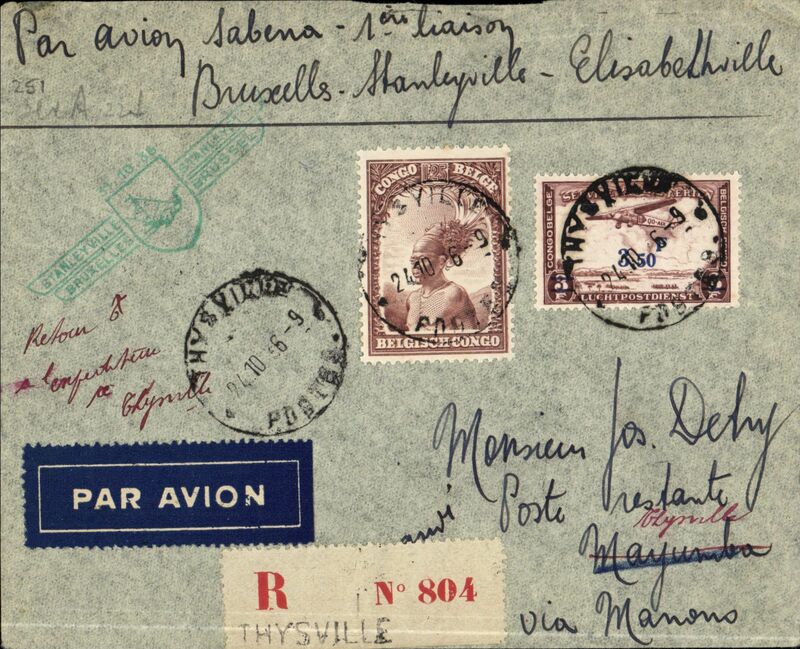 Sabena, First regular return flight, Elisabethville to Brussels, 29/11, attractive airmail cover franked 5F, violet framed "Premiere Laison Aerienne/Elisabethville-France/Par Avion Afrique/16 Novembre 1935" cachet. Sabena, Elisabethville to Leopoldville, no arrival ds, carried on the first regular return flight, from Elisabethville to Brussels. 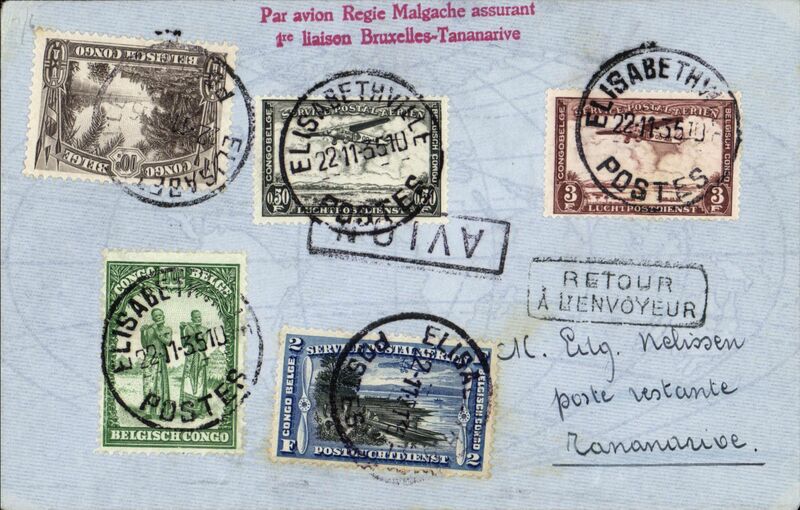 plain cover franked 5F, fine strike rare blue ' Elisabethville-Bruxelles/Sabena/23.11.1935' flight cachet. Note- the cachet is usually violet. There is no mention in the literature, thus far, of a blue cachet. 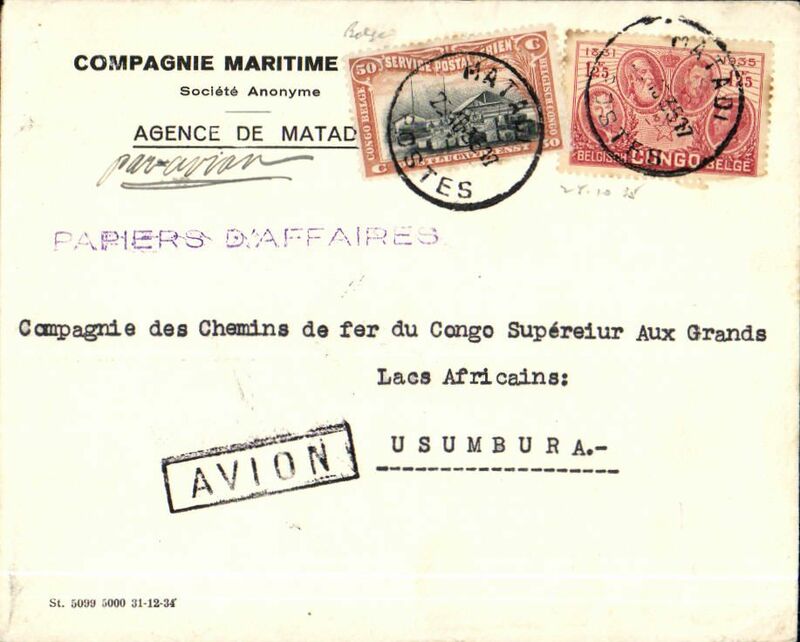 Matadi to Usumbura, bs, internal airmail, Compagnie Maritime company cover franked 1F75, black framed 'Avion' hs. 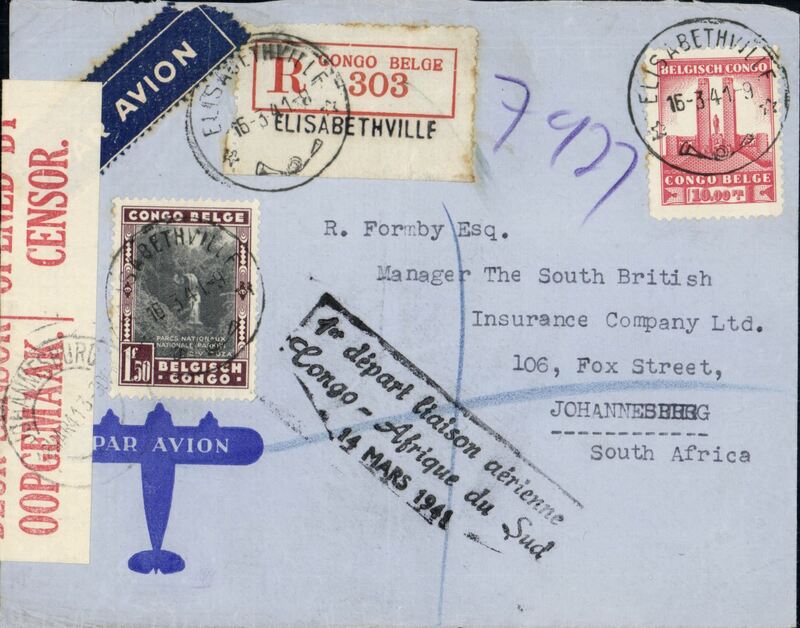 Elisabethville to Bulawayo, bs 21/12, airmail etiquettte cover franked 4F75, black boxed 'Avion' hs. Carried to Broken Hill by Aero Club du Katanga, then by Imperial Arways to Bulawayo. 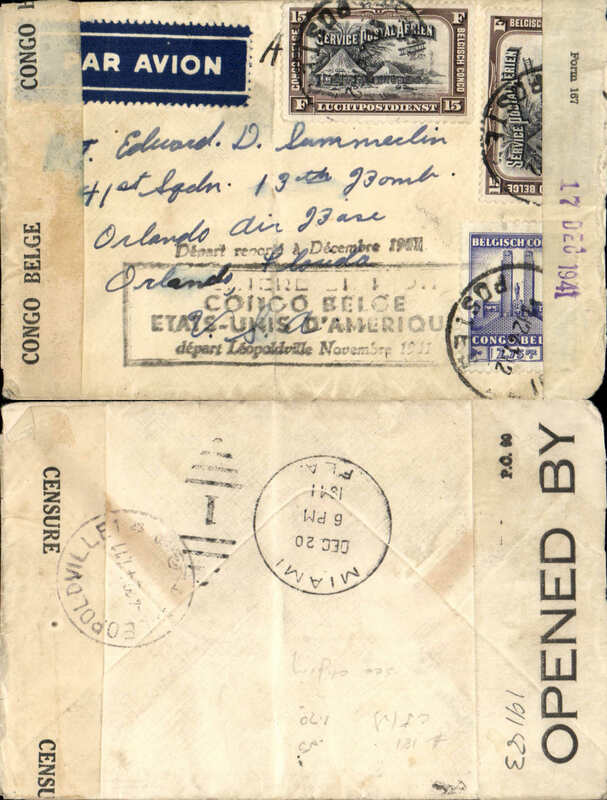 Imperial Airways connection, Rutshuru to Liege, Belgium, via Kampala 26/3 transit cds, imprint airmail cover franked 5F, carried by road to Kampala, then IAW South Africa-Engand service. Port Franqui to Brussels, no arrival ds, plain cover ranked 5F, dark blue/white airmail etiquette. 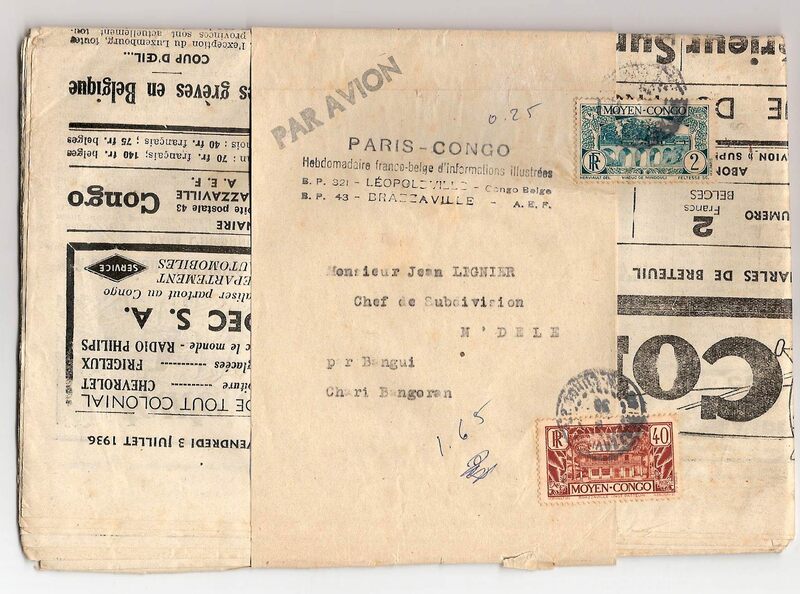 Rare and original unopened flown copy of the 3rd July 1936 'Paris-Congo' newspaper, Brazzaville to Chari Bangoran, via Bangui and N'dele, still in its original wrapper franked 2F & 40c Moyen Congo stamps, canc Brazzaville 8/7/36 cds, black 'Par Avion' hs and four line "Paris-Congo/Hebdomadaire franco-belge d'informations illustrees/B.P. 321- Leopoldville-Congo Belge/B.P. 43 Brazzaville- A.E.F." hs, addressed to the 'Chef du Subdivision, N'Dele, per Bangui/Chari Bangoran'. Flown by Air Afrique or Sabena from Brazzaville to Bangui or Fort Archambault on the Brazzaville-Algiers service, then surface to destination. 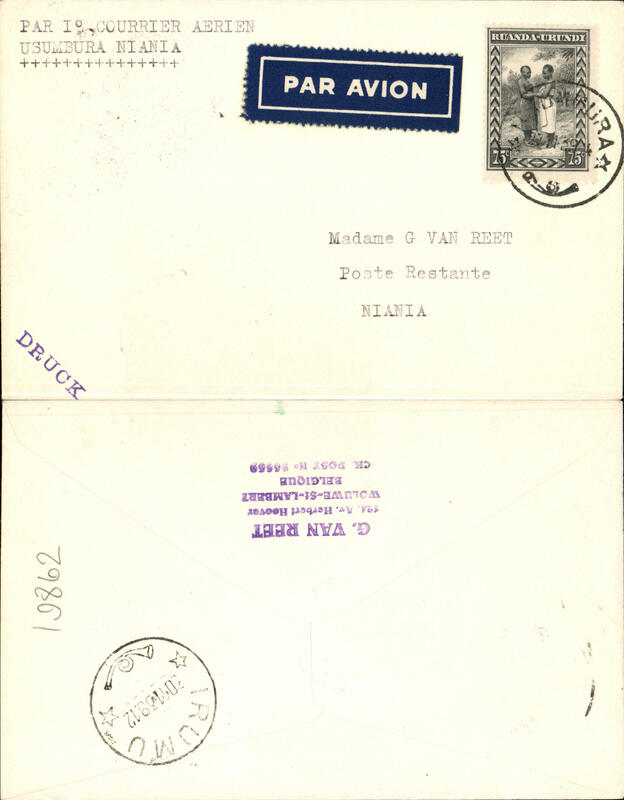 Likely first SABENA through service, Brussels to Boma, bs 9/8, plain cover mailed by Charles Van Der Haeghen, franked 3.50air+30c ordinary, dark blue/white etiquette. Thought to be the first through service to Boma by Sabena. Sabena F/F St Joost to Libenge, bs 4/9, Van Reet cover franked 4F, canc San Joost cds, non invasive 5% verso missing, does not detract. 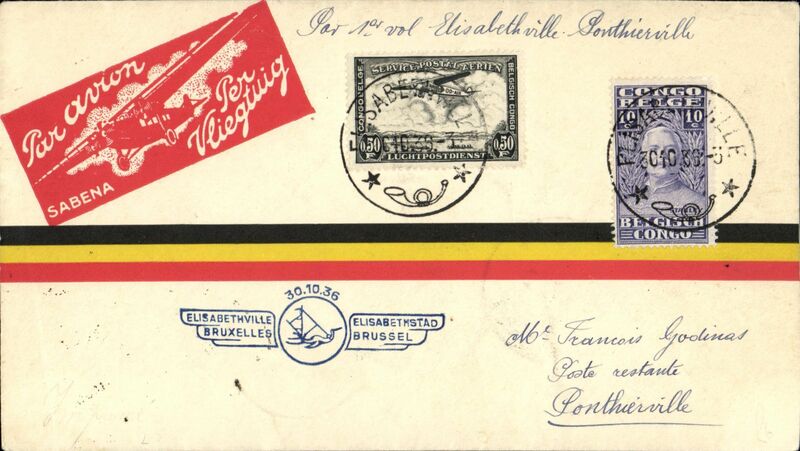 Memorial Week for the late Queen Astrid, Ostend to Leopoldville, bs 8/9, and return 11/9 to Brussels, F/F Bruxelles-Elisabethville souvenir cover, franked Belgium 5F and Congo 5.25F Congo stamps. 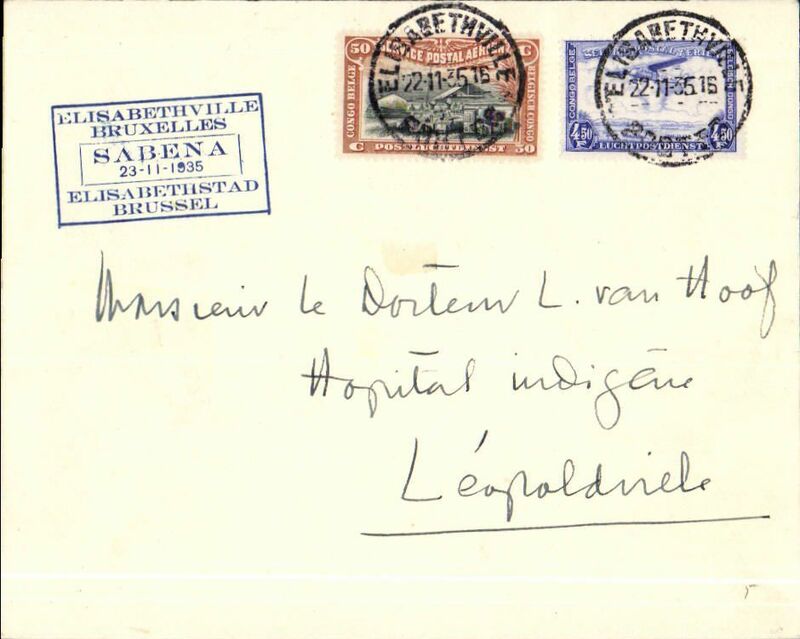 Memorial Week for Queen Astrid, Ostend to Leopoldville, bs 7/9 and return to Uccle, souvenir cover franked 5F Belgium and 5F25 Congo stamps. New internal acceptance for Madagascar, Kaballa to Madagascar, via Kibara, plain cover franked 8.25F, ms "Por 1er courrier aerienne/Kiballa-Tanananarive", no arrival or transit marks. Although not mentioned in the reference books, this cover was prepared by Van Reet who was a well respected aerophilatelist. Scarce and interesting. Leopoldville to New York, via Marseille Gare Avion 16/10 transit cds, imprint etiquette cover franked 6F, uncommon black three line "en avion jusqua/Marseille/Gare avion"
Imperial Airways carriage of mail from Eastern Congo to Egypt, Buta to Alexandria, bs 29/10, via Aba 14/10 (date error, should be 24/10) and Cairo 29/10, commercial airmail corner cover franked 5F50, black framed 'Avion' hs , typed "Via Juba-Khartoum". Surface to Juba, then OAT to Egypt. 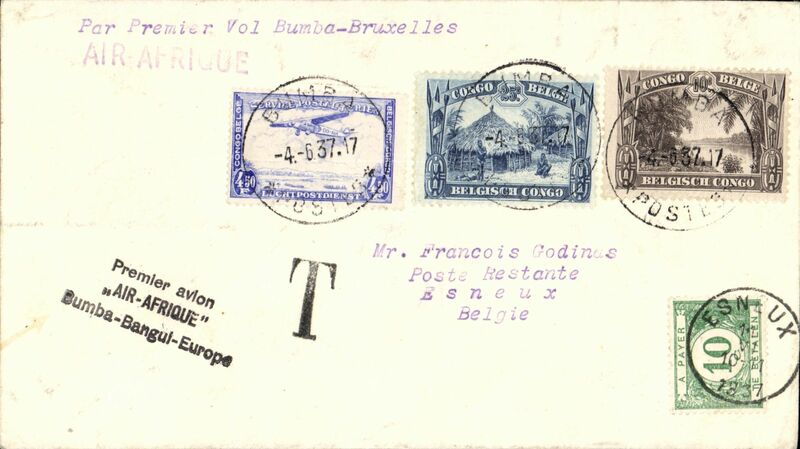 First accelerated Sabena service from the Belgium to Belgian Congo, bs Bumba 28/10, and return, bs Brussels 5/11, illustrated souvenir cover franked 5F Belgium stamps, canc Brussels cds, and 5F Congo stamps, canc Bumba cds. 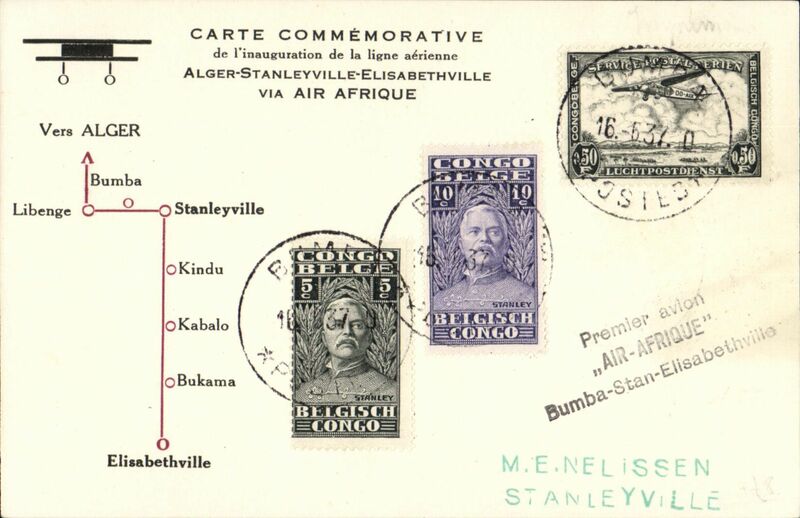 First accelerated Sabena service from the Belgium to Belgian Congo, and return, bs Brussels 5/11, illustrated souvenir cover franked 5F Belgium stamps, canc Brussels cds, and 5F Congo stamps, canc Stanleyville cds. 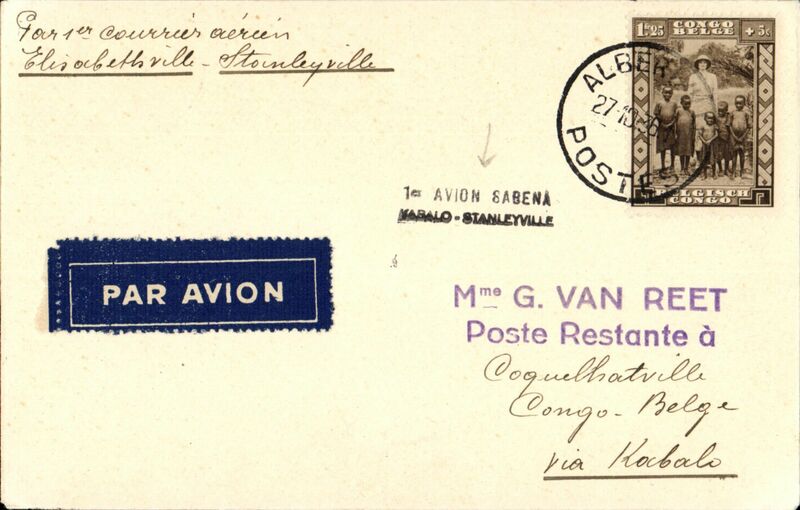 F/F Thysville to Albertville, bs 30/10, via Leopoldville 24/10 and Kabalo 20/10, carried on the accelerated Sabena service from Brussels to Elisabethville, airmail etiquette cover franked 2F25, typed "Par avion Sabena 1ere laison Bruxelles/Stanleyville-Elisabethville". A puzzling combination of internal routes - one for the specialist. F/F Thysville to Mayumba 'via Manono' , bs 30/10, and via Leopoldville 25/10 and Stanleyville 28/10, then returned via Became 3/11, Kabalo 17/11 to Leopoldville 20/1/37, carried on the accelerated Sabena service from Brussels to Elisabethville, airmail etiquette cover franked 4F25, green first flight cachet, ms "Par avion Sabena 1ere laison Bruxelles/Stanleyville-Elisabethville". A puzzling combination of internal routes with superb routing. One for the specialist. 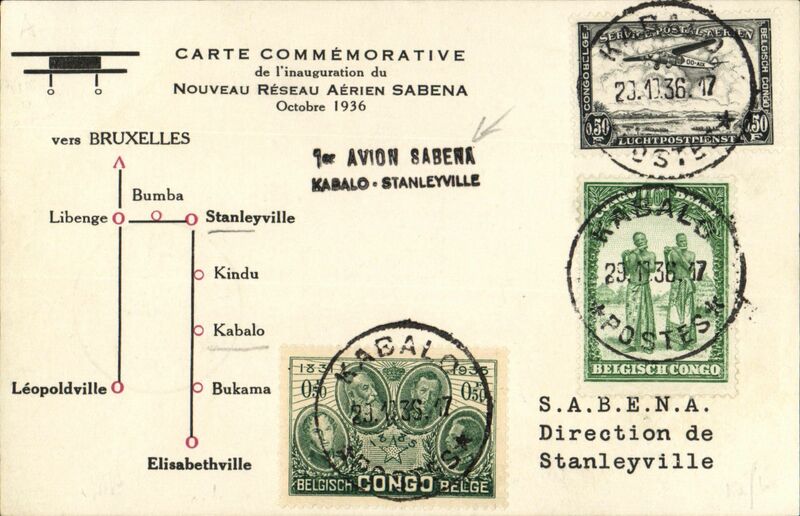 F/F Kasongo to Stanleyville, bs 30/10, via Kabalo 29/10, carried on the accelerated Sabena service from Elisabethville-Brussels, plain cover, franked 60c, black two line "1er Avion Sabena/Kabalo-Stanleyville cachet. Scarce origin. F/F Kangolo to Stanleyville, bs 30/10, via Kabalo 29/10, carried on the accelerated Sabena service from Elisabethville-Brussels, plain cover, franked 1F25, black straight line " 1 Laison Eville Stan" cachet. Scarce origin. F/F Albertville to Coquilhatville 3/11, via Kabalo 28/10 and Stanleyville 30/10, carried on the accelerated Sabena service from Elisabethville-Brussels, Van Reet cover , franked 1F25, black two line "1er Avion Sabena/Kabalo-Stanleyville" cachet. Superb routing. F/F Kongolo to Coquilhatville 3/11, via Kabalo 28/10 and Stanleyville 30/10, carried on the accelerated Sabena service from Elisabethville-Brussels, Van Reet cover , franked 1F25, black two line "1er Avion Sabena/Kabalo-Stanleyville" cachet. Superb routing. 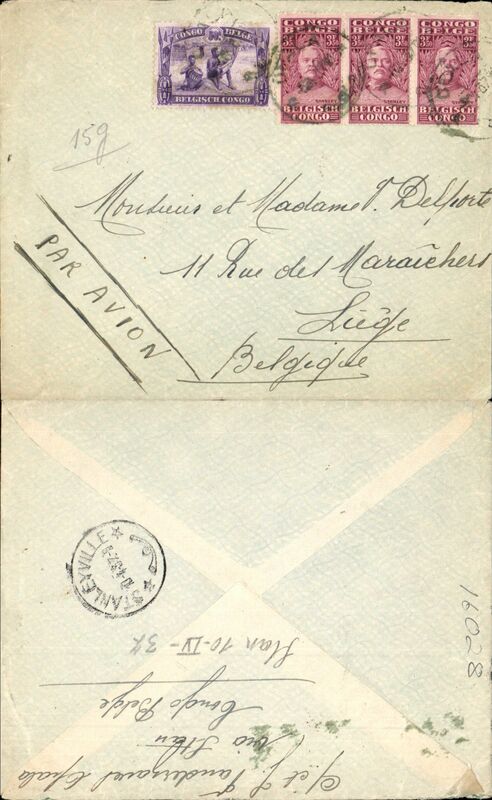 FIRST ACCEPTANCE OF MAIL FOR SWITZERLAND, for carriage on the accelerated Sabena service from Elisabethville-Brussels, Jadotville to Berne via Elisabethville 29/10, airmail etiquette cover franked 6F05, blue return first flight cachet, airmail etiquette cancelled by Marseilles black three line Jusqu'a, then speedy rail service to Switzerland. Nice item. Sabena first internal fast flight service, Ponthierville to Elizabethville, bs 29/10, Godinas cover franked 50c, 10c, rd/white vignette, green flight cachet. 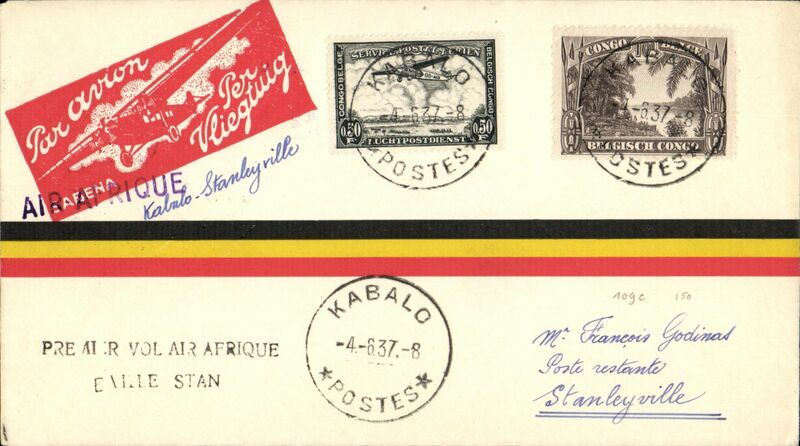 Kabalo to Brussels, bs 3/11, carried on the Sabena first internal fast flight service from Kabalo to Stanleyville, airmail etiquette cover franked 3.75F, black two line '1ier Avion Sabena/Kabalo-Stanleyville' cachet. 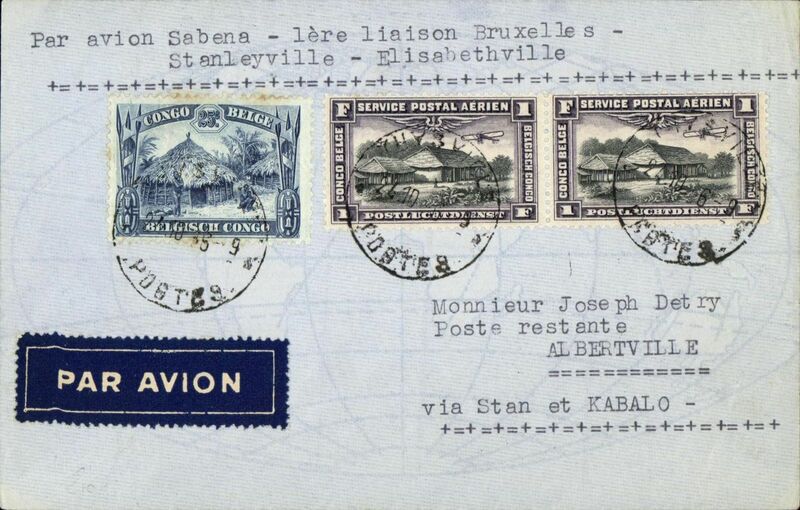 F/F Elisabethville to Kabalo, bs 30/10, carried on the accelerated Sabena service from Elisabethville-Brussels, imprint etiquette cover franked 60c, green flight cachet, black two line "1er Avion Sabena/Kabalo-Stanleyville" cachet. 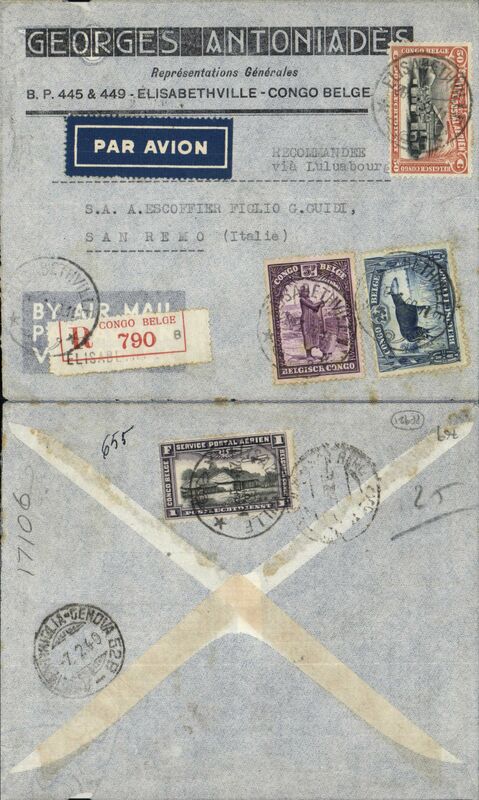 F/F Elisabethville to Stanleyville, bs 30/10, carried on the accelerated Sabena service from Elisabethville-Brussels, imprint etiquette cover franked 75c, blue flight cachet. 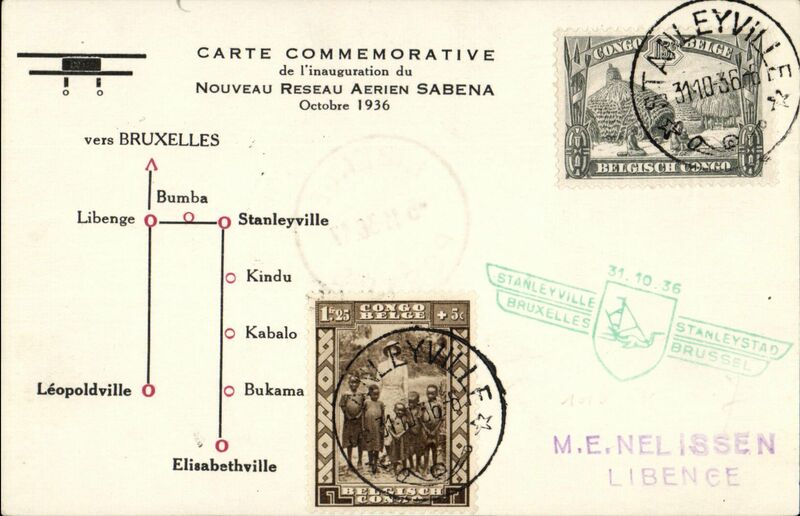 F/F Bukama to Stanleyville, bs 30/10, carried on the accelerated Sabena service from Elisabethville-Brussels, souvenir card with diagram of route, franked 1F40, black two line "1er Avion Sabena/Bukama-Stanleyville cachet. 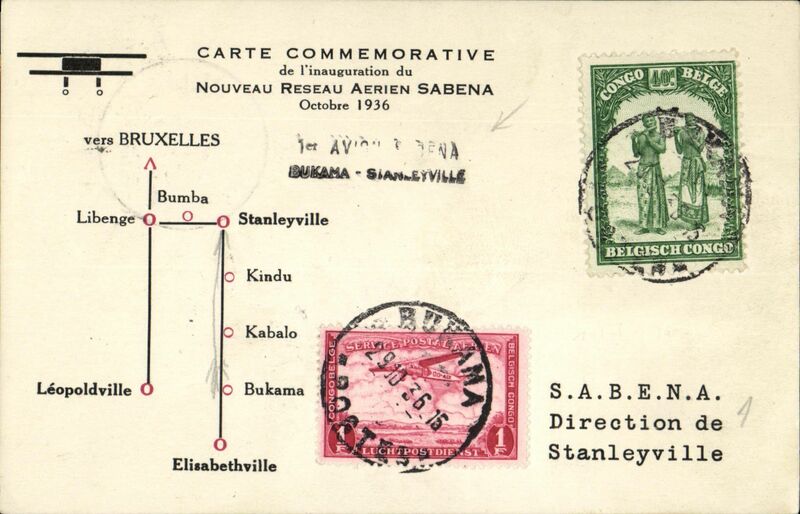 F/F Kabalo to Stanleyville, bs 30/10, carried on the accelerated Sabena service from Elisabethville-Brussels, souvenir card with diagram of route, franked 1F40, black two line "1er Avion Sabena/Kabalo-Stanleyville cachet. 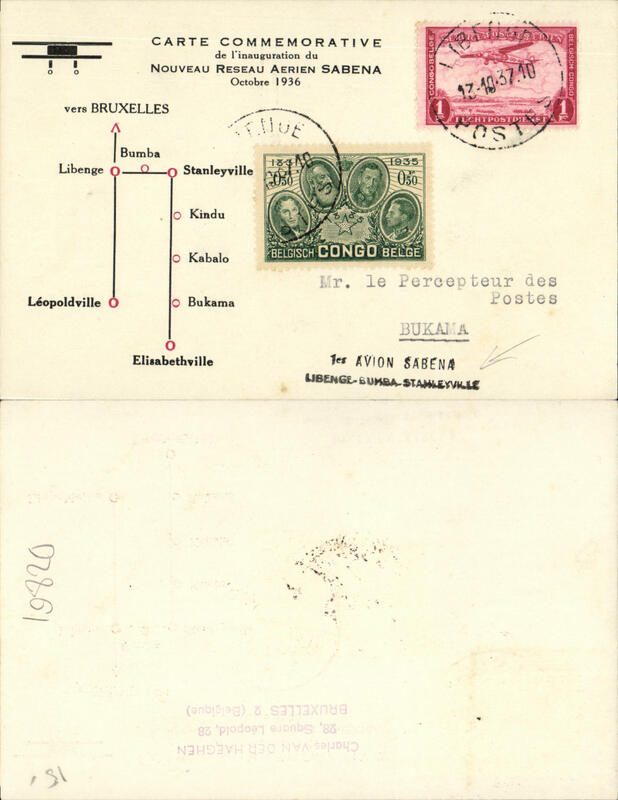 F/F Bumba to Libenge, bs 5/11, carried on the accelerated Sabena service from Elisabethville-Brussels, souvenir card with diagram of route, franked 1F40, blue two line "1er Avion Sabena/Bumba-Libenge-Bruxelles" cachet. Uncommon origin/destination. 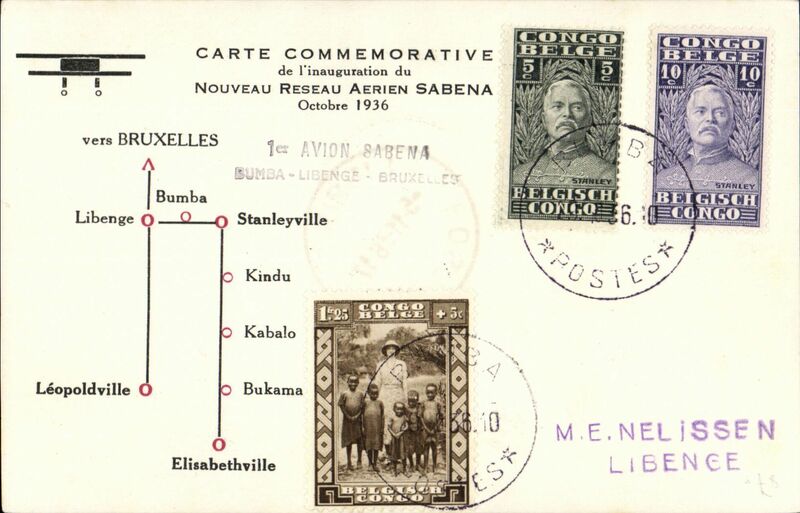 F/F Kindu to Stanleyville, bs 30/10, carried on the accelerated Sabena service from Elisabethville-Brussels, souvenir card, franked 50c, black two line "1er Avion Sabena/Kindu-Stanleyville" cachet. Scarce origin. 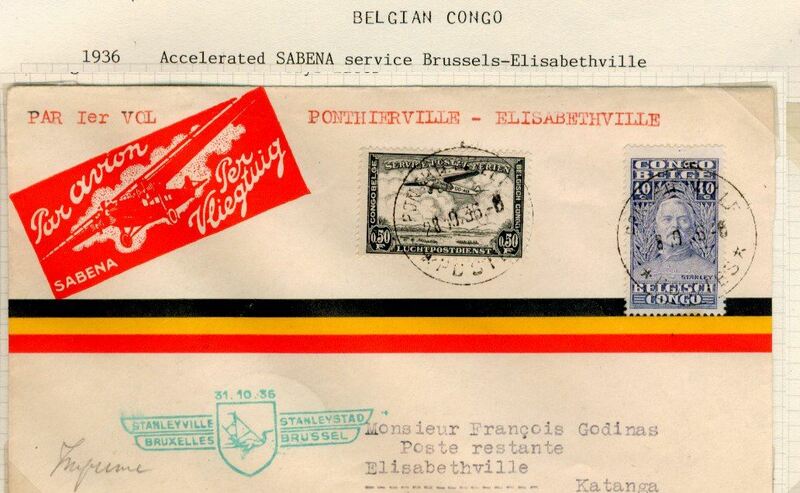 F/F Elisabethville to Kabalo, bs 30/10, carried on the accelerated Sabena service from Elisabethville-Brussels, red/yellow/black stripe airmail cover franked 60c, blue flight cachet. 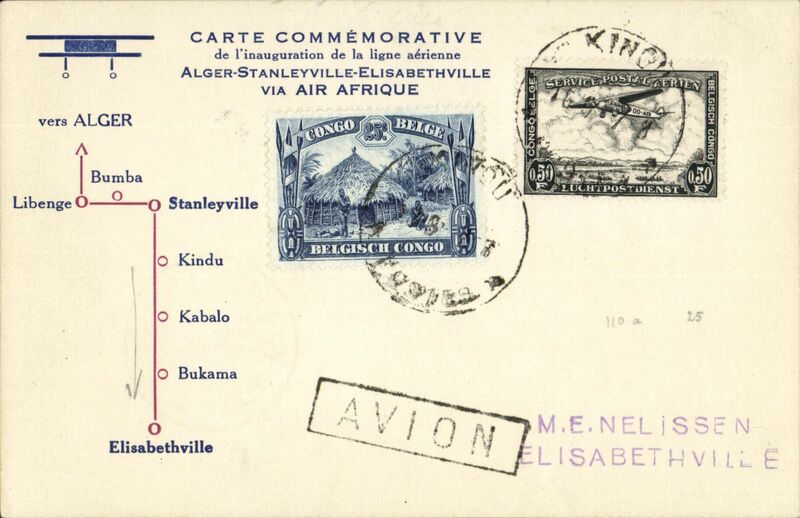 F/F Elisabethville to Ponthierville, bs 3/11, via Stanleyville 30/10, carried on the accelerated Sabena service from Elisabethville-Brussels, red/yellow/black stripe airmail cover franked 60c, blue flight cachet. F/F Elisabethville to Libenge 5/11, via Stanleyville 30/10, carried on the accelerated Sabena service from Elisabethville-Brussels, plain Van Reet cover franked 1F25, blue flight cachet. F/F Elisabethville to Fort Lamy 31/10, via Stanleyville 30/10, carried on the accelerated Sabena service from Elisabethville-Brussels, Nawratil card franked 3F, blue flight cachet. F/F Elisabethville to Paris 5/11, via Le Bourget 5/11, carried on the accelerated Sabena service from Elisabethville-Brussels, Nawratil card franked 3F90, blue flight cachet. Nice routing. F/F Elisabethville to Brussels 5/11, carried on the accelerated Sabena service from Elisabethville-Brussels, imprint etiquette cover franked 4F50, green flight cachet. 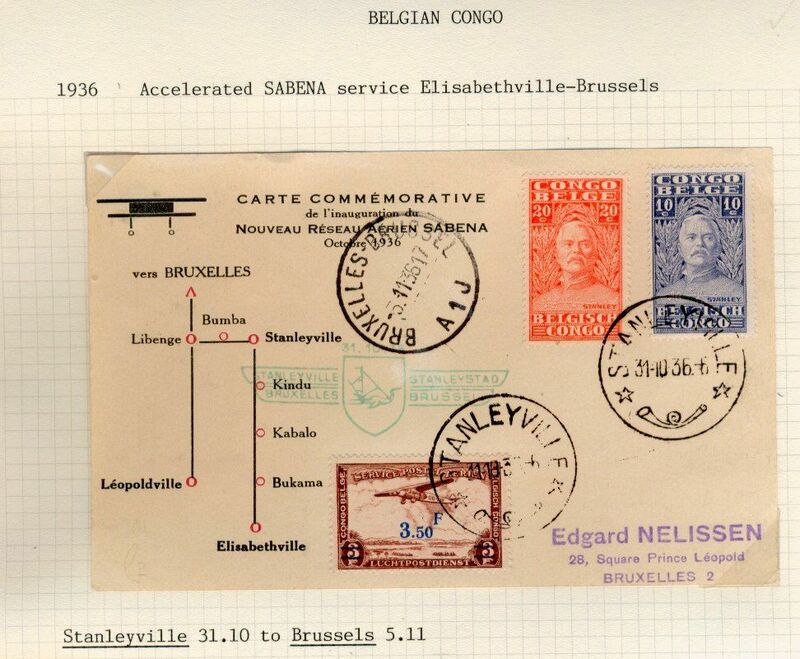 Sabena F/F accelerated Congo-Belgium service, Elizabethville to Brussels, b/s, via Stanleyville, cachet, souvenir card with diagram of route. First acceptance for the new Regie Malgache service to Madagascar, Ponthierville to Tananarive, bs 31/10, via Elisabethville 29/10, van Reet cover franked 8F50, green first flight cachet, ms "Por 1er courrier aerienne/Ponthierville-Tananarive. 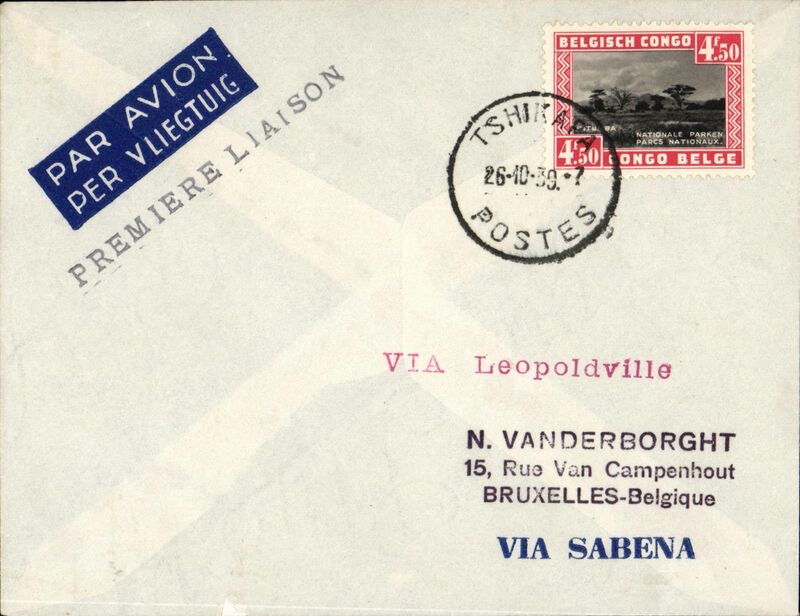 First direct flight Libenge - Leopoldville, bs 24/12, commemorative card with diagram of route, franked 1F45, Sabena. 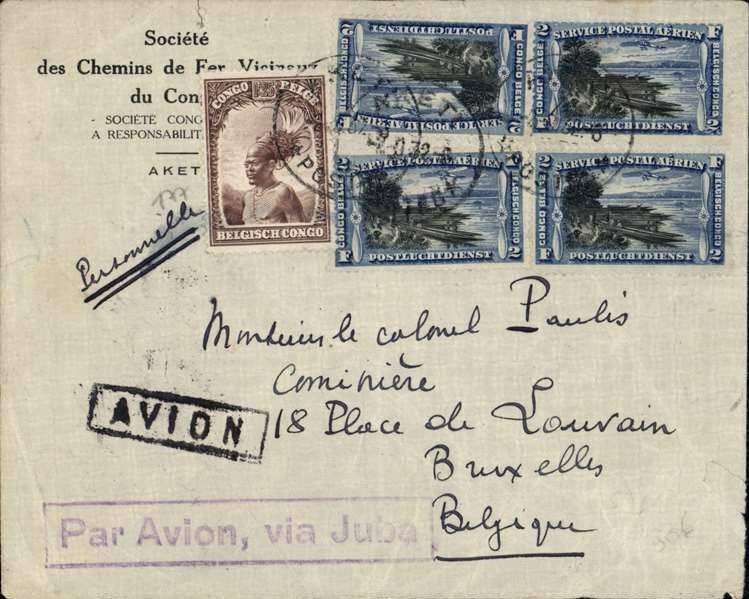 Leopoldville to Brussels, no arrival ds, imprint airmail etiquette cover franked 5F, nice strike uncommon "Par Avion/Belgique-France-Congo/Via Alger-Marseilles" cachet. Interesting. 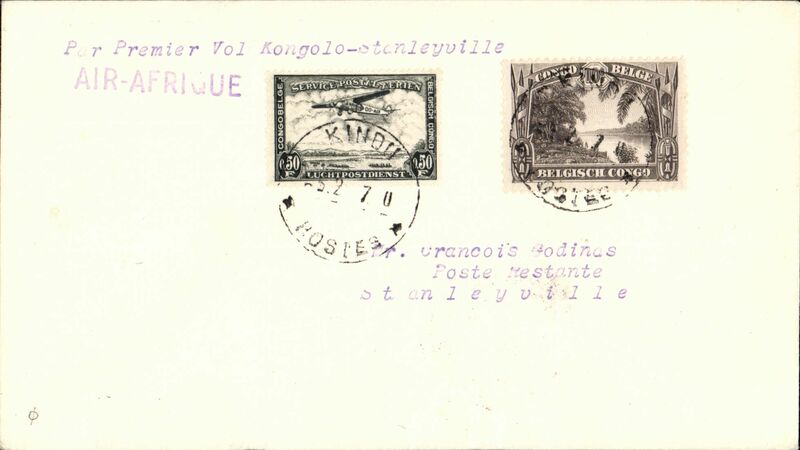 Air Afrique northwards trial flight, Kindu to Stanleyville, bs 10/2, plain cover franked 60c, "Par Premier Vol Kongolo-Stanleyville" cachet, and "Air Afrique" hs. 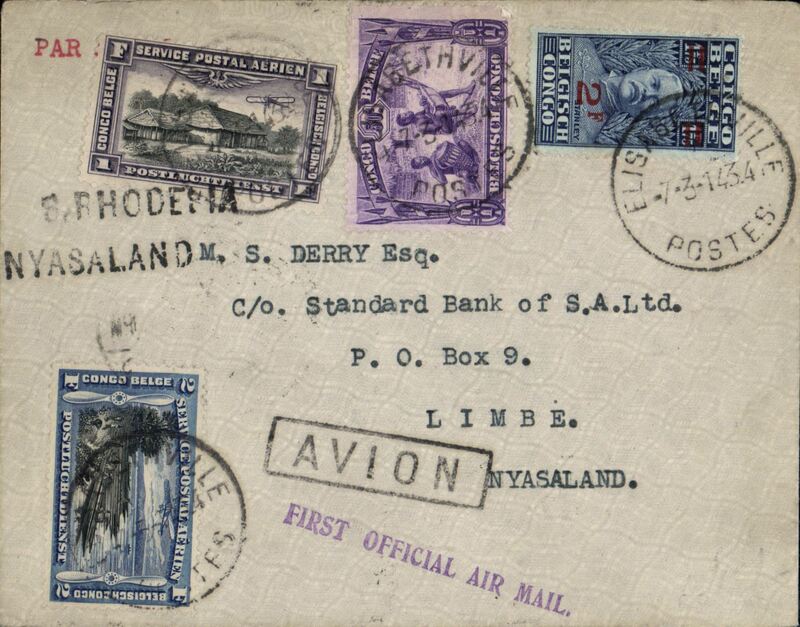 SCARCE Air Afrique Trial Flight, Iningo to Kabalo, bs 3/3, via Stanleyville 23/2 and Kongol 2/3, airmail etiquette Godinas cover franked 60c, canc Inongo cds, violet nstraight line "Air Afrique" cachet. 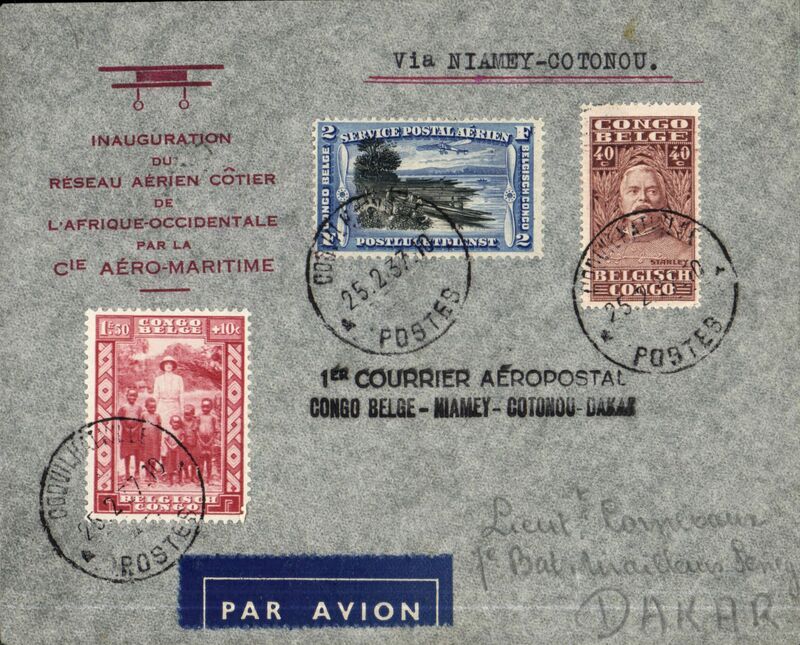 Air Afrique/Cie Transsaharienne/Aeromaritime, Congo acceptance for the F/F Cotonou to Dakar, Coquilhatville to Dakar, bs 7/3, via Niamey 28/2, red /grey souvenir cover franked 2F40 Congo stamps, printed "Inauguration de Resau Aerien Cotier/de L'Afrique Occidentale/par la/Cie Aero-Maritime", and "1er Courrier Aeropostal/Congo Belge-Niamey-Cotonau-Dakar". Super item. 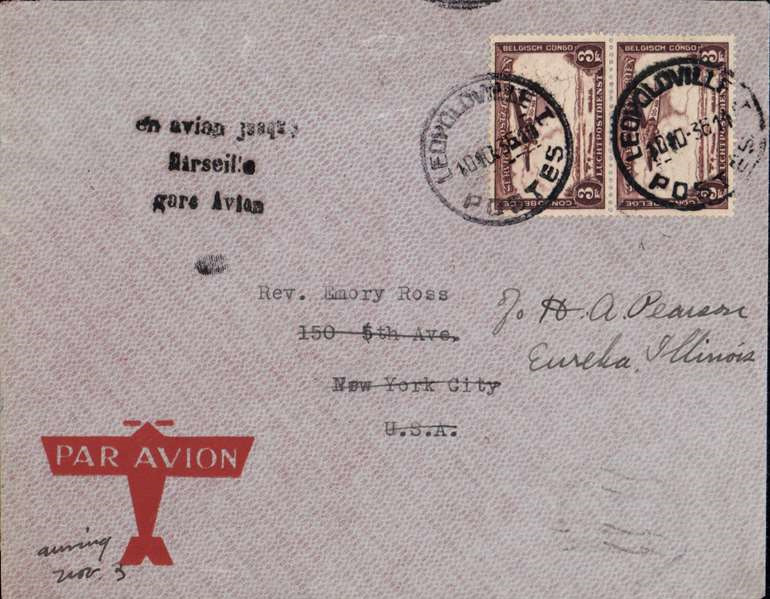 Aeropostale, F/F Pointe Noire to Dakar, bs 24/3, registered (label) airmail cover franked 11F50. 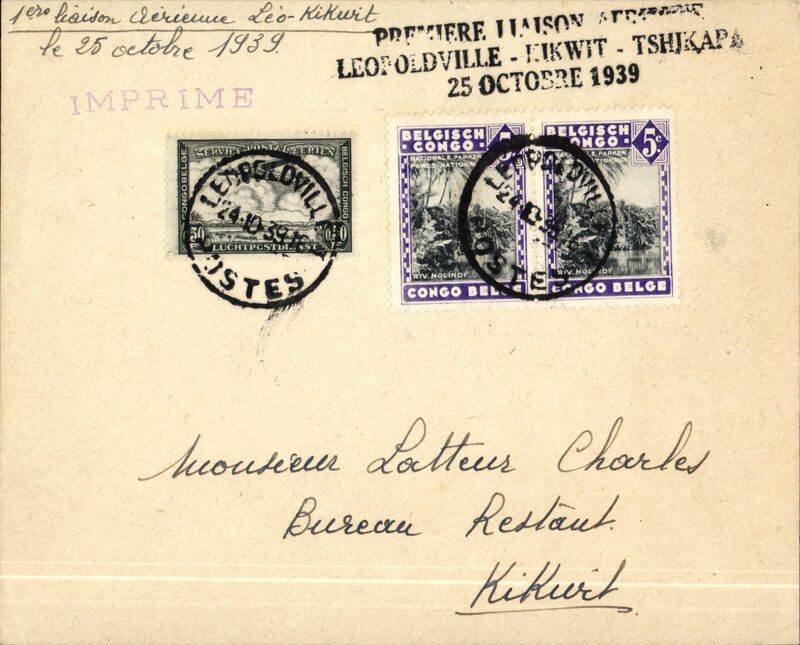 Flown cover Opal (NE Congo 550km due East Lake Edward) to Liege, Belgium, via Stanleyville 10/4, imprint etiquette cover franked 4.50F. Neat 2mm non invasive trim lh edge. 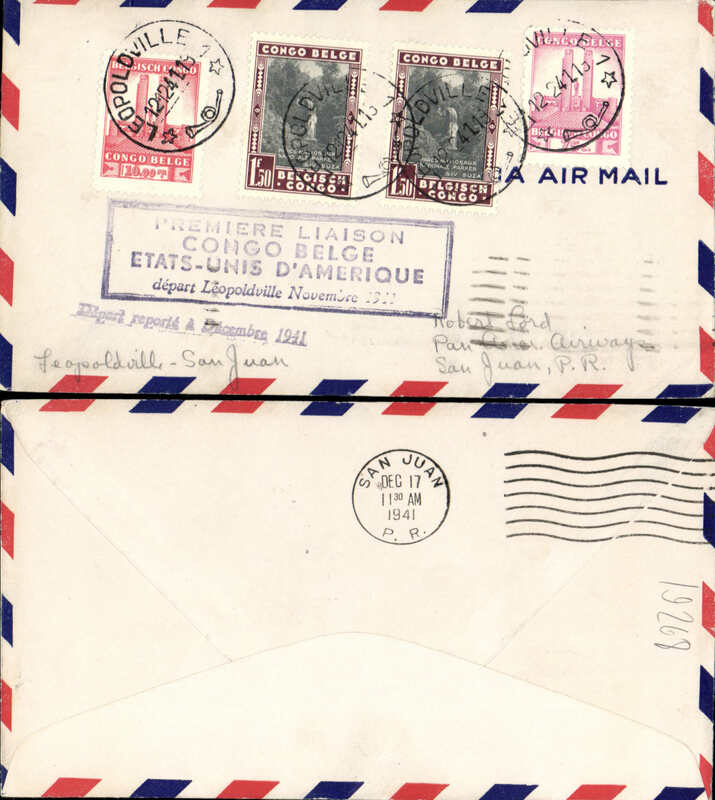 High franked flown cover from Opal (NE Congo 550km due East Lake Edward) to Liege, Belgium, via Stanleyville 10/4, plain cover ms '15g' and 'Par Avion', franked 11.00F. Neat 2mm non invasive trim lh edge. 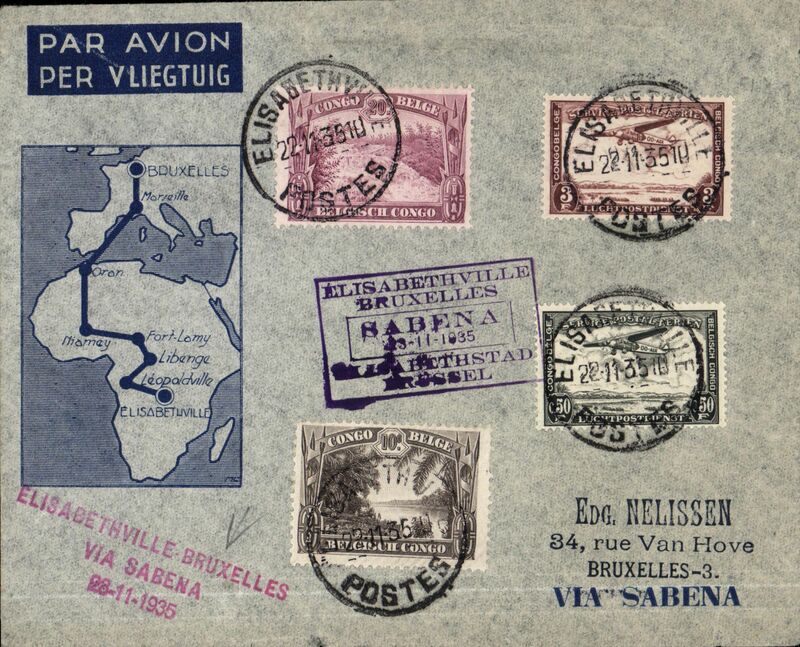 F/F accelerated Air Afrique connection Elisabethville-Europe, Bumba to Brussels, bs Esnaux 9/6, Godinas cover franked 4F85, underpaid with 10c postage due and black 'T' hs, black three line "Premier avion/Air Afrique/Bumba-Bangui-Europe" flight cachet, violet "Par Premier Vol Bumba-Bruxelles" and "Air Afrique" hs's. 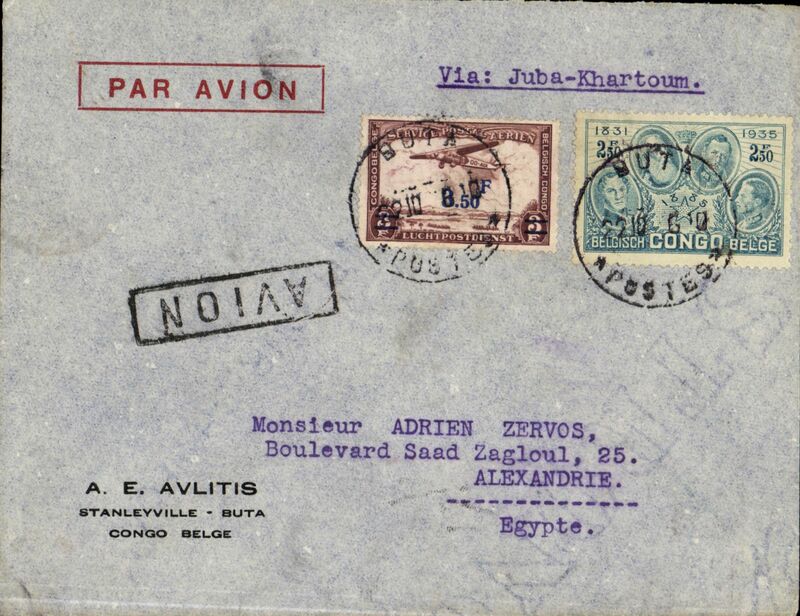 F/F accelerated Air Afrique connection Elisabethville-Stanleyville, bs 4/6, cover franked 60c, typed "Avion Air Afrique:Premier Laison Via Stanleyville Juin 1937". 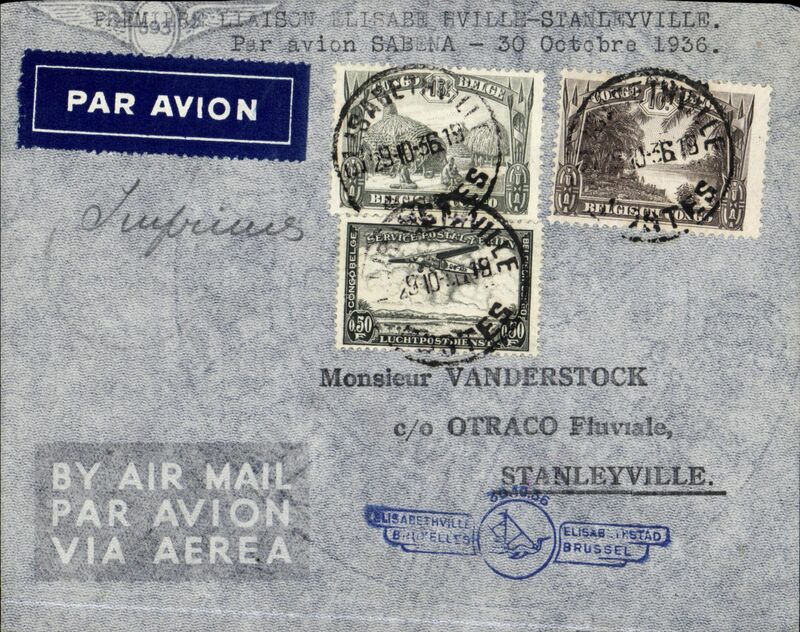 F/F accelerated Air France connection Elisabethville-Europe, Kabalo to Stanleyville, bs 4/6, red/yellow/black 'stripe' Godinas cover franked franked 60c, "Air Afrique" hs, ms "Kabalo-Stanleyville". 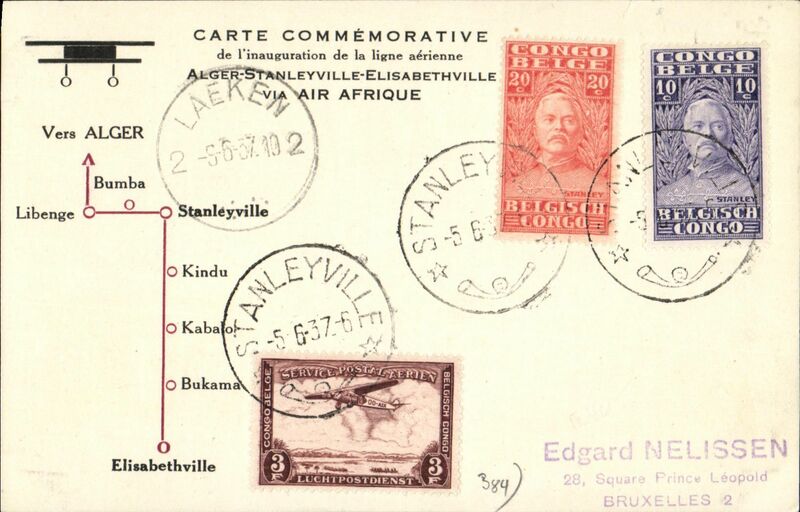 F/F accelerated Air Afrique connection Elisabethville-Europe, Stanleyville to Brussels, Laeken 9/6 arrival ds on front, bs Esnaux 9/6, commemorative card with diagram of route franked 3F30. 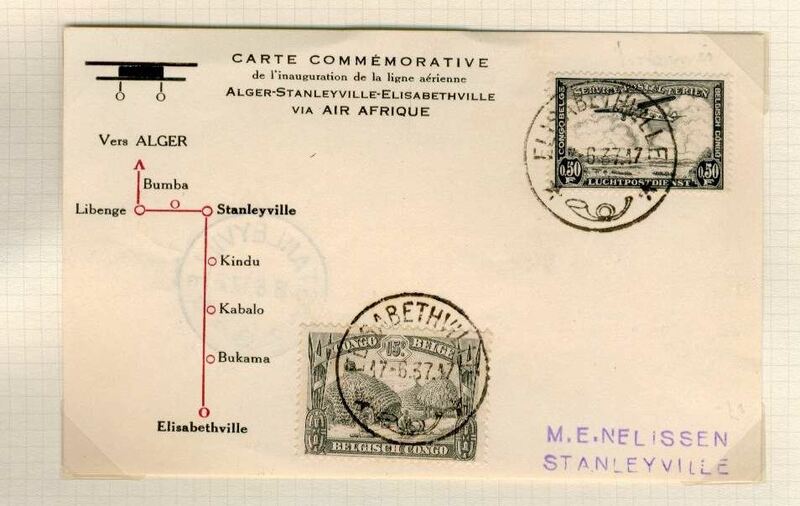 F/F accelerated Air Afrique connection Algiers-Elisabethville, Bumba to Stanleyville, bs 16/6, commemorative card with diagram of route franked 65c, black three line "Premier avion/Air Afrique/Bumba-Stanleyville-Elisabethville" flight cachet. 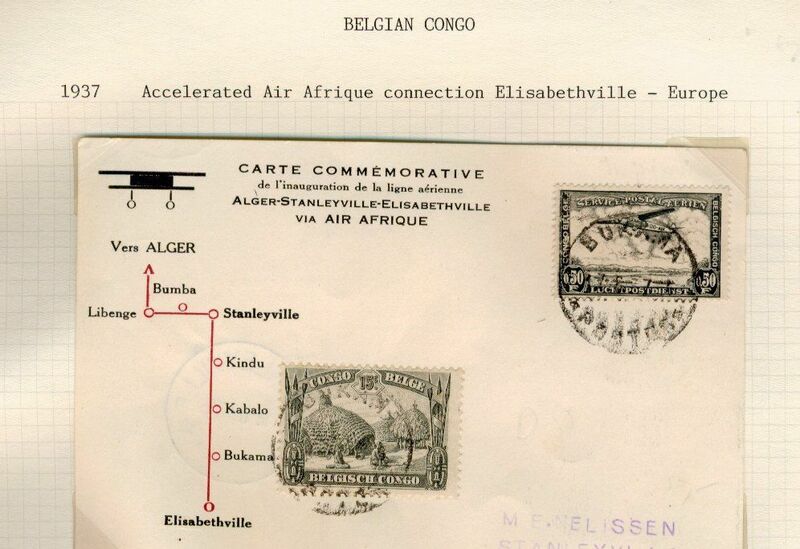 F/F accelerated Air Afrique connection Algiers-Elisabethville, Kindu to Elisabethville, bs 17/6, commemorative card with diagram of route franked 75c, black framed 'Avion' hs. Second Air Afrique flight, Elizabethville to Stanleyville, bs 18/6, Nelissen souvenir card with diagram of route, franked 65c. Second Air Afrique flight, Bukama to Stanleyville, bs 18/6, Nelissen souvenir card with diagram of route, franked 65c. 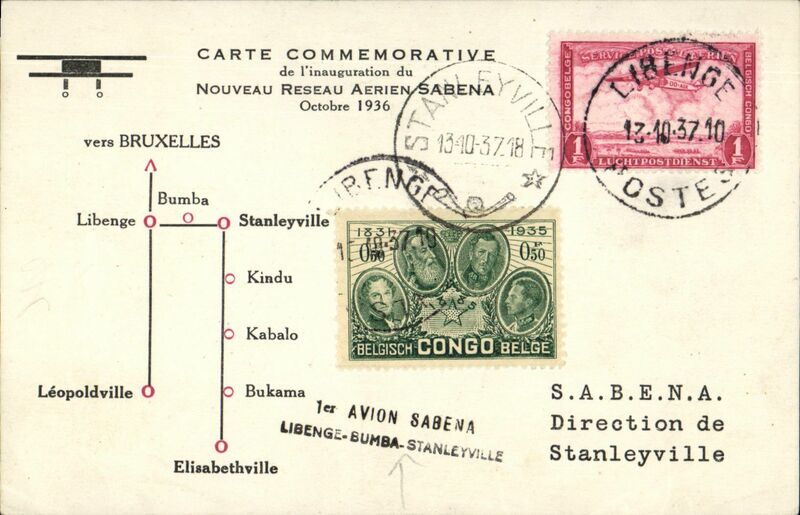 Sabena, first mail from Libenge to the interior of the Congo, Libenge to Bukama, no arrival ds, commemorative card with map of route, franked 1F50, black two line "1re Avion Sabena/Libenge-Bumba-Stanleyville". 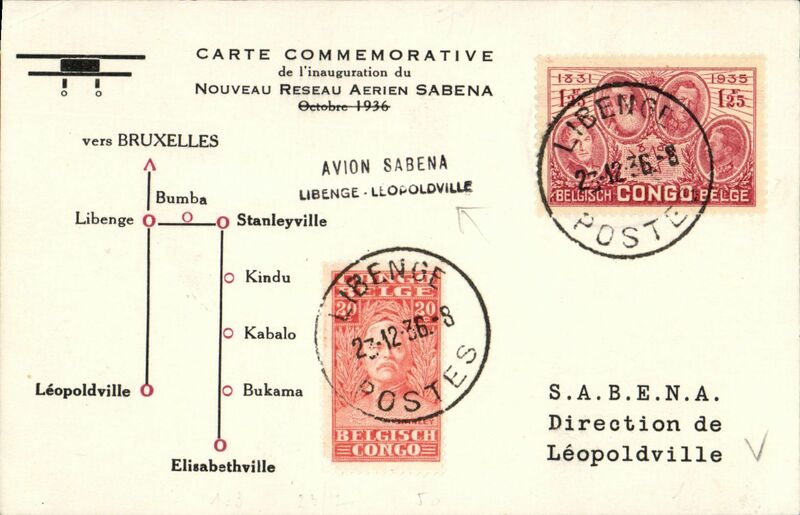 Sabena, first mail from Libenge to the interior of the Congo, Libenge to Stanleyville, bs 13/10, commemorative card with map of route, franked 1F50, black two line "1re Avion Sabena/Libenge-Bumba-Stanleyville". 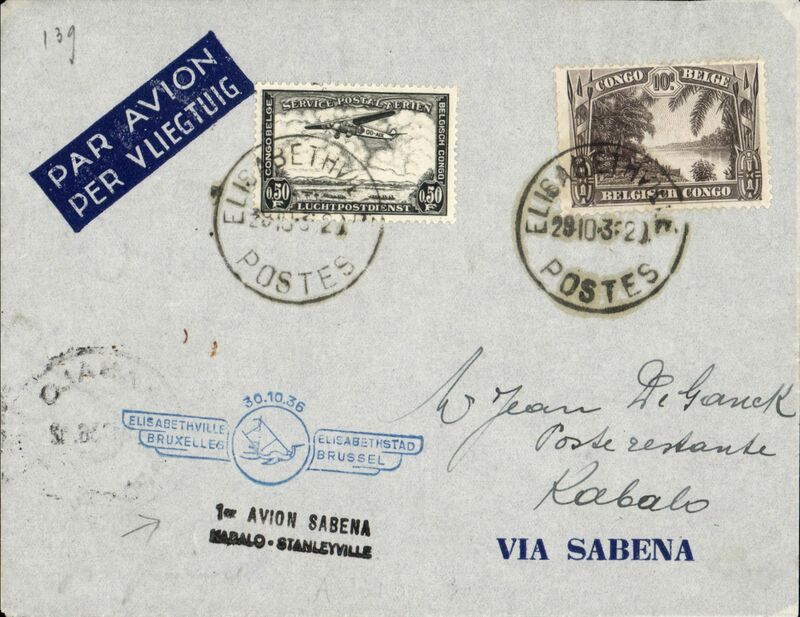 First direct Sabena flight from Europe to Libenge to Lisala, bs 17/10, via Bumba, 13/10, plain cover franked 60c, black two line "1er Avion Sabena/Libenge-Bumba-Stanleyville" cachet, typed "Par 1er vol direct Libenge-Lisala". 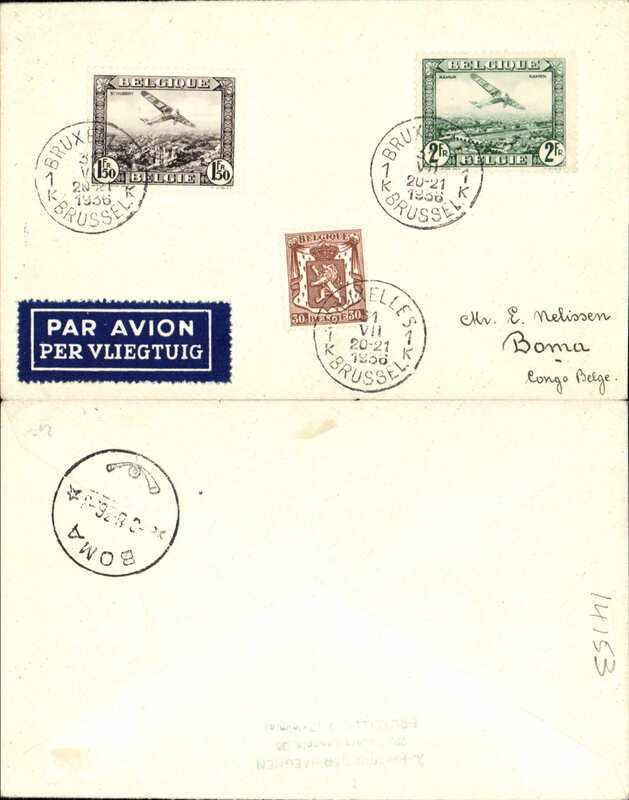 The cover left the aircraft at Bumba and was taken on to Lisala by the internal airmail service. Nice item with great routing. 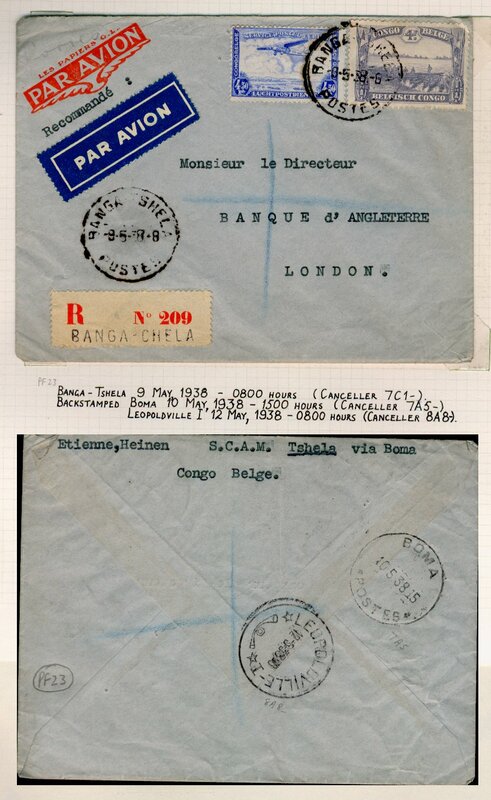 Western Congo to England, Banga Tshela to London, no arrival ds, via Boma 10/5 and Leopoldville 12/5, registered (label) commercia airmail etiquette cover franked 8.5F. Likely surface to Boma (250 miles), then Sabena internal service to Leopoldville (150 miles), then OAT to Brussels and London. Uncommon origin. 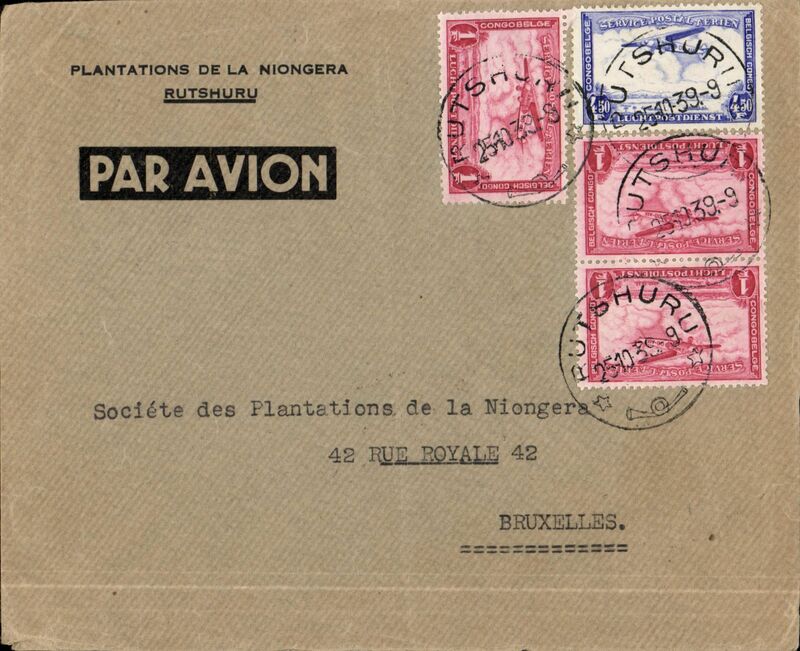 Commercial flown cover Goma, Nr Lake Kuvu, to Belgium, via Costermansville 20/7, printed 'Compagnie Immobiliere du Nord du Kivu' company cover, black boxed 'Utiliser L'Avion' hs, correctly rated 2.40F. Internal airmail, Coquilhatville to Jadotville, bs 19/9, via Luluabourg, 15/9 transit cds, imprint airmail cover franked 3F 25. Nice routing. 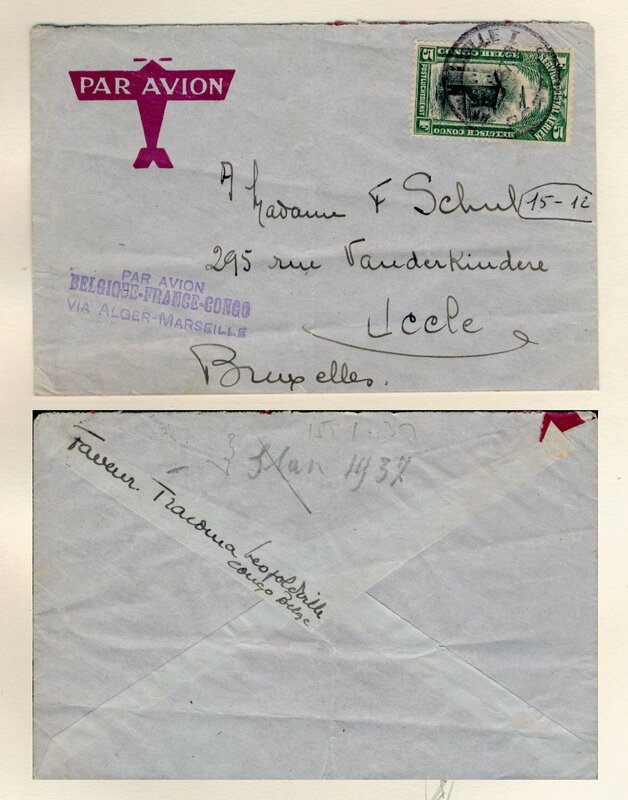 Leopoldville to Brussels, via Paris 8/11, plain etiquette cover addressed to the Societe Muphila, franked 3F 3. Nizi to Brussels, imprint etiquette cover franked 4F 30, black two line cachet commemorating the 100th flight Congo-Belgium, Sabena. Uncommon origin. 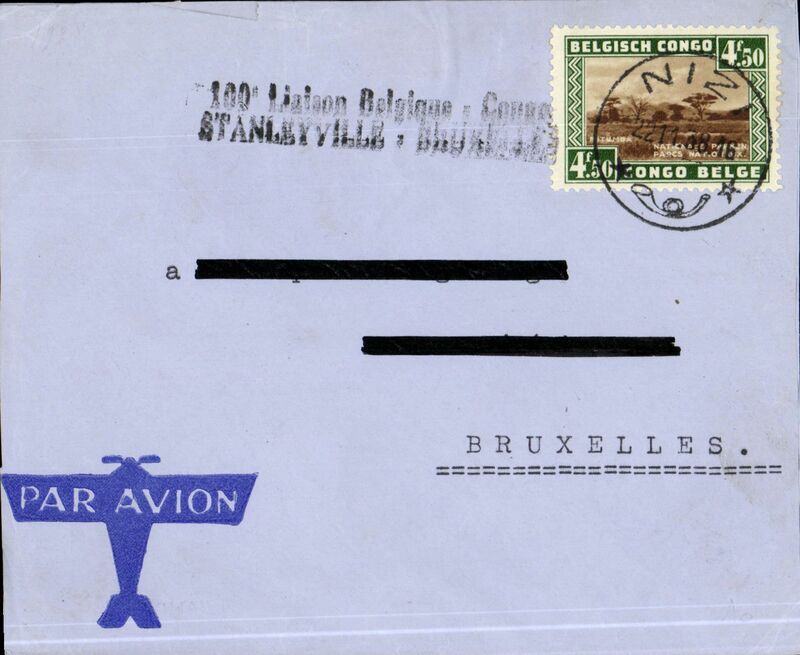 Sabena, Bumba to Brussels, bs, 30/11, souvenir cover commemorating the 100th flight Congo-Belgium, franked 3F50, uncommon black oval hs. 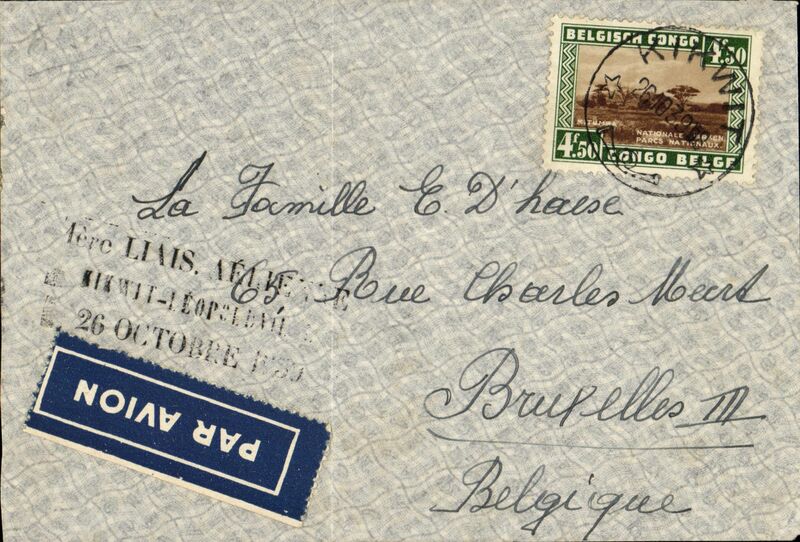 Stanleyville to Brussels, Belgium, plain cover franked 5F, black two line "100 Laison Belgique-Congo/Stanleyville-Bruxelles" cachet, Sabena. 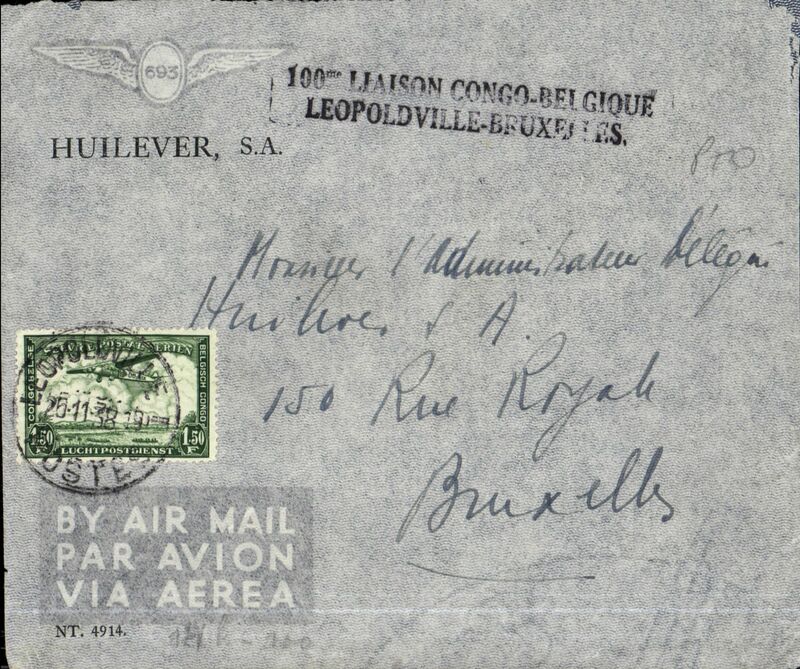 Stanleyville to Eghezee, Belgium, plain cover franked 3F 30, green 'winged' cachet commemorating the 100th flight Congo-Belgium, Sabena. 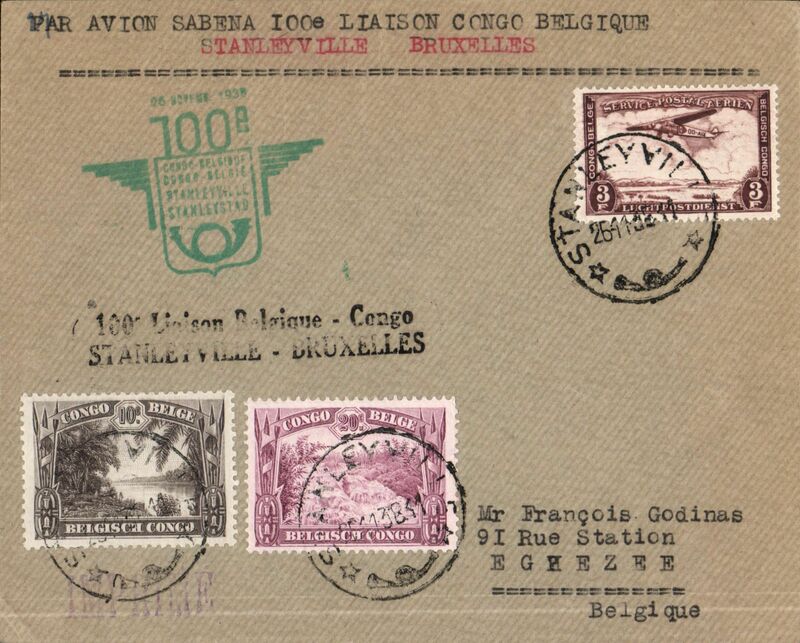 Leopoldville to Brussels, imprint etiquette cover franked 3F 30, black two line cachet commemorating the 100th flight Congo-Belgium, Sabena. 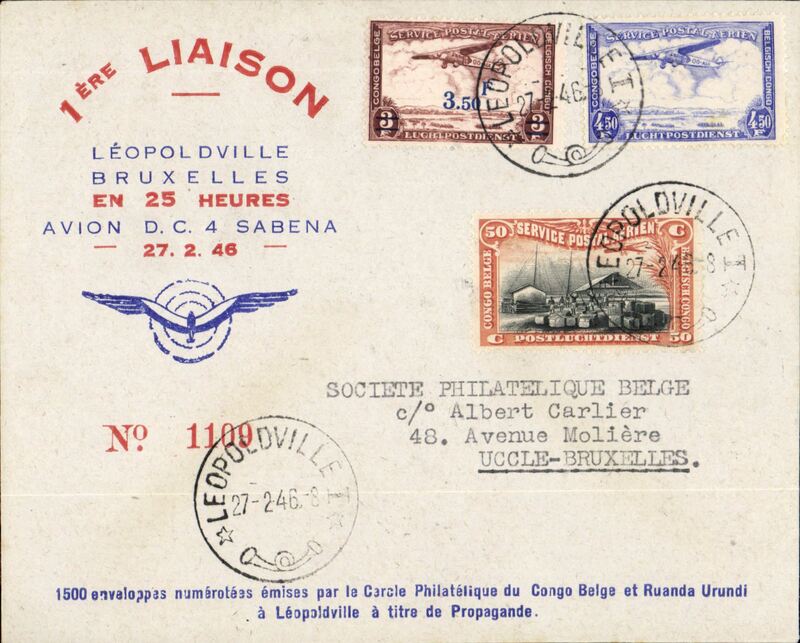 Leopoldville to Brussels, imprint etiquette cover franked 16 x 1F 50 stamps (15 verso), black two line cachet commemorating the 100th flight Congo-Belgium, Sabena. Commercial cover with exceptionally high franking. 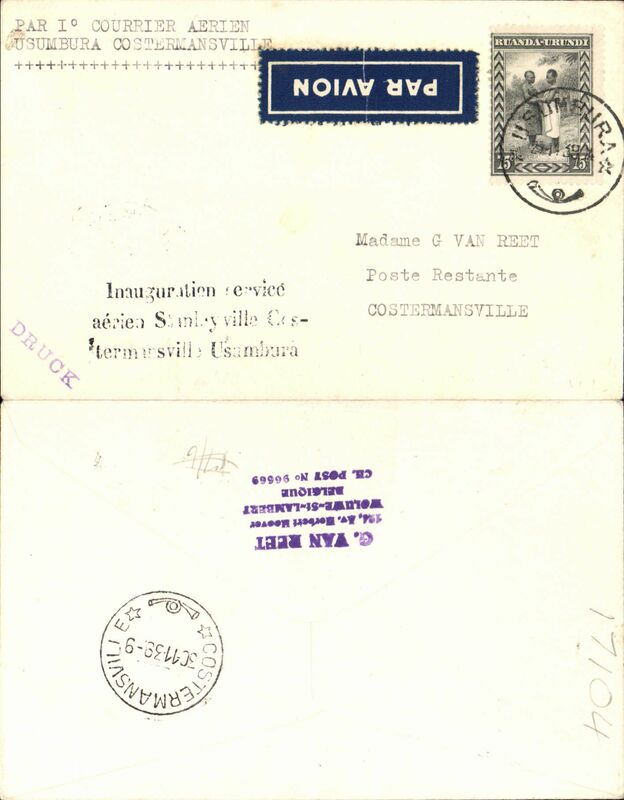 Internal airmail, Jadotville to Coquilhatville, bs 119/3, via Elisabethville 16/3, airmail etiquette cover franked 2.25F. Nice routing. 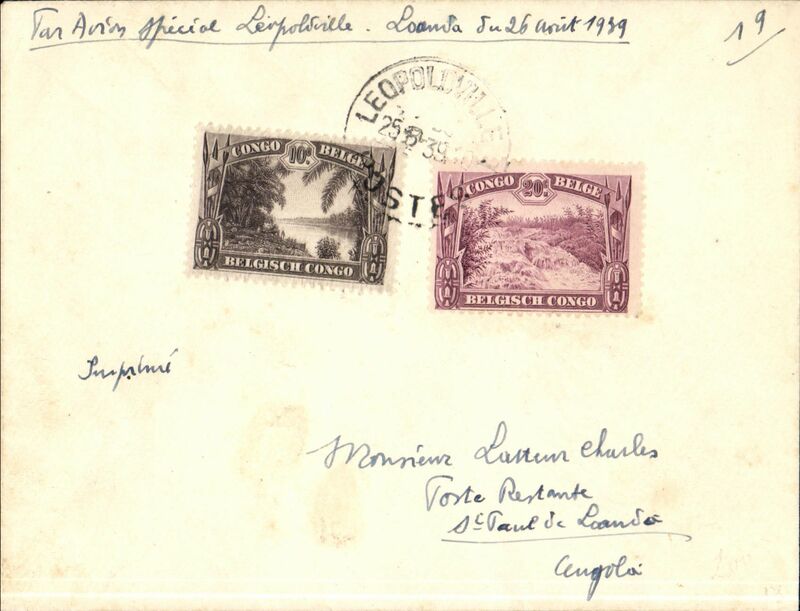 Special flight Congo to Angola, Leopoldville-Kalina to Loanda, bs 26/8, and return from Loanda 31/8 to Leopoldville-Kalina, 1/9, imprint etiquette cover franked 30c Congo and 1A 75 Angola stamps, ms "Liaison speciale (Sabena) Leo-Luanda et retour -Voyage du Governor General/Depart 26 Aout 1939/Retour 31 Aout 1939". Carried the Governor General of the Congo to meet the President of Portugal who was visiting Angola. Also a survey flight to see if it was worth extending the Sabena route as far as angola. A rare item, only 20 flown on each outward and return leg. 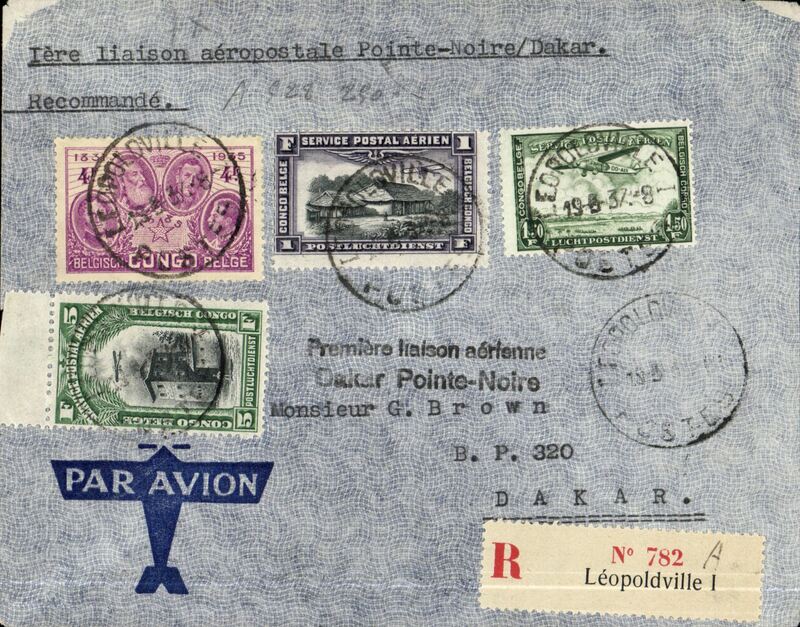 So this item is likely to be even scarcer..
Special flight Congo to Angola, Leopoldville to Loanda, bs 26/8, plain cover franked 30c, ms "Par Avion Special Leopoldville-Loanda du 26 ASout 1939". Carried the Governor General of the Congo to meet the President of Portugal who was visiting Angola. Also a survey flight to see if it was worth extending the Sabena route as far as angola. Scarce, only 20 flown. 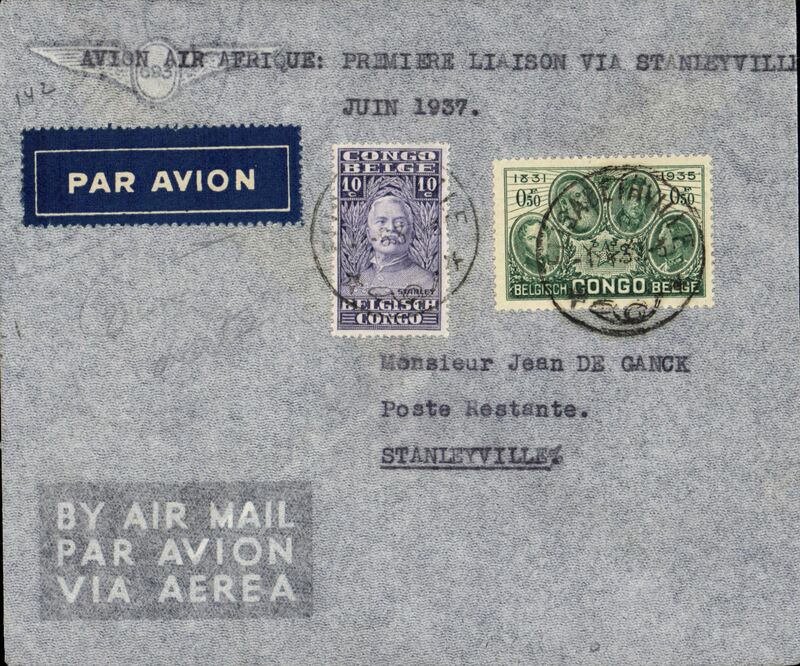 Special flight Congo to Angola, Leopoldville to Loanda, bs 26/8, plain cover franked 30c, ms "Par Avion Special Leopoldville-Loanda du 26 Aout 1939". Carried the Governor General of the Congo to meet the President of Portugal who was visiting Angola. Also a survey flight to see if it was worth extending the Sabena route as far as angola. A rare item, only 20 flown. 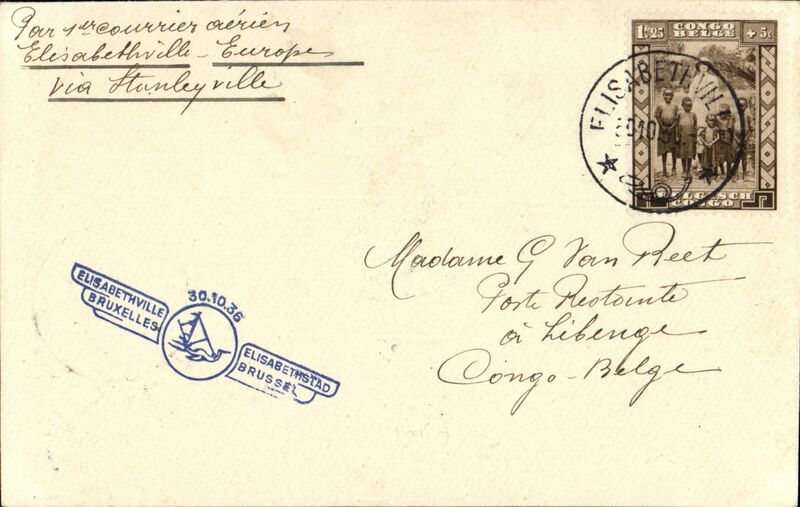 F/F new service, Leopoldville to Tshikapa, bs 25/10, via Kikwit, plain cover franked 60c, black three line F/F cachet. F/F new service, Leopoldville to Kikwit, bs 25/10, plain cover franked 60c, black three line F/F cachet. 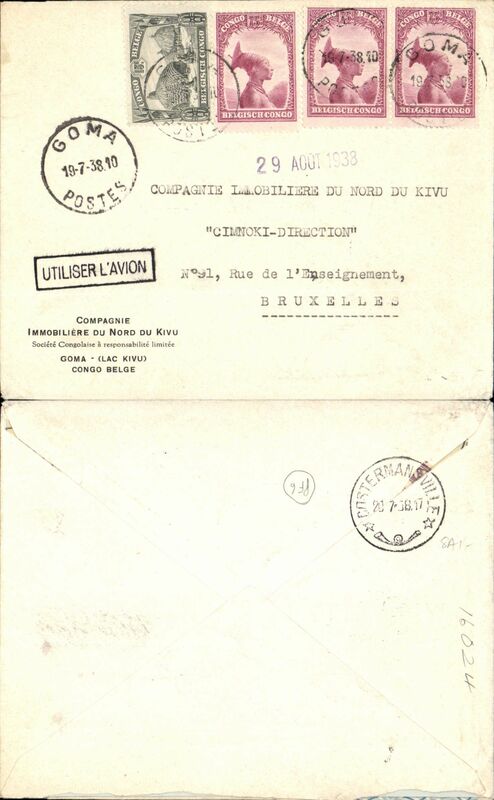 Kikwit to Brussels, no arrival ds, carried on F/F new service, Kikwit to Leopoldville, plain cover franked 4F50, black "1ere Laison/Kikwit-Leopoldville/26 Octobre 1939". 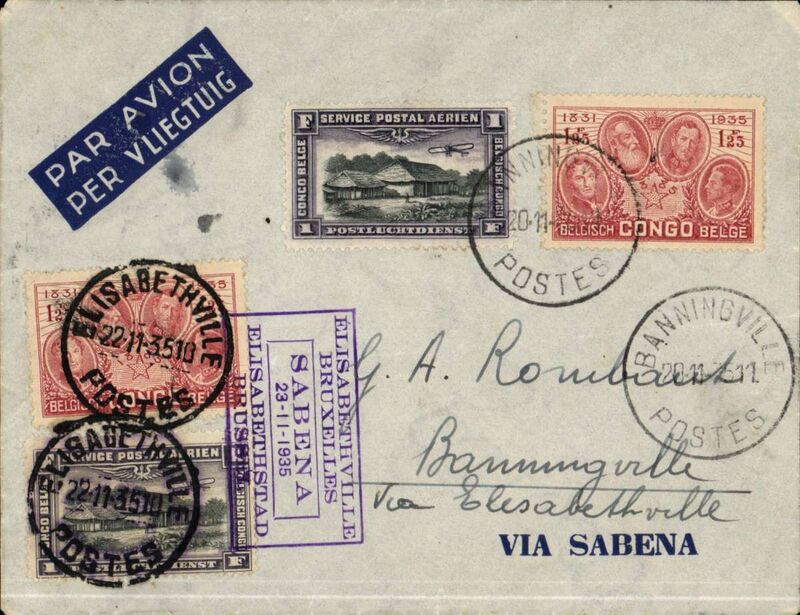 The Imperial Airways connection, Rutshuru to Brussels, no arrival ds, via Irumu 1/11 and Aba 6/11, Sabena, imprint etiquette 'Plantations de la Niongera' corner cover franked 7.50F canc Rutshuru cds. Likely surface to Aba, then Imperial Airways to Europe. Extension Leopoldville-Tshikapa to Luebo, Tshikapa to Luebo, no arrival ds, imprint etiquette cover franked 60c, black st. line "Premier Liaison" cachet. Extension Leopoldville-Tshikapa to Luebo, Kikwit to Luebo, no arrival ds, via Tshikapa, 25/10 transit cds, imprint etiquette cover franked 60c, black st. line "Premier Liaison" cachet. F/F new service, Tshikapa to Brussels, no arrival ds, imprint etiquette cover franked 4F 50, black straight line 'Premier Laison' and red straight line 'Via Leopoldvillle' cachets. Extension Leopoldville-Tshikapa service to Luebo,F/F Luebo to Tshikipa, bs 1/11, imprint etiquette cover franked 60c, bkack st. line "Premier Laison" cachet. 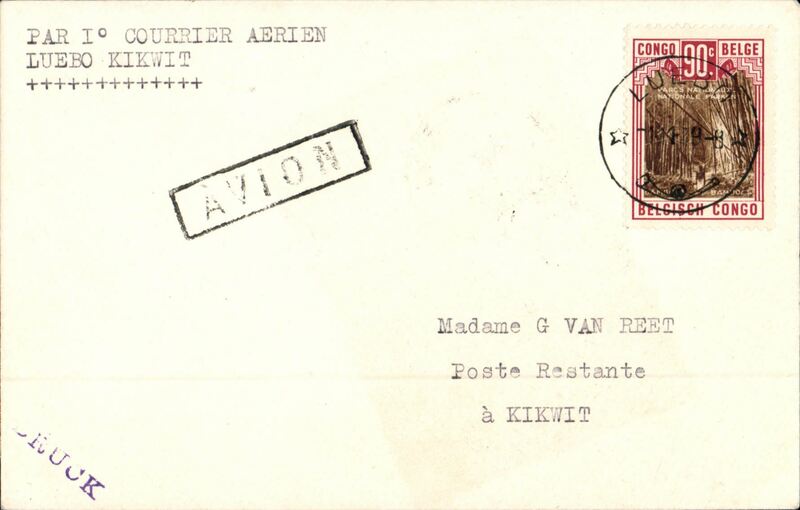 Luebo to Kikwit, bs 1/11, carried on F/F Luebo-Tshikakapa-Leopoldville service, Van Reet cover franked 90c, black framed "Avion" cachet, typed "Par 1o Courrier Aerien/Luebo Kikwit". Uncommon. 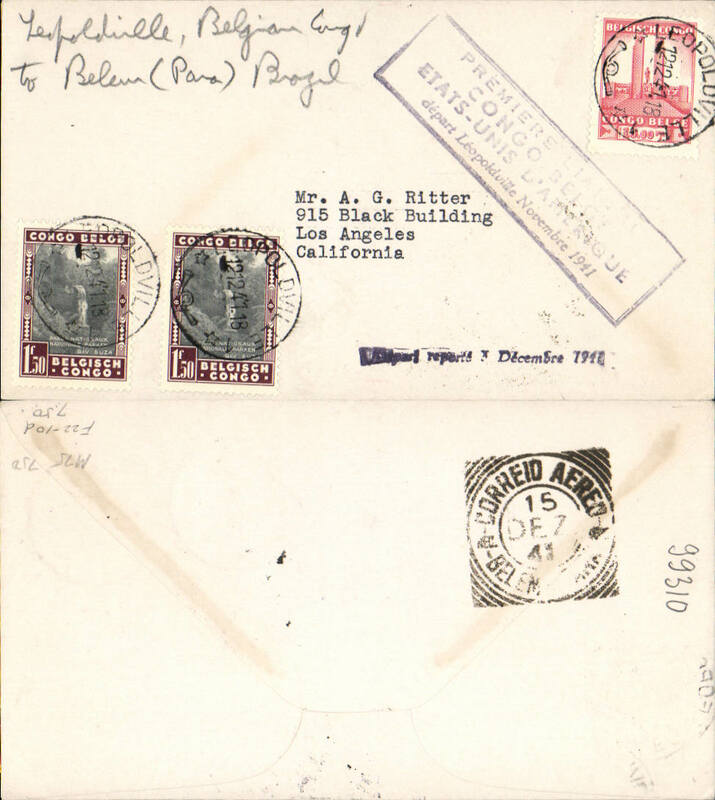 Air Afrique/Pan Am Transatlantic early airmail, World War II uncensored registered (label) cover to Chicago, bs 15/12, blue/grey imprint 'plane' airmail etiquette franked 18.50F, canc Coquilhatville cds, carried by Air Afrique to Marseilles, then Pan Am FAM 19 to New York via Lisbon and Horta, uncommon black three line "Par Avion/De (ms New York)/A (ms Marseille)" directional hand stamp. Scarce early WWII item. WWII, F/F new Sabena internal route between Stanleyville and Usumbura, Stanleyville to Irumu, bs 28/11, plain cover franked 60c, ms '1 iere laison aerien par Sabena Stanleyville-/Le 26 novembre 1939"
WWII, F/F new Sabena internal route between Stanleyville and Usumbura, Usumbura to Nia Nia, and on to Irumu 30/11, plain cover franked 75c, ms 'Par 1 iere corrier aerien Usumbura-Nania". The previously arranged stage to Nia Nia was cancelled. A nice little specialist item. 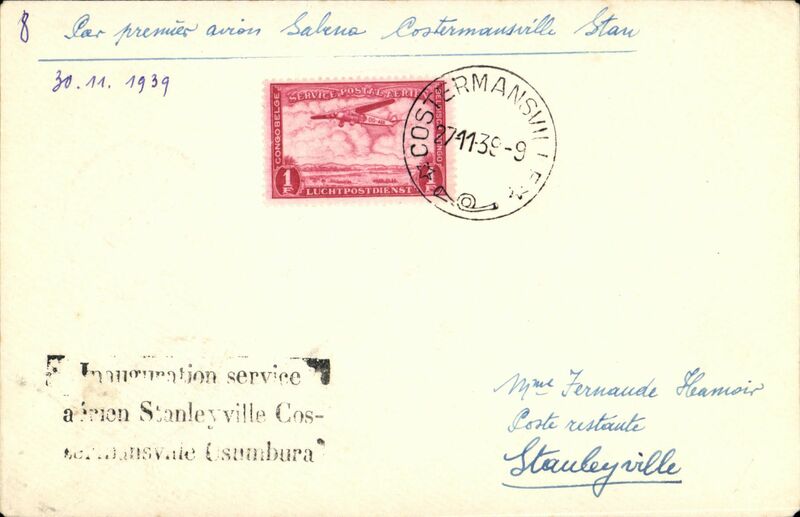 WWII, F/F new Sabena internal route between Stanleyville and Usumbura, Stanleyville to Costermansville, bs 28/11, plain cover franked 60c, typed '1 iere laison aerien par Sabena Stanleyville-/Le 26 novembre 1939"
Costermansville to Irumu, bs 30/11, carried on F/F new SABENA Eastern Congo internal route Stanleyville-Costermansville-Usumbura, blue/grey 'Via Sabena' cover, franked 60c, black three line "Inauguration service/aerien Stanleyville-Costermansville-Usumbura", black straight line "Premier Laison" hs. 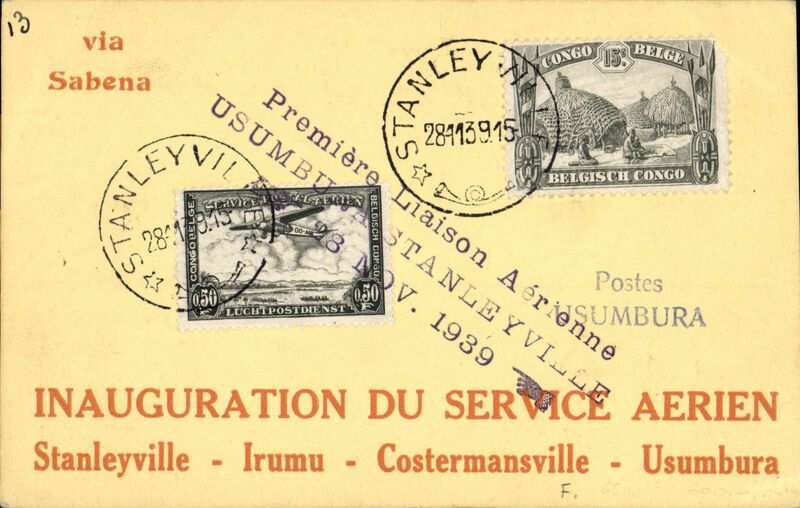 F/F new SABENA Eastern Congo internal route Usumbura to Stanleyville, bs 30/11, printed yellow/orange souvenir card "Inauguration Du Service Aerien/Stanleyville-Irumu-Costermansville-Usumbura" franked 65c, dark blue/white airmail etiquette. F/F new SABENA Eastern Congo internal route Usumbura to Costermansville, bs 30/11, plain Van Reet cover franked 75c, typed "Par 1o Courrier Aerien/Usumbura to Costermansville", dark blue/white airmail etiquette. F/F new SABENA Eastern Congo internal route Stanleyville to Goma(Costermansville), via Costermansville, bs 30/11, plain imprint etiquette cover franked 60c, black straight line "Premier Laison" hs. Goma was added as an extra point. It is situated on the far side of Lake Kiva, some 70 miles from Costermansville. WWII, F/F new Sabena internal route between Stanleyville and Usumbura, Stanleyville to Usumbura, bs 29/11, red/cream 'Via Sabena' souvenir card franked 65c, fine strike three line flight cachet. 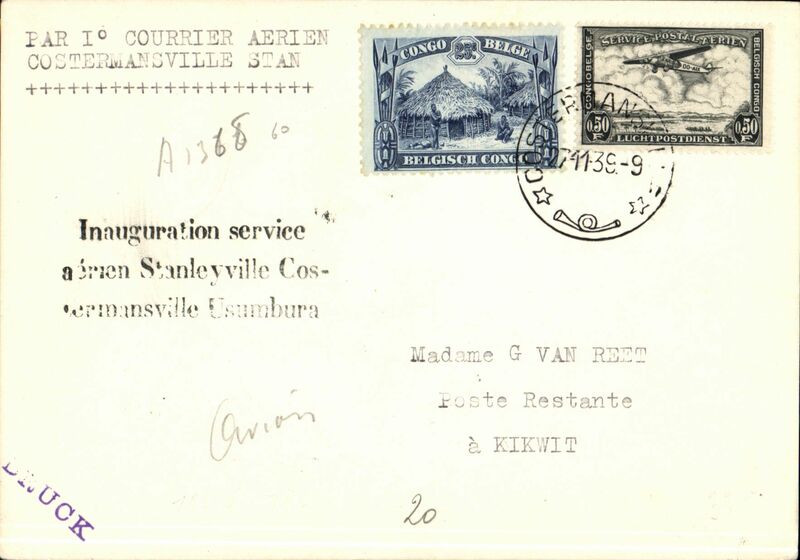 WWII, F/F new Sabena internal route between Stanleyville and Usumbura, Costermansville to Stanleyville 30/11, and on to Kikwit, bs 18/12, plain cover franked 75c, black three line 'Stanleyville-Costermansville-Usumbura' flight cachet, typed 'Premier Courrier Aerien/Costermansville-Stan'. Sabena F/F Costermansville to Stanleyville, bs 30/11, plain cover franked 1F, black three line F/F cachet. 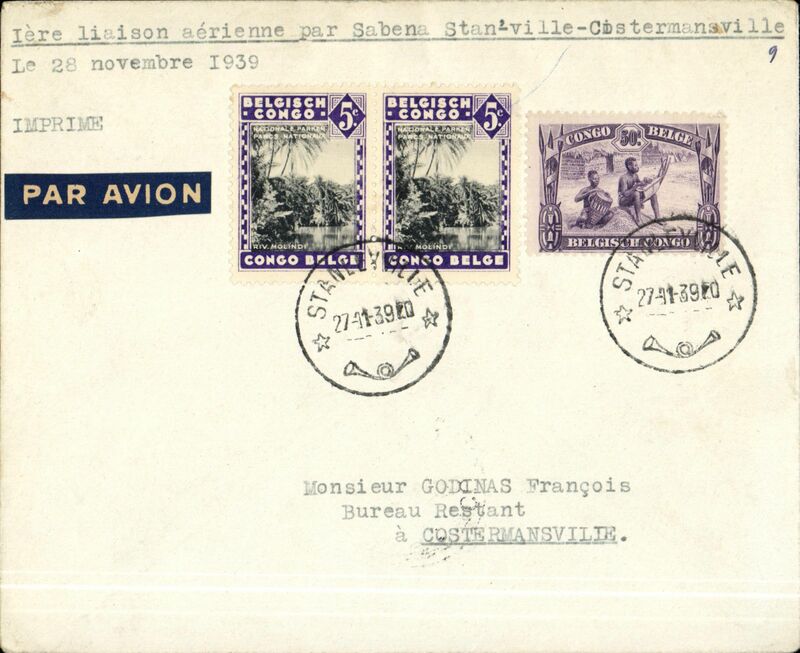 WWII, F/F new Sabena internal route between Stanleyville and Usumbura, Irumu to Nia Nia, via Stanleyville 30/11, plain cover franked 1F, ms 'Par Premier avion 1 iere laison aerien par Sabena Stanleyville-/Le 26 novembre 1939". The previously arranged stage to Nia Nia was cancelled. A nice little specialist item. 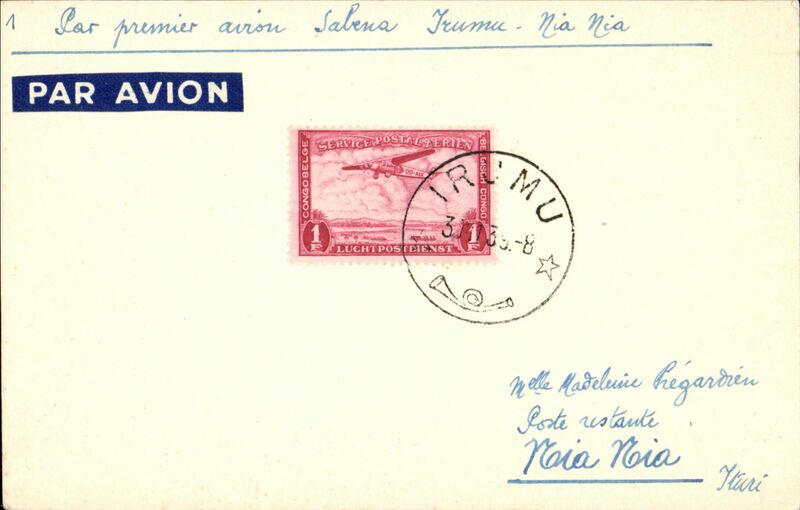 Early World War II uncensored registered (label) airmail cover to Italy, bs San Remo 8/2, via Genoa 7/2, grey printed commercial cover franked 9F, canc Elizabethville cds, typed "Recommandee/via Luluabourg", dark blue/white airmail etiquette. The Congo remained neutral until Germany invaded Belgium in May 1940, after which, acting as an independent nation, it declared war on Germany and actively assisted the Allies by allowing open access to its airports and other facilities. Ref Boyle pp 45, 725-727. Uncommon early WWII item. 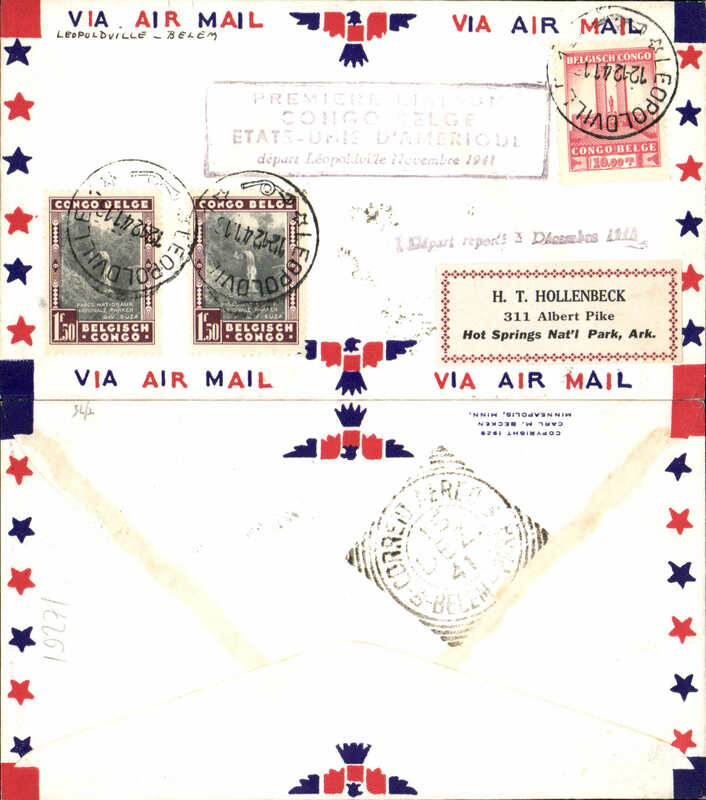 WWII censored air cover, Stanleyville to London via Leopoldville, 10/5 transit cds, imprint etiquette cover franked 6F, sealed Bermuda B&W PC90 OBE examiner 380 censor tape. 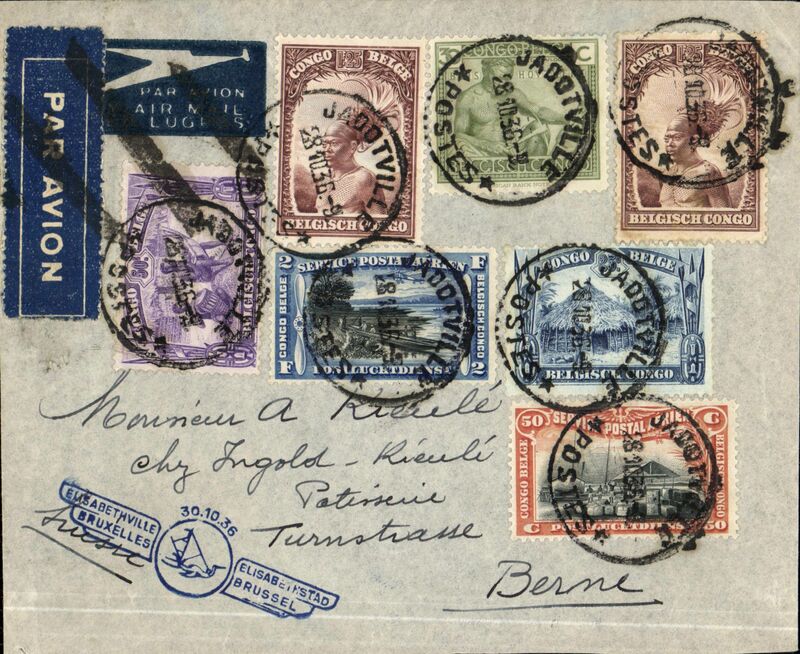 This cover bears a Bermuda censor, which suggests it might be two ocean mail via Pan Am, although it is only franked at the 'airmail to Europe rate of 3F 50 (+2.5F overseas rate). Interesting. 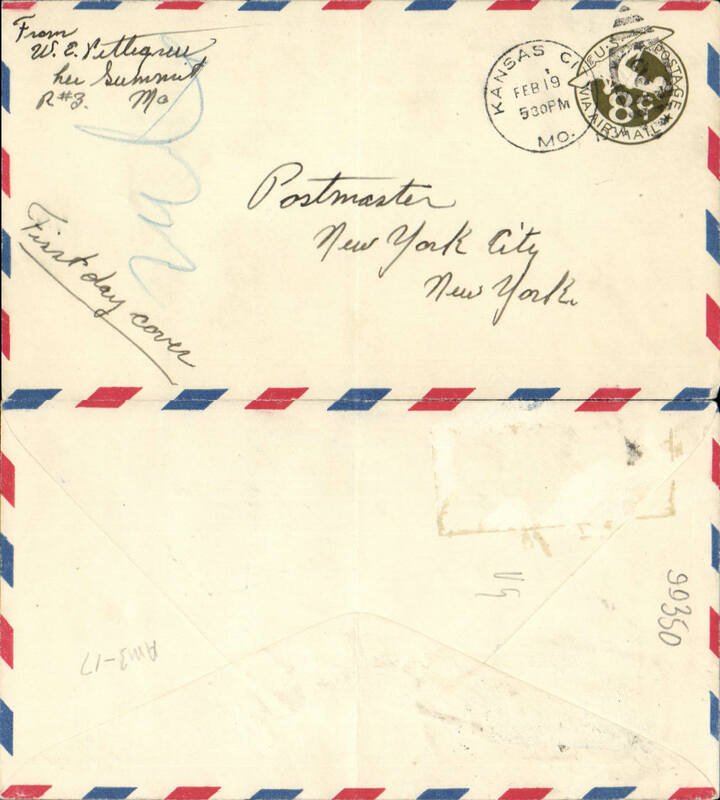 Wartime airmail to the USA, Leopoldville to New Jersey, ms receiver '7/4/41' verso, imprint etiquette cover franked 8F 25, typed "Via Matadi-Lisbonne/Par Clipper Lisbonne-New York". The Matadi transit stamp indicates passage by ship from that port. Thus, likely carried by sea to Lisbon, via Matadi, then flown Pan Am FAM18 to New York. Also uncensored . Interesting. 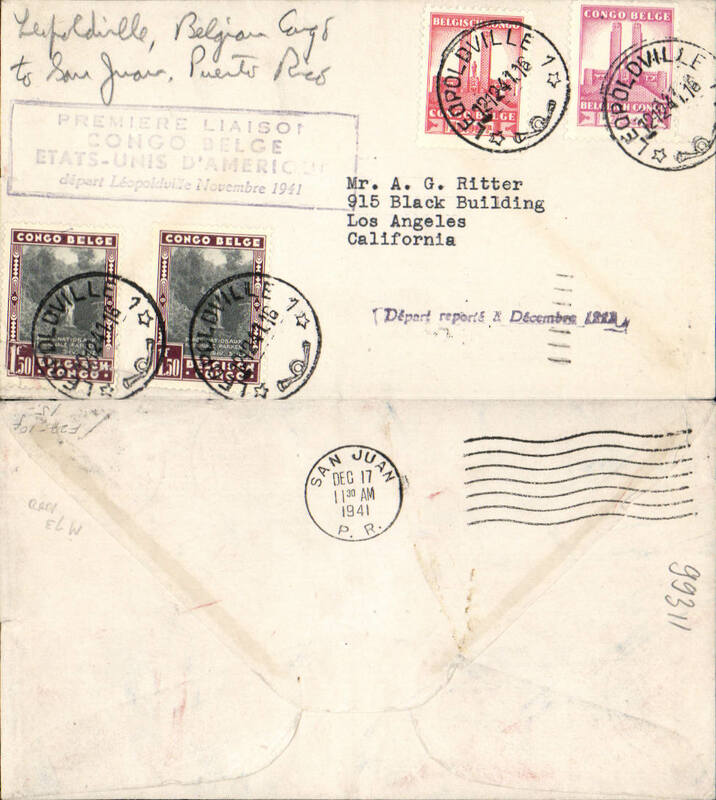 WWII dual censored mail to the USA, Leopoldville to Ohio, bs 7/4/41, via Matadi 15/10, Lisbon **Feb 42 and New York, bs 6/3/41, printed registere4d (label) commercial air cover franked 20F, typed "Bateau Portuguese jusqu'a Lisbonne/ *****par avion CLIPPERS jusqu'a New York", sealed Congo plain brown censor tape, oversealed by B&W Carribean PC90OBE 5564 censor tape. The Matadi transit stamp indicates passage by ship from that port. Germany invaded Belgium in May 1940, and the Pan Am Clipper route stated the same month. Super WWII item. WWII airmail cover from McKenzie Military Mission Leopoldville to Elizabethville via Luluabourg,b/s, non invasive ironed vertical crease,uncommon. Colonel McKenzie headed important aerial military mission to the Congo in WWII. 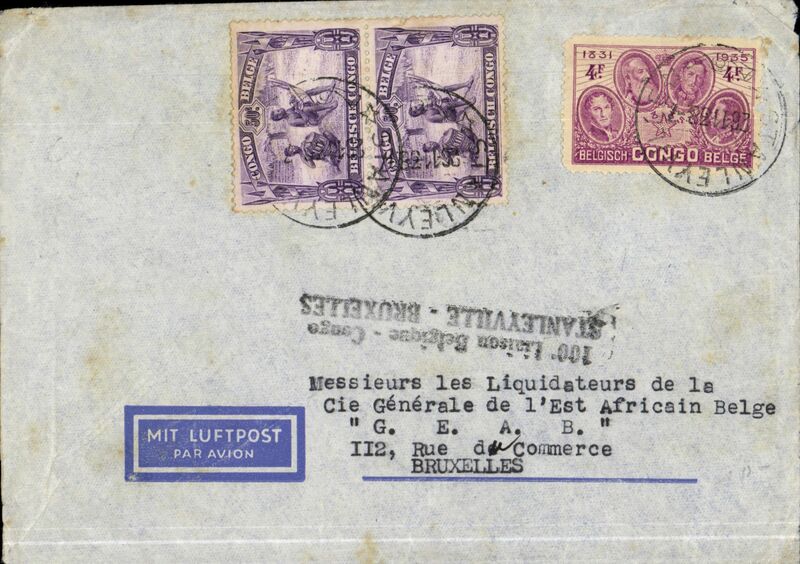 WWII censored F/F LEOPOLDVILLE TO JOHANNESBURG, Leopoldville to Durban, via Elisabethville, 15/3, high franking registered (label) commercial corner cover franked eight stamps 33F (one damaged, see scan), black framed "1er depart laison aerienne/Congo-Afrique du Sud/***** Mars 1941", large unidentified black "C.R." hand stamp verso. Scarce item. WWII uncensored F/F Leopoldville to Johannesburg, no arrival ds, high franked plain cover franked 1941 Albert Memorial set of 11 imperforate, superb strike black framed "1er depart laison aerienne/Congo-Afrique du Sud/14 Mars 1941". 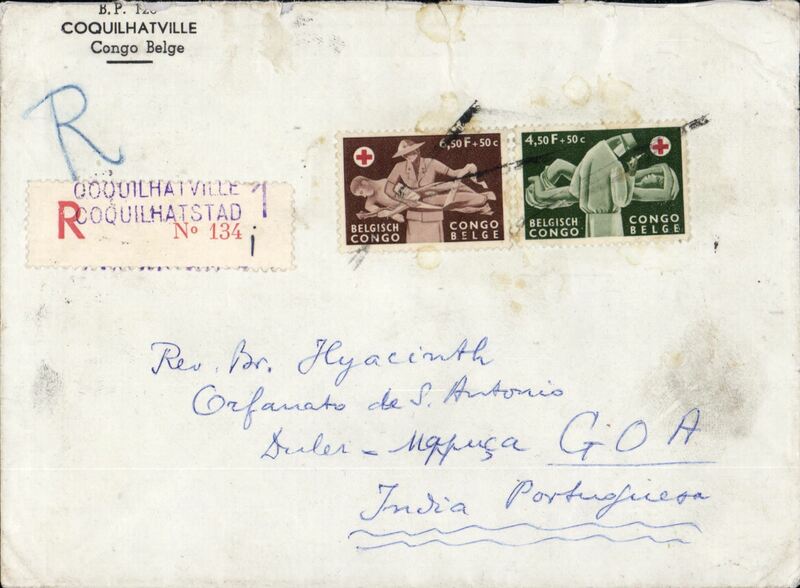 Uncommon F/F, and the first cover seen with imperforate full set which has passed through the post. Scarce item in fine condition. 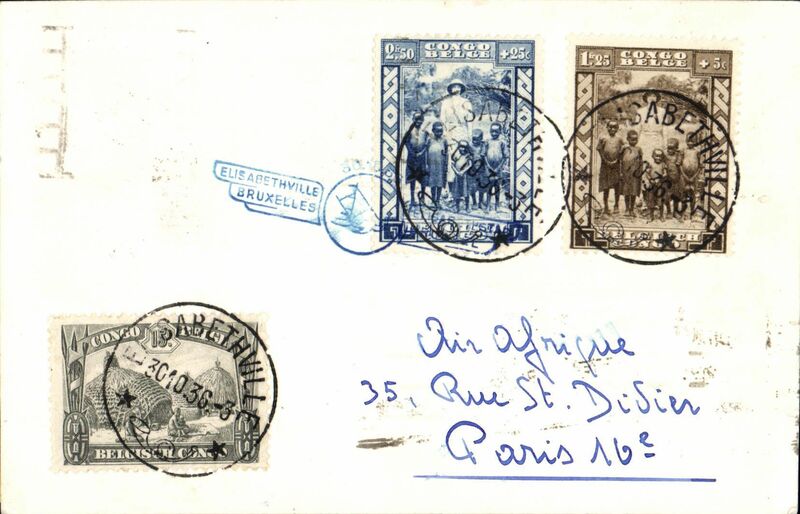 WWII censored F/F Elisabethville to Johannesburg, bs 18/3, registered (label) cover franked 10F & 1F50, nice strike black framed "1er depart laison aerienne/Congo-Afrique du Sud/14 Mars 1941", sealed South Africa red/white OBC censor tape tied by South Africa arrival cds. Scarce item in fine condition. 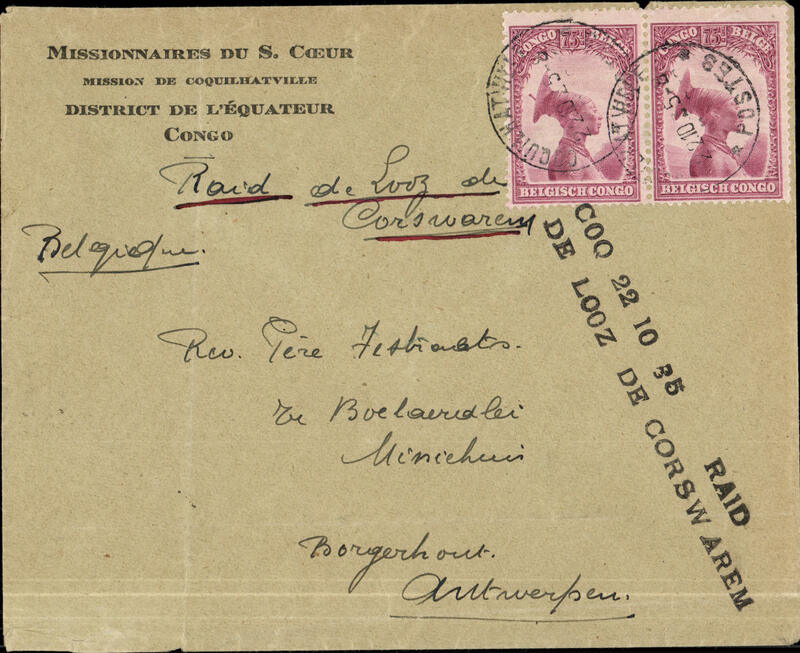 Congo to England, a flown World War II dual censored cover, Lisala to London, no arrival ds, via Sekondi, Gold Coast, 28/7 registered val ds, franked 15F 25 (4x 0.75 verso, 2 damaged by possible removal of overlying stamp see scan), ms "Via Takoradi", red "Passed Censor/7Gold Coast" censor mark, sealed B&W UK PC90 censor label (95% has been removed). 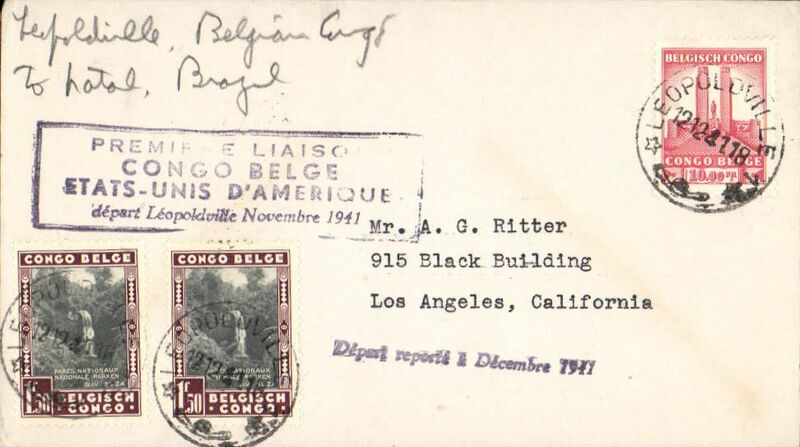 The Congo remained neutral until Gemany invaded Belgium in May 1940, after which, acting as an independent nation, it declared war on Germany and actively assisted the Allies by allowing open access to its airports and other facilities. One such outcome was to extend the internal Congo service to Lagos and Takoradi, using SABENA planes quarantined in the Congo post May 1940, thus opening a new route across Central Africa. This particular cover was carried to Takoradi on this service. It was then likely transferred to a BOAC flying boat for OAT to England on the BOAC West Africa Coast Route. Ref Boyle pp 45, 725-727. An historic WWII item. 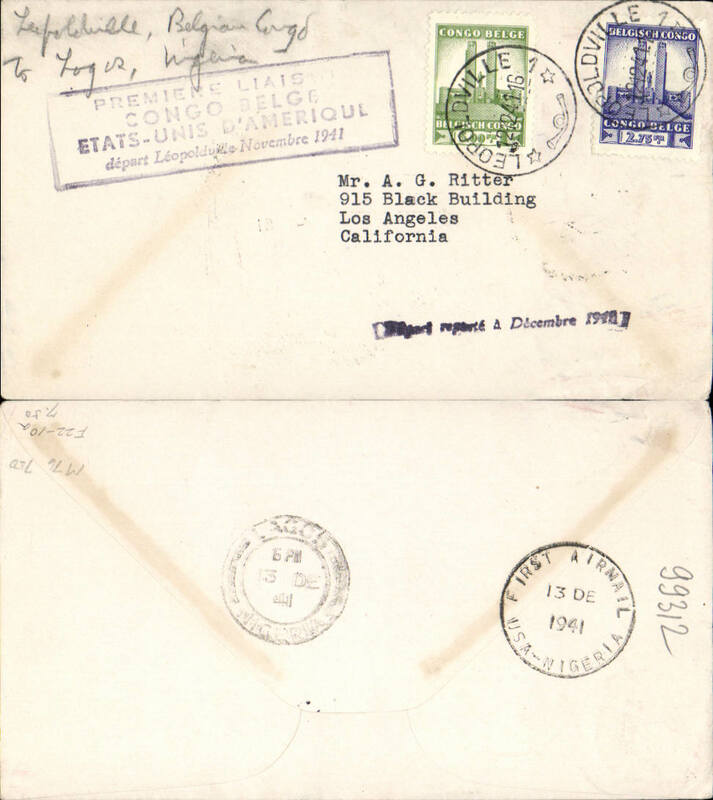 American-African Air Ferry Service, WWII, censored cover from Gombari, A.G.Mission to Springfield, MO, USA, imprint etiquette co franked 18F to include local postage and 15c airmail fee, sealed Congo censor tape. Flown before the commencement of FAM22. Likely route Sabena to Takoradi, BOAC to Bathurst via Lagos, then Atlantic Air Ferries to Miami. Uncommon and interesting item. Pan Am clipper service USA to Africa, F/F FAM 22, Leopoldville to Natal, purple cachet, b/s 17/12. This strategically important service, linking Africa and the USA, opened just at the critical time when Japan attacked Pearl Harbour and the USA went to war. Pan Am clipper service USA to Africa, F/F FAM 22, Leopoldville to Belem, purple cachet, b/s 15/12. This strategically important service, linking Africa and the USA, opened just at the critical time when Japan attacked Pearl Harbour and the USA went to war. Pan Am clipper service USA to Africa, F/F FAM 22, Leopoldville to San Juan, bs 17/12, purple cachet. This strategically important service, linking Africa and the USA, opened just at the critical time when Japan attacked Pearl Harbour and the USA went to war. 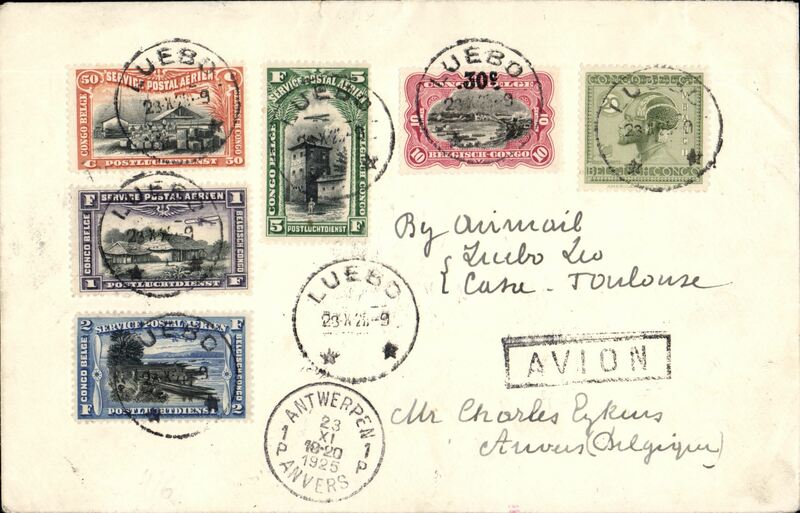 Pan Am clipper service USA to Africa, F/F FAM 22, Leopoldville to Lagos, 13/12, purple cachet. This strategically important service, linking Africa and the USA, opened just at the critical time when Japan attacked Pearl Harbour and the USA went to war. Pan Am clipper service USA to Africa, F/F FAM 22, Leopoldville to Natal, purple cachet, b/s 15/12. This strategically important service, linking Africa and the USA, opened just at the critical time when Japan attacked Pearl Harbour and the USA went to war. 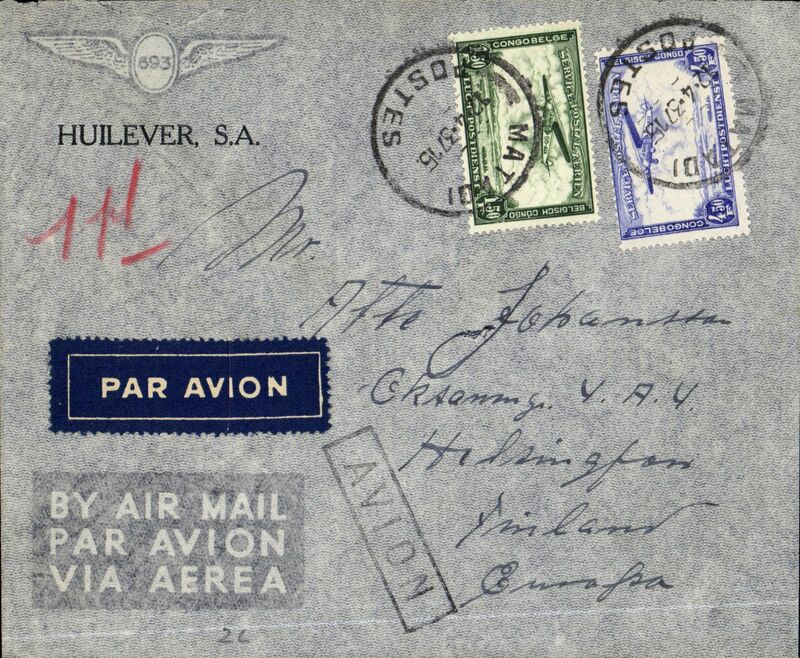 Pan Am clipper service Africa-USA, F/F FAM 22, Leopoldville to San Juan, airmail cover, cachet, b/s 17/12. This strategically important service, linking Africa and the USA, opened just at the critical time when Japan attacked Pearl Harbour and the USA went to war. Dual censored WWII cover, Pan Am FAM 22, F/F Leopoldville to Miami, bs 20/12, plain cover franked 32.50F, black framed fight cachet, sealed B&W Belgian Congo and uncommon Caribbean OB PC90 Form 167 17/12 censor tapes. 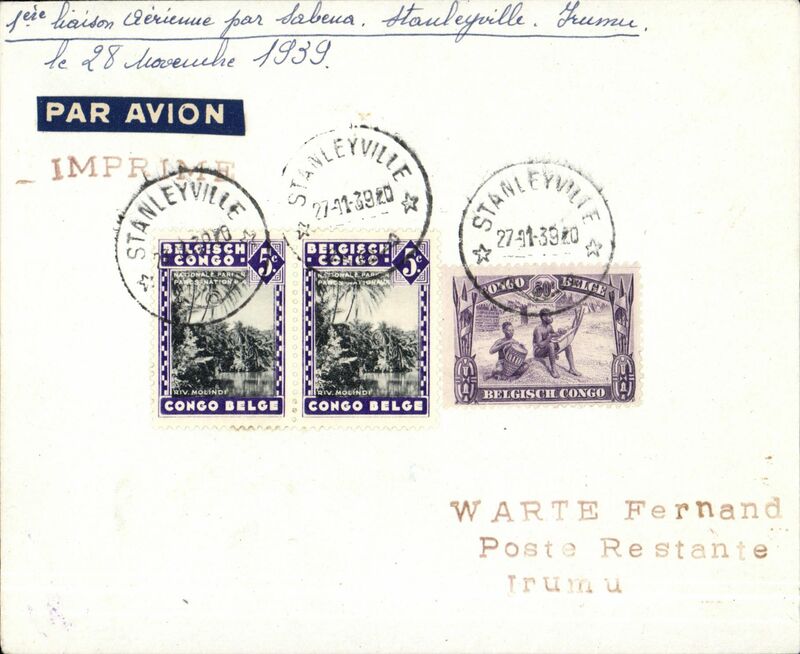 Priority registered airmail, Leopoldville to Miami, bs 16/12, carried on F/F FAM 22 clipper service to Africa, registered (label) cover, 13x9cm, franked 1941 Memorial set of 11, large purple 'depart Novembe 1941', and straight line 'Depart reporte Decmbre 1941' cachets. Mail to Miami usually had a 20/12 arrival ds, so was priority given to registeed mail?. Interesting. 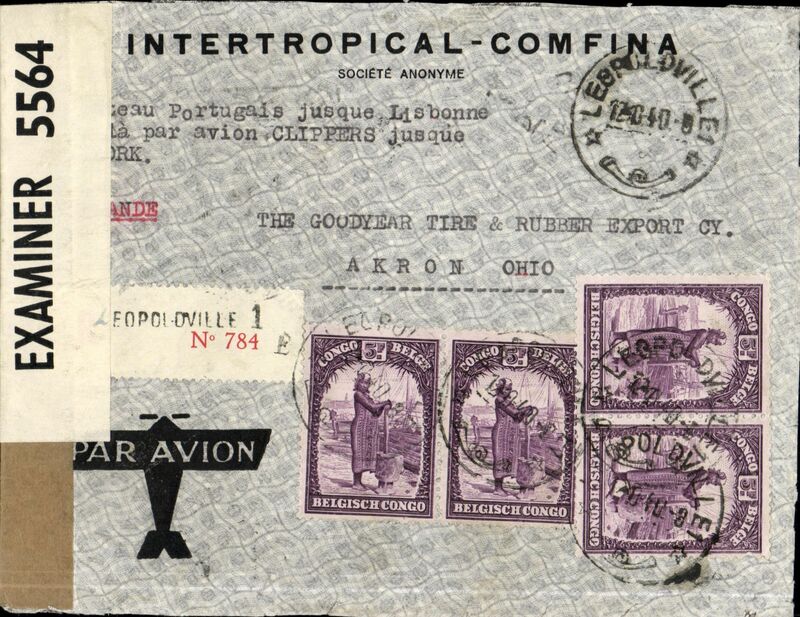 Pan Am clipper service to Africa, F/F FAM 22, Leopoldville to Miami, large purple cachet, b/s. This strategically important service, linking Africa and the USA, opened just at the critical time when Japan attacked Pearl Harbour and the USA went to war. 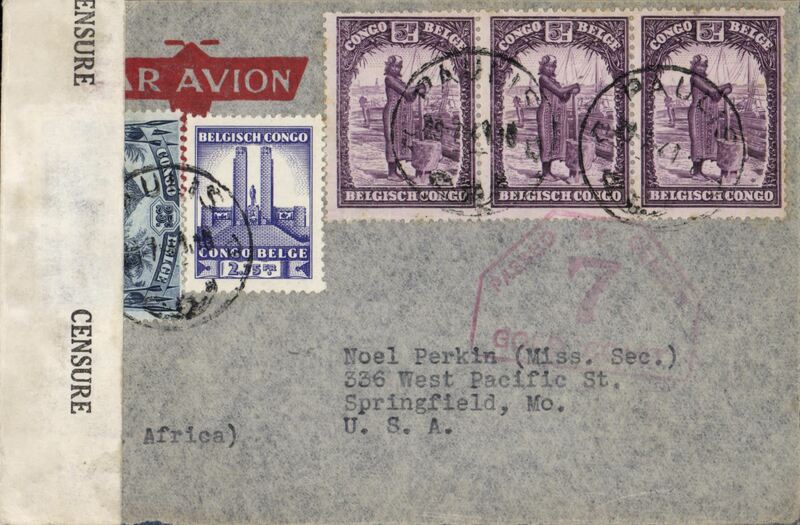 Pan Am clipper service to Africa, F/F FAM 22, Leopoldville to Port of Spain, large purple cachet, b/s. This strategically important service, linking Africa and the USA, opened just at the critical time when Japan attacked Pearl Harbour and the USA went to war. Pan Am clipper service to Africa, F/F FAM 22, Leopoldville to Bathurst, large purple cachet, b/s. This strategically important service, linking Africa and the USA, opened just at the critical time when Japan attacked Pearl Harbour and the USA went to war. 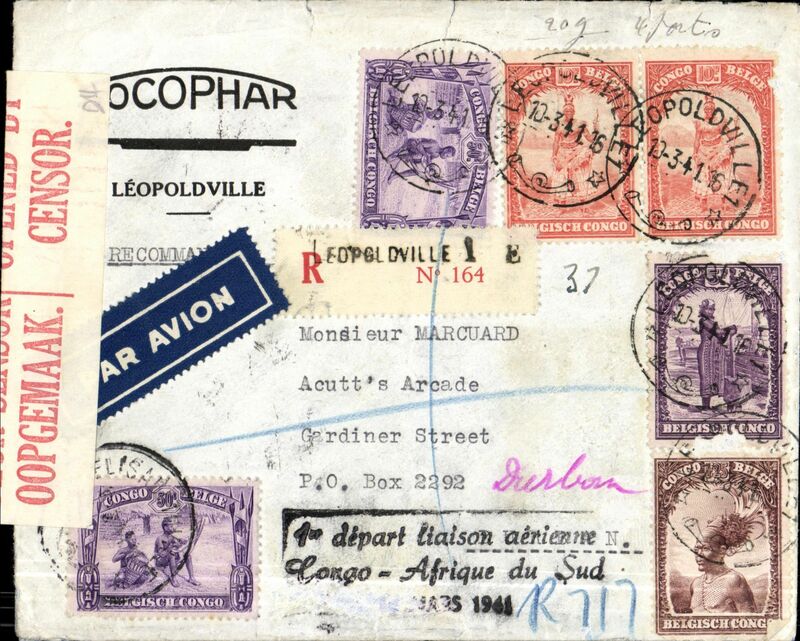 Pan Am clipper service to Africa, F/F FAM 22, Leopoldville to Lagos, large purple cachet, b/s. This strategically important service, linking Africa and the USA, opened just at the critical time when Japan attacked Pearl Harbour and the USA went to war. 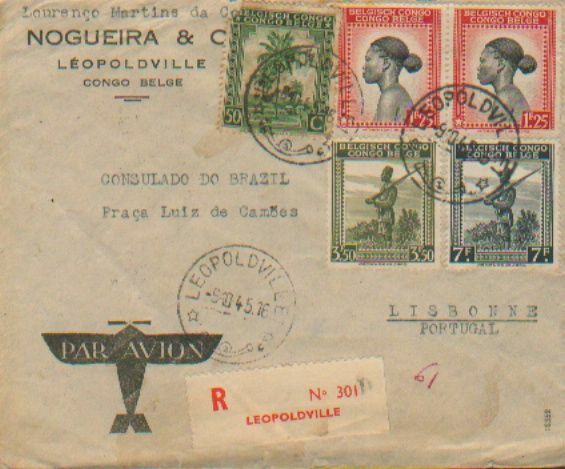 Pan Am clipper service to Africa, F/F FAM 22, Leopoldville to Belem, large purple cachet, b/s. This strategically important service, linking Africa and the USA, opened just at the critical time when Japan attacked Pearl Harbour and the USA went to war. Pan Am clipper service to Africa, F/F FAM 22, Leopoldville to San Juan, large purple cachet, b/s. This strategically important service, linking Africa and the USA, opened just at the critical time when Japan attacked Pearl Harbour and the USA went to war. 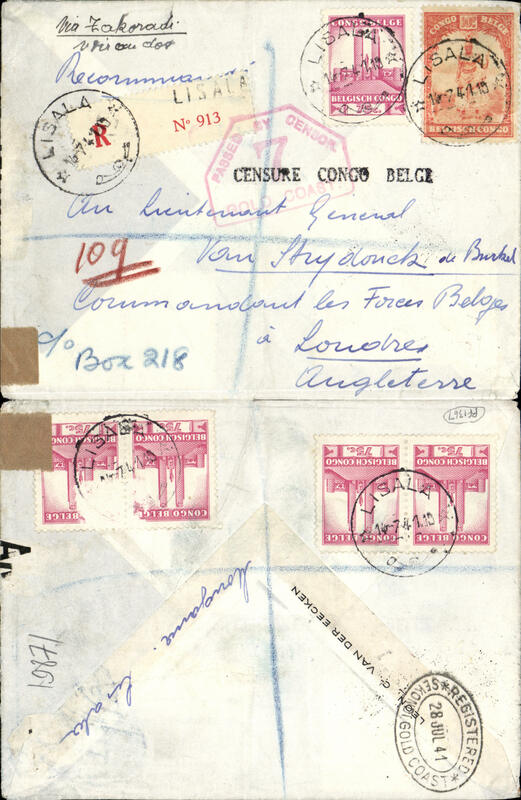 Late WWII censored airmail, Leopoldville to Brussels and also redirected within Brussels, 1F PSC with additional 6F, canc Leopoldville cds, Brussels 5-3-45 cds on front (this may be the redirection date), red hexagonal crown 'Passed't 175' UK censor mark, ms 'Avion' and black boxed 'Avion' hs. The SABENA Congo-Europe service did not restart until July 1945. 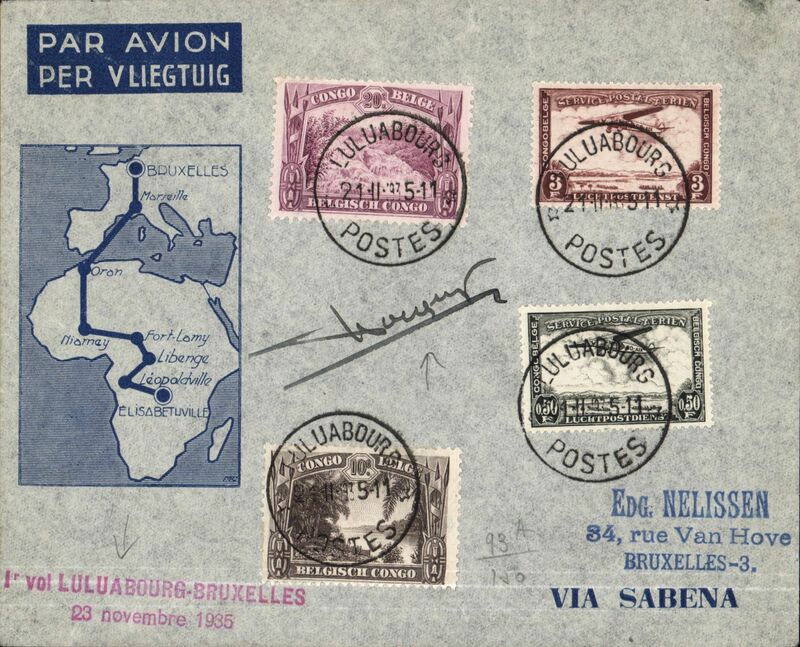 Using planes quarantined in the Congo post May 1940, SABENA opened an extension to Lagos and Takoradi. It is most likely this card was carried to Takoradi on this service, where it was transferred to a BOAC flying boat for OAT to England on the BOAC West Africa Coast Route. Ref Boyle pp 45, 725-727. Interesting. 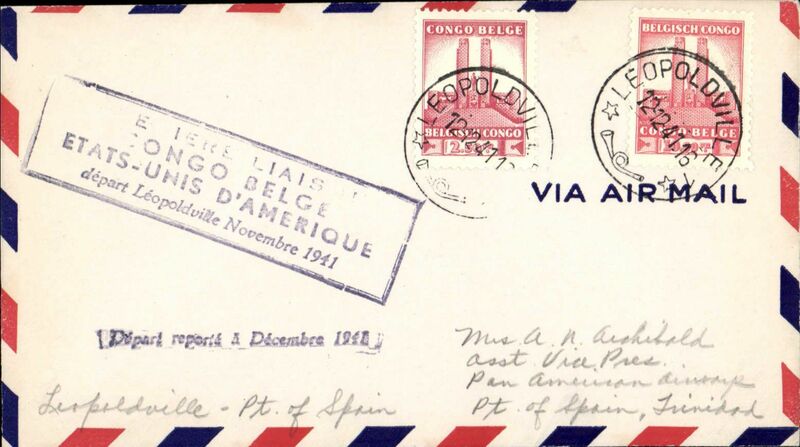 WWII consular air cover, Leopoldville to Lisbon, bs, rated 14F. 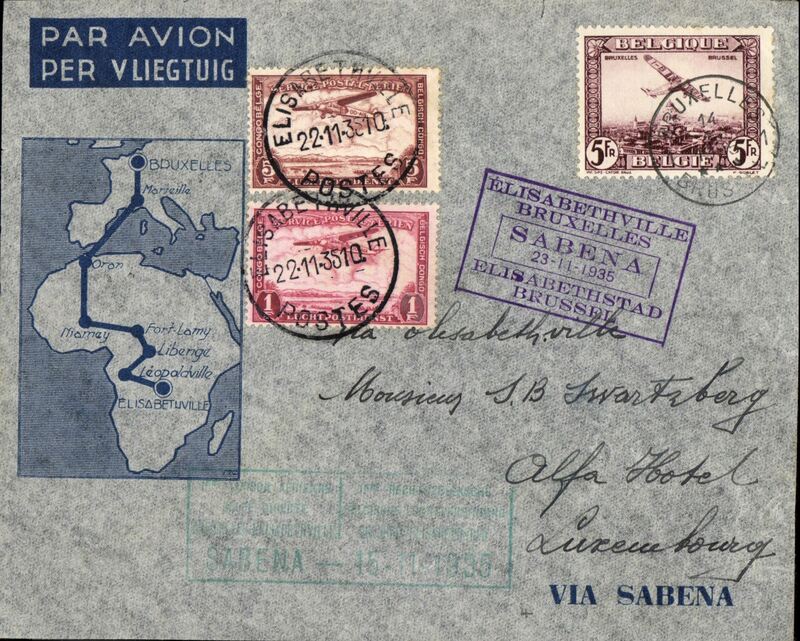 Sabena, first return flight accelerated Leopoldville-Brussels, bs 1/3, attractive red/blue/pale grey registered (label) 'Cercle Philatelique du Congo Belge et Ruanda Urundi' souvenir cover franked 8F50, 1/3/27 arrival ds on front, sent by the President of the Cercle Philatelique. 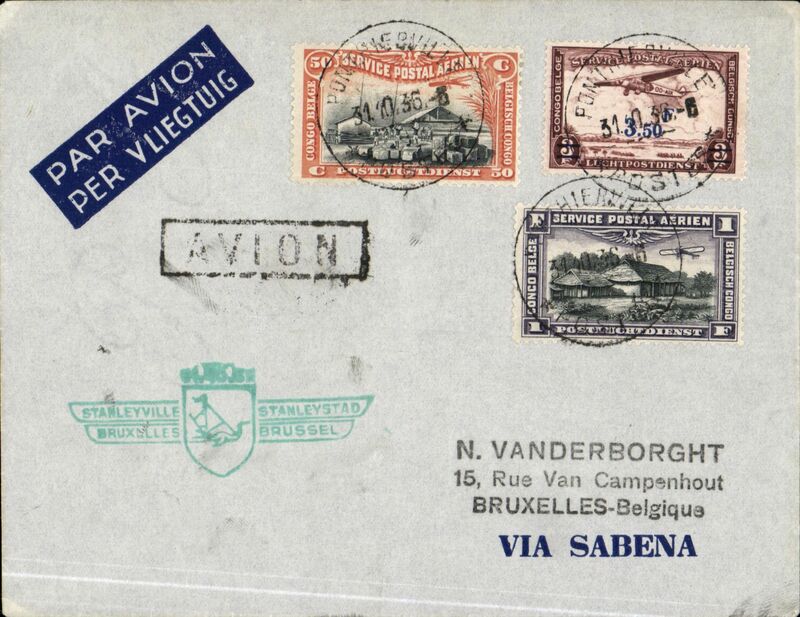 F/F in 25 hours, Leopoldvile to Brussels 28/2, attractive souvenir cover franked 7F50, sabena. 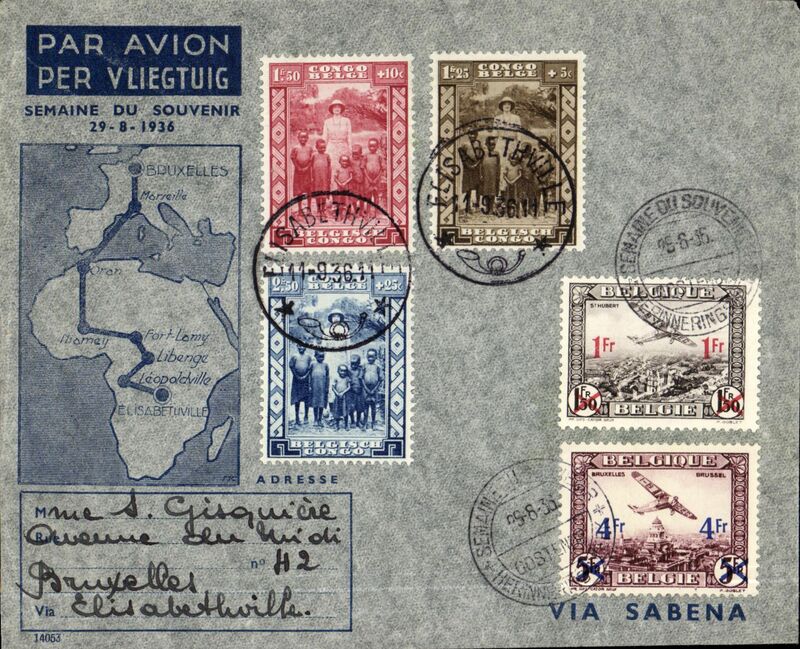 Sabena, first return flight accelerated Leopoldville-Brussels service, red/blue/pale grey registered (label) 'Cercle Philatelique du Congo Belge et Ruanda Urundi' souvenir cover franked 12F50, 1/3/27 arrival ds on front, sent by the President of the Cercle Philatelique. 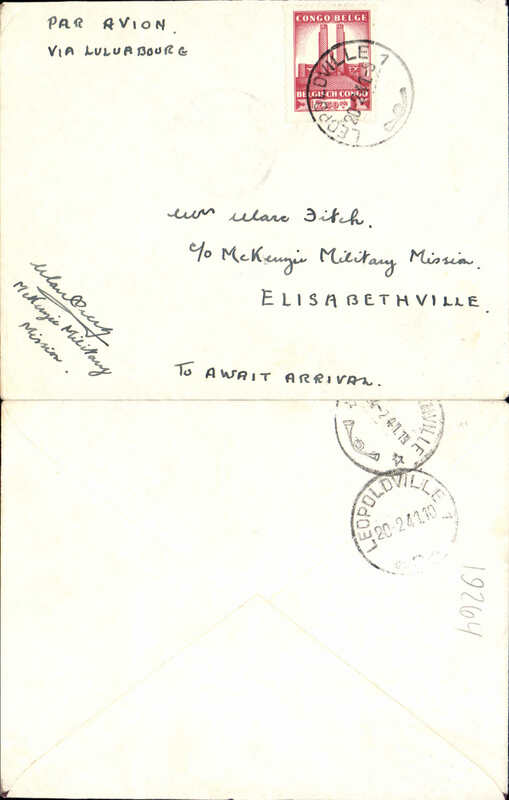 Personal airmail, Elizabethville to Tripoli, no arrival ds, specially printed card addressed to Radio 5AITA, Tripoli, ms "Par Avion", franked 7F 40c, canc Elizabethville cds, sent by an American clergyman at the Presbyterian Congo Mission. He was a keen radio ham and sent this card to report having picked up a transmission from Tripoli. In this environment, 45 years ago, wireless was an important means of person to person contact. 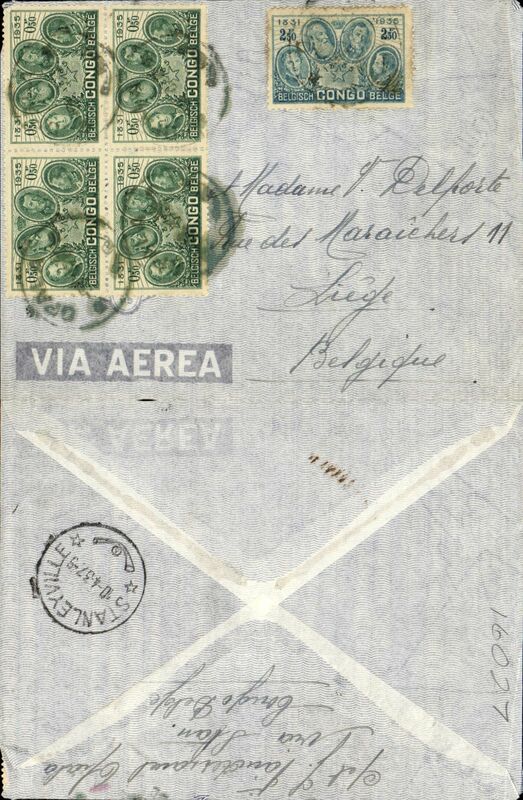 Coquilhatville to Mapuga, Portuguese Goa, bs 28/5, via Cairo Aerodrome 22/5 and Goa 27/5, registered (label) corner cover corner, franked 11F, departure date tamp unclear. Great routing, cover a little grubby.